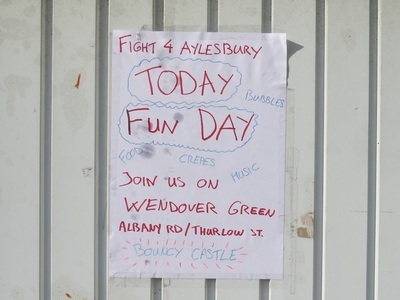 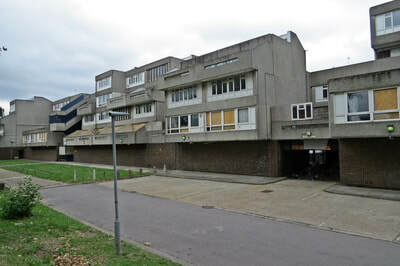 The Aylesbury Estate built between 1963 and 1977 contains over 2,700 dwellings with approx 7500 residents spread over a number of different blocks and buildings designed to house a population of roughly 10,000 residents, making it one of the largest public housing estates in Europe. 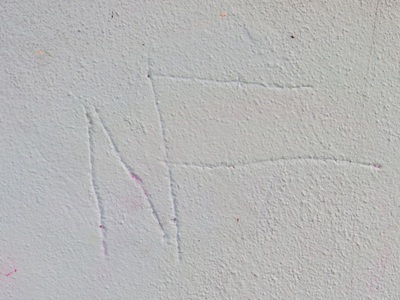 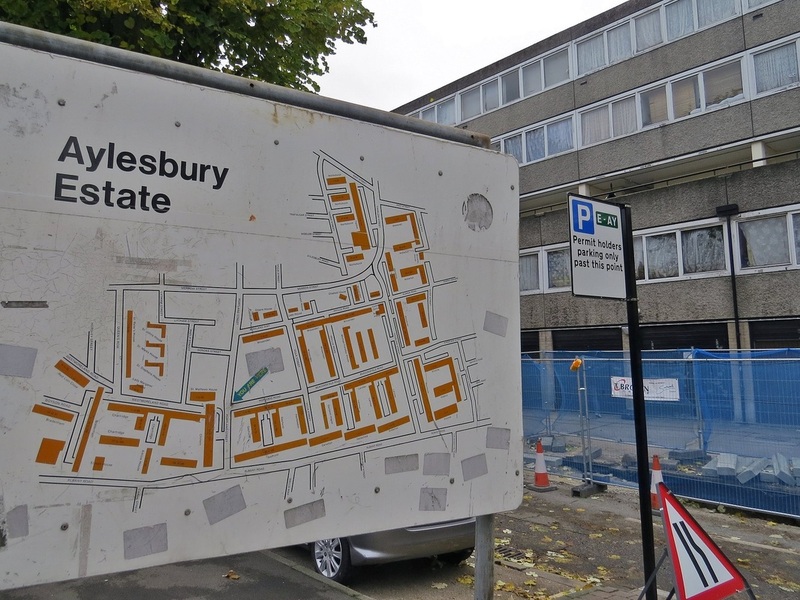 Rapper Tinie Tempah grew up on the Aylesbury Estate. 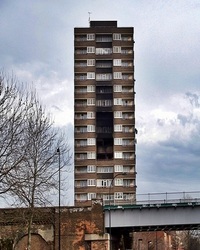 Tony Blair made his first speech as Prime Minister here, in an effort to demonstrate that the government would care for the poorest elements of society. 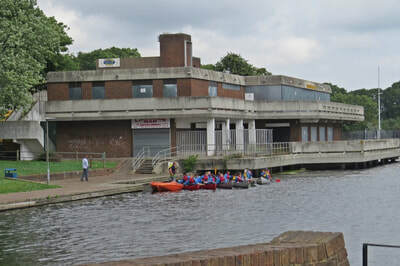 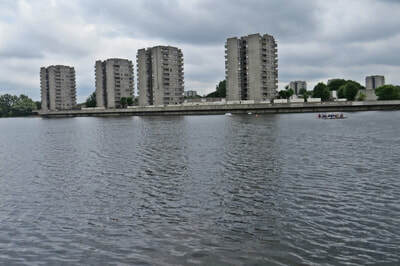 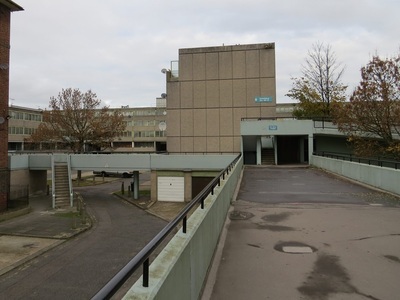 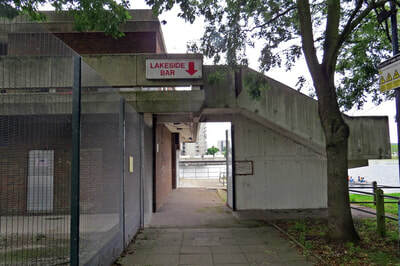 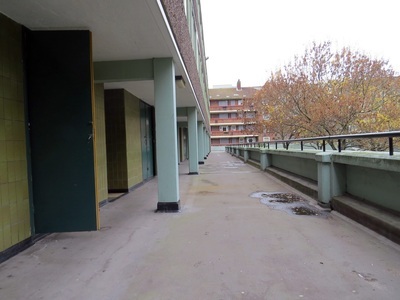 The estate has featured in many television shows including The Bill, Spooks, and a Channel 4 ident, in which the balconies and floating concrete structures shift to in to place forming the shape of the Channel 4 logo. 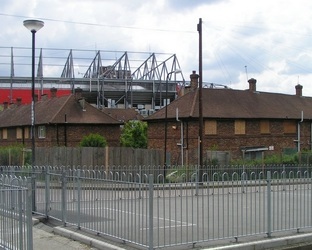 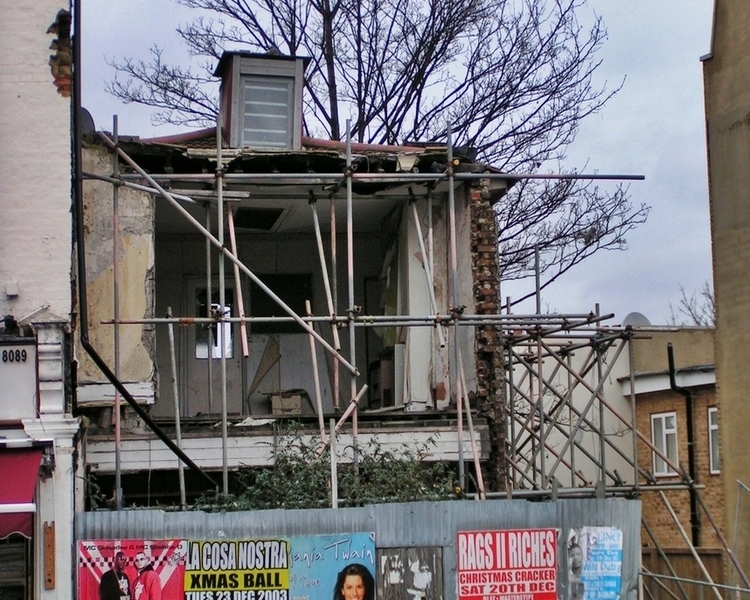 The London Borough of Southwark decided that rather than updating the estate to basic living standards they would order its demolition and replace the dwellings with modern houses controlled by a housing association.This was despite the fact that the tenants in 2001 had voted overwhelmingly against a sale of the estate to a housing association. 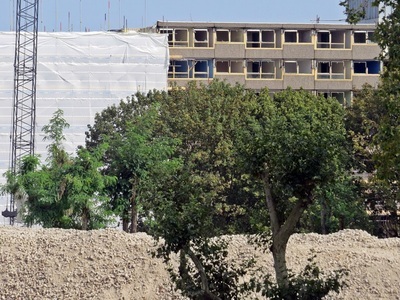 The plan involves increasing the density of housing from the current 2,700 units to 4,900. 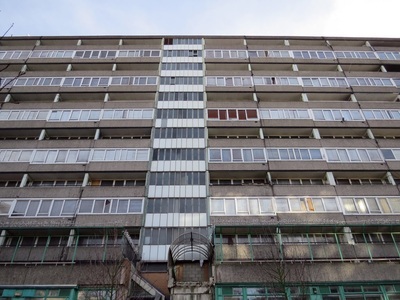 2,288 units would remain social housing and the remainder would be for sale. 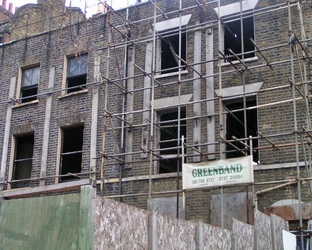 The sale of these units is planned to fund the whole scheme. 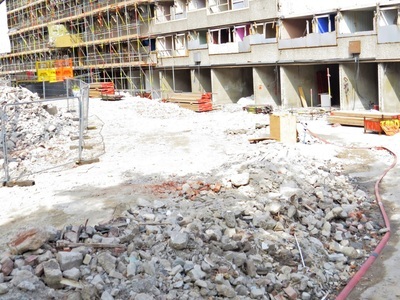 Demolition and rebuilding has been divided into several phases over 20 years. 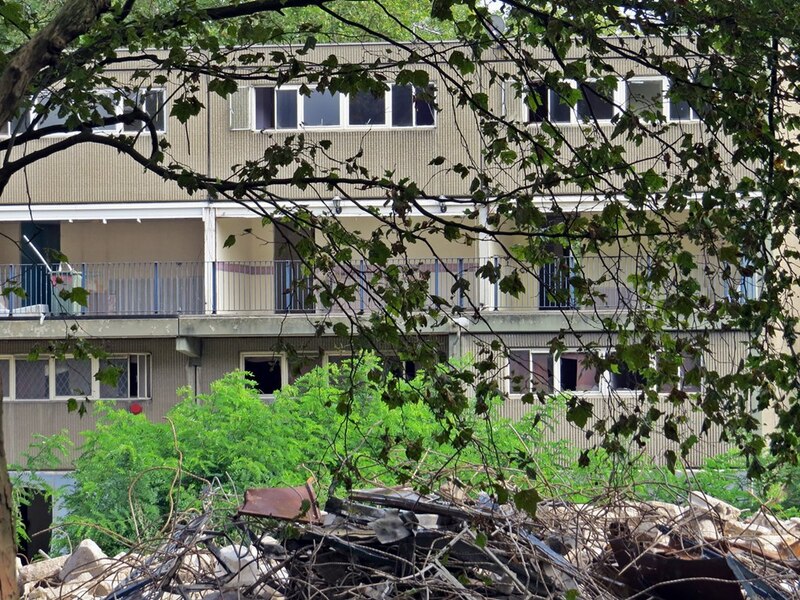 One phase of a few blocks has mostly been vacated ahead of their demolition, but still house about 30 tenants and leaseholders, as well as squatters. 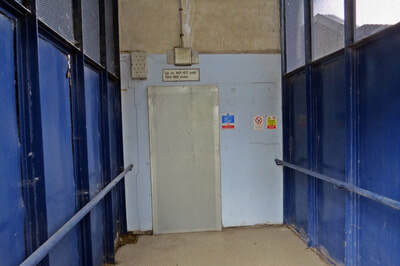 The blocks have been enclosed with large hoardings of wood and metal spikes. 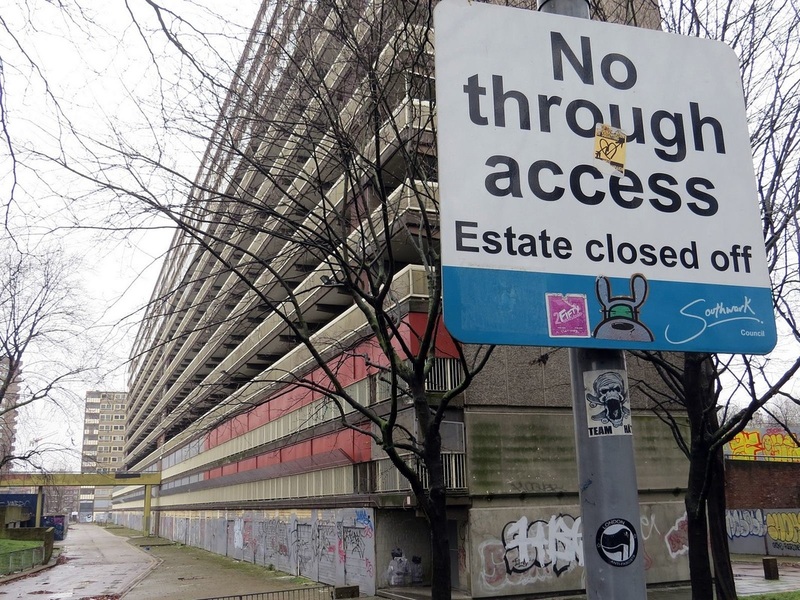 Some residents are not too chuffed that they are now only allowed to enter or leave their estate at a single exit, which is manned by private security officers with dogs. 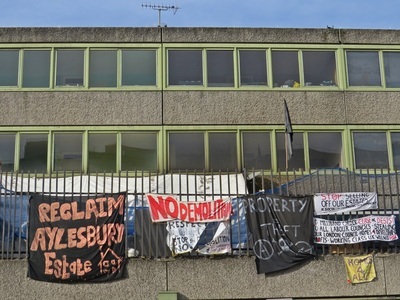 Activists staging an occupation on the estate recently dumped rubble from smashed up flats in the foyer of Southwark Council's offices near Tower Bridge. 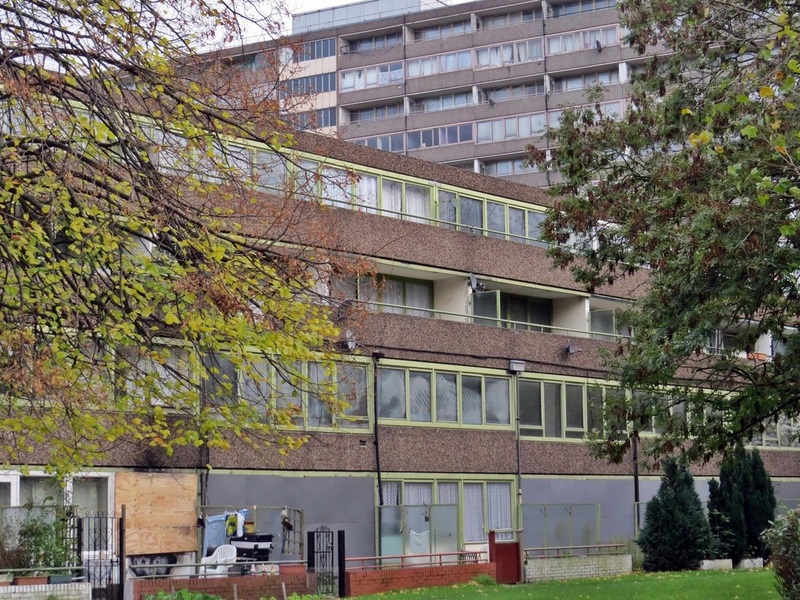 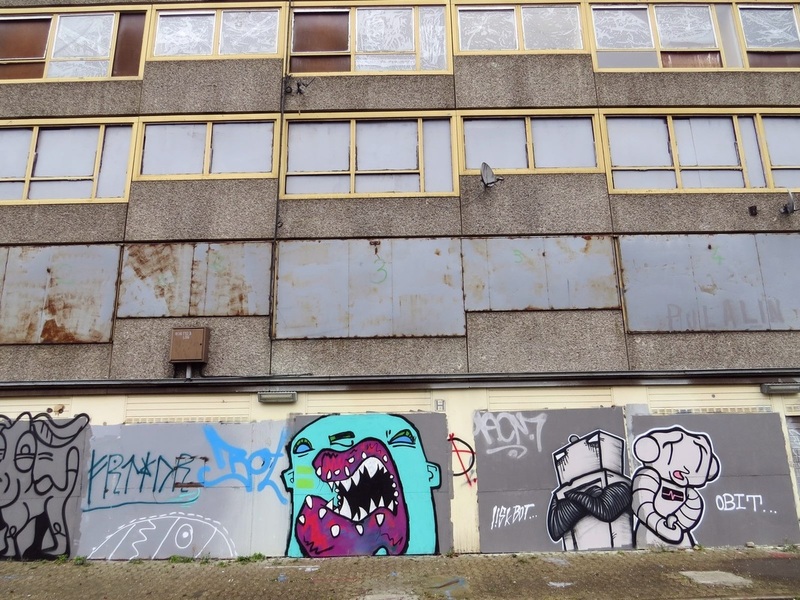 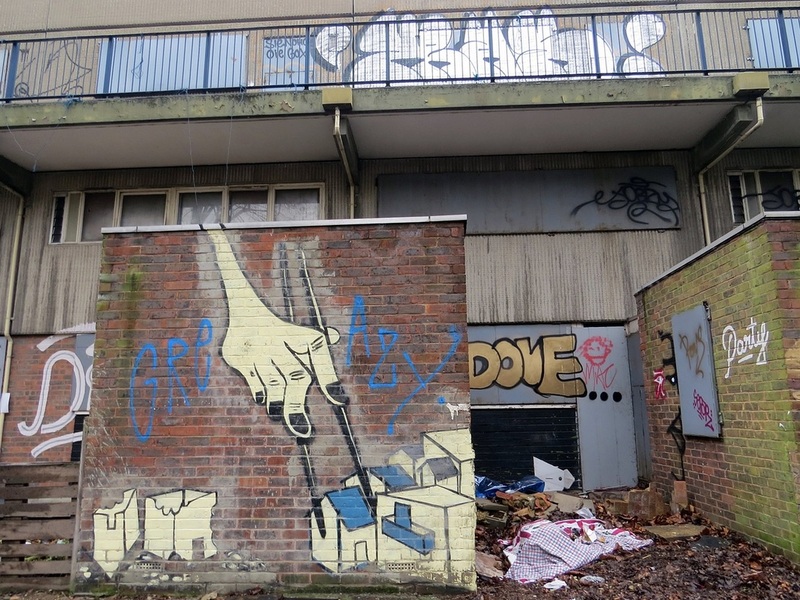 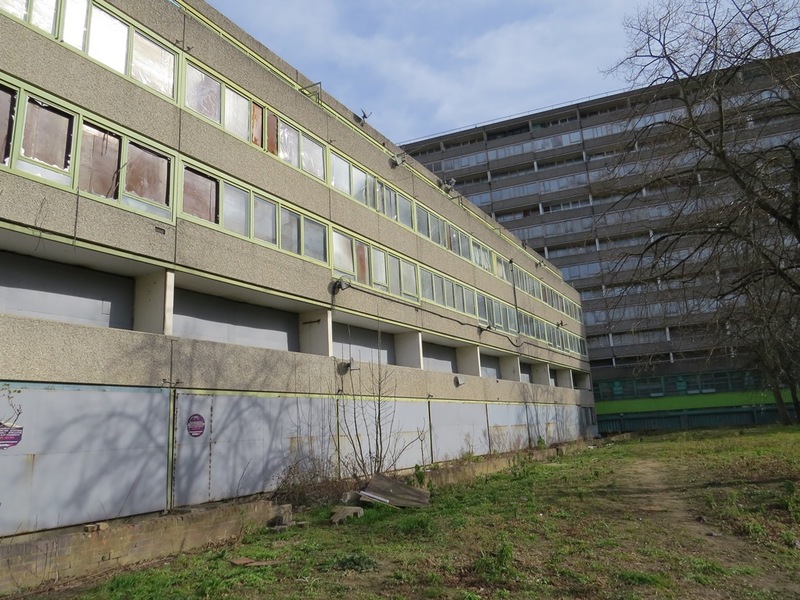 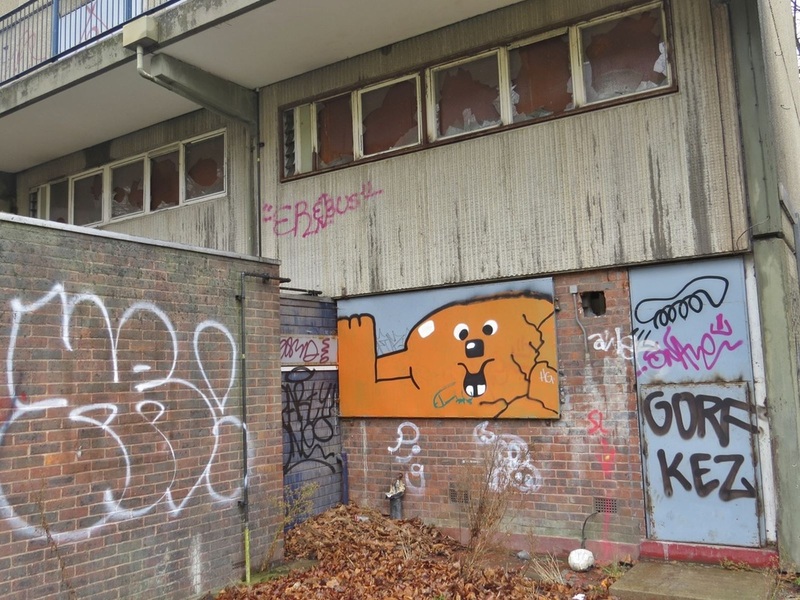 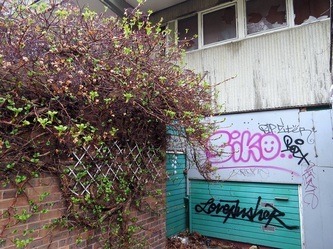 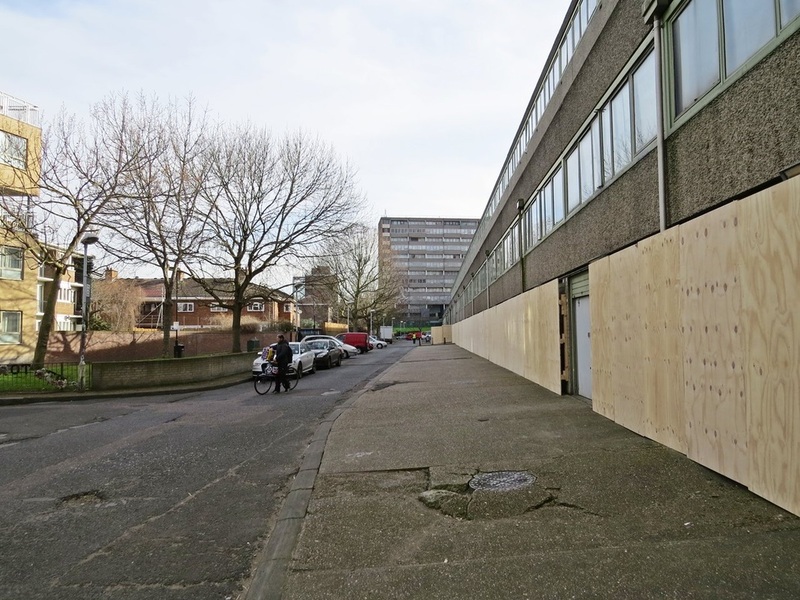 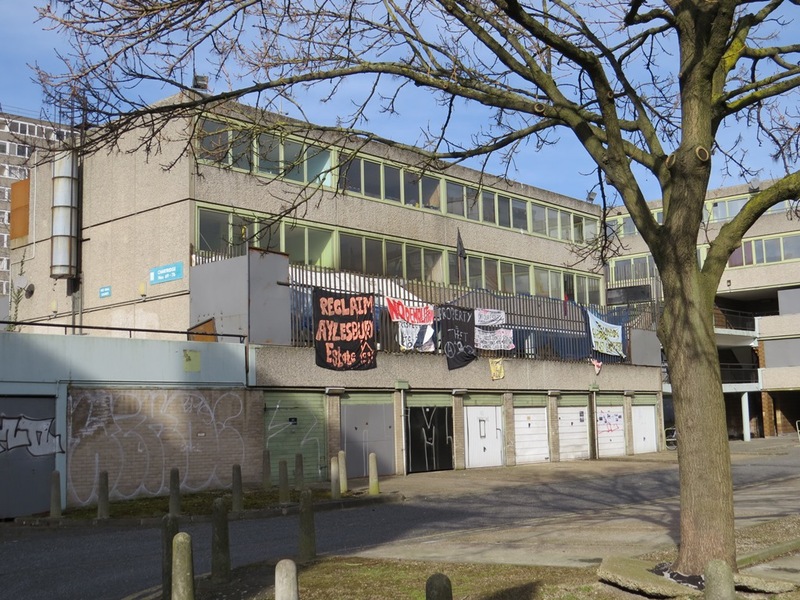 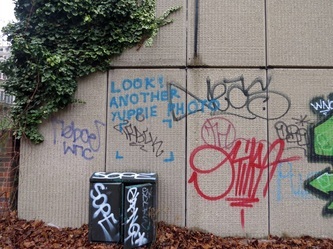 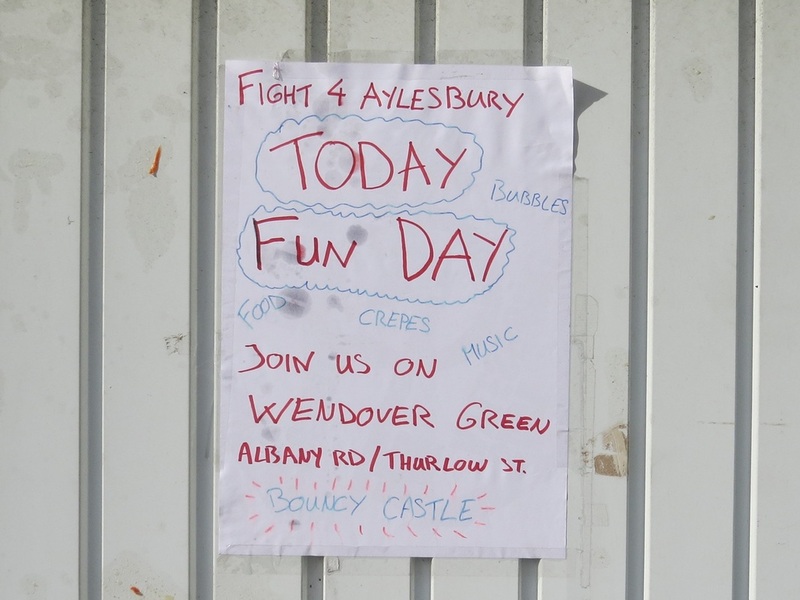 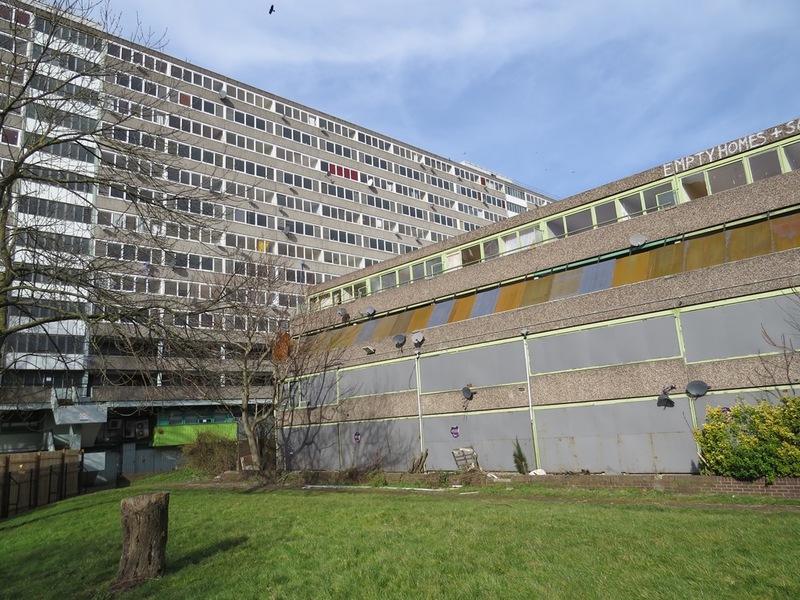 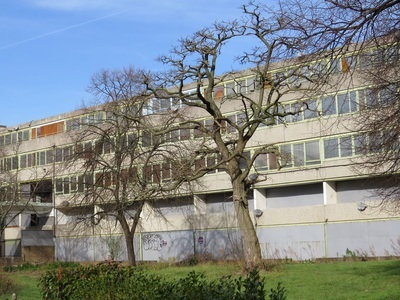 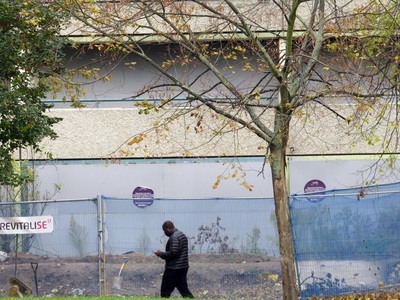 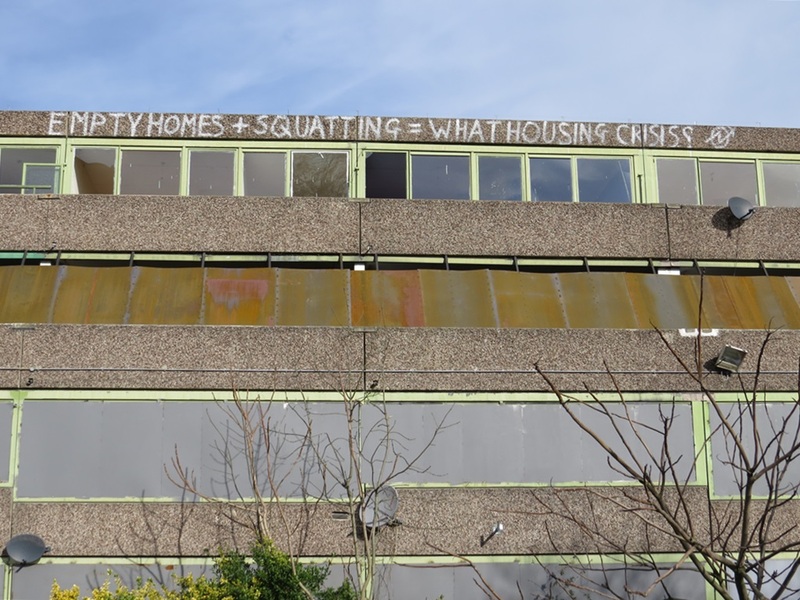 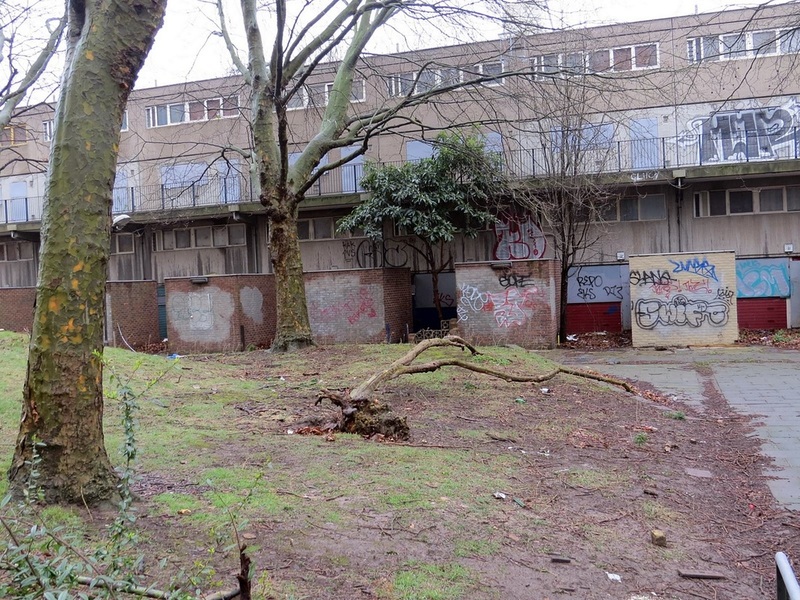 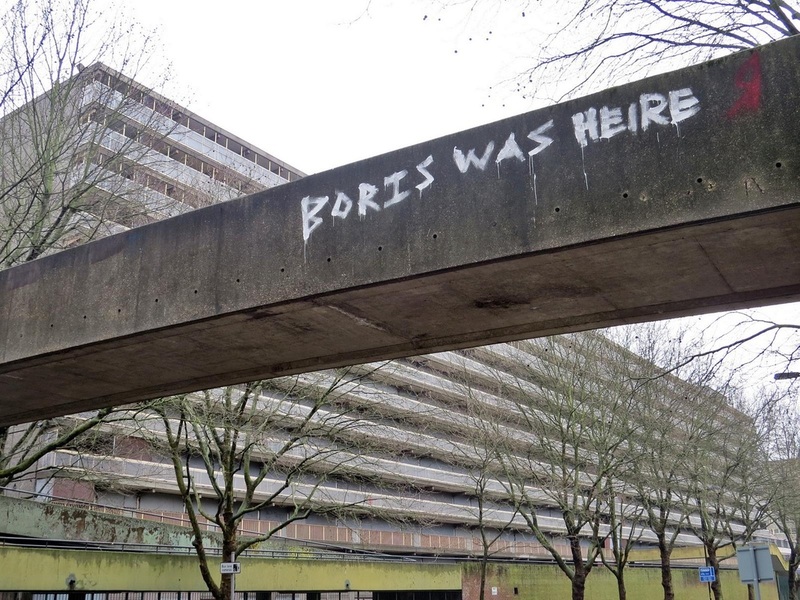 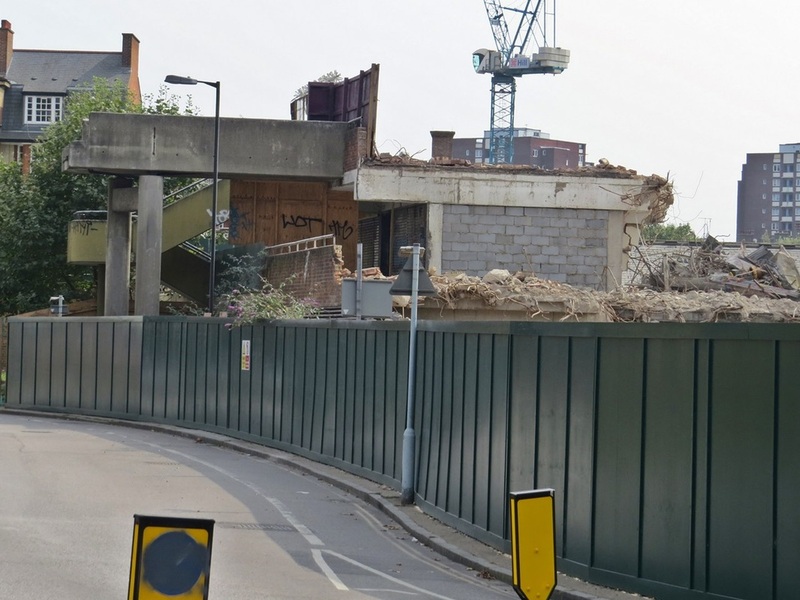 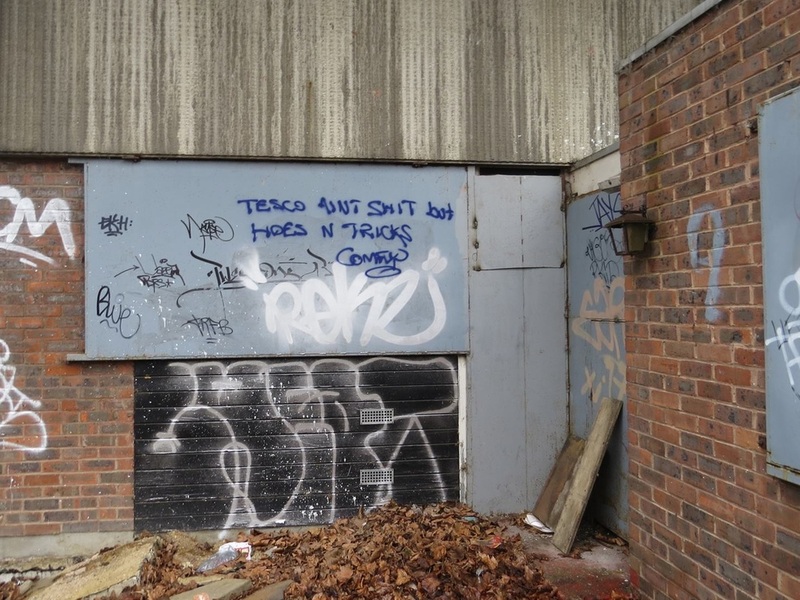 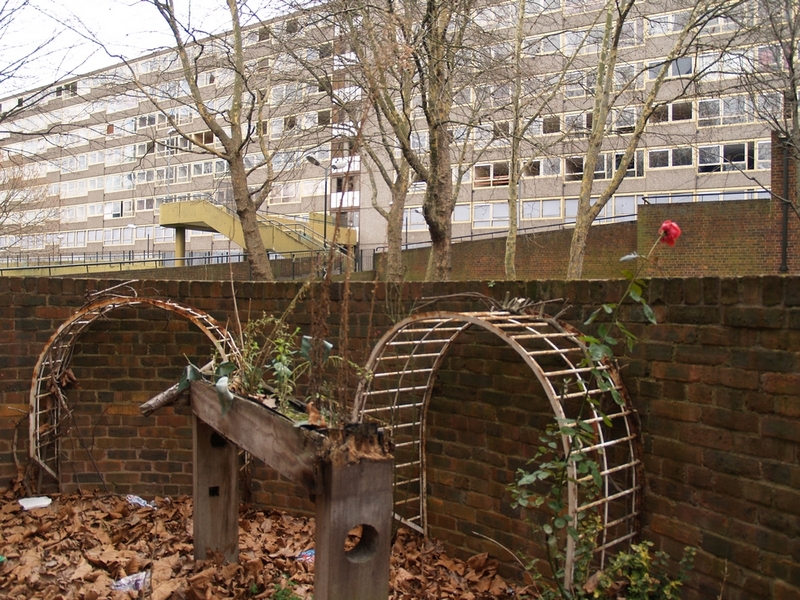 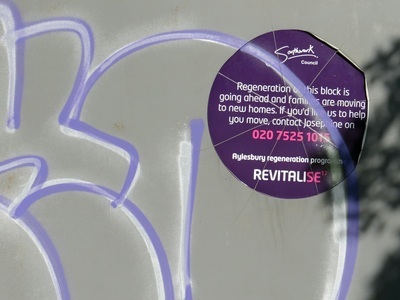 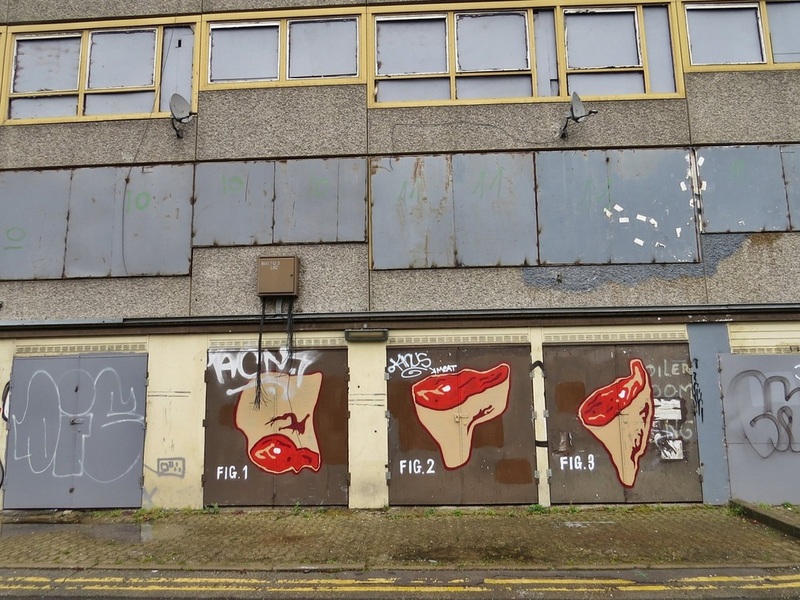 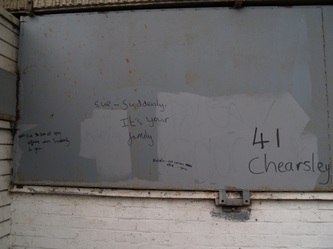 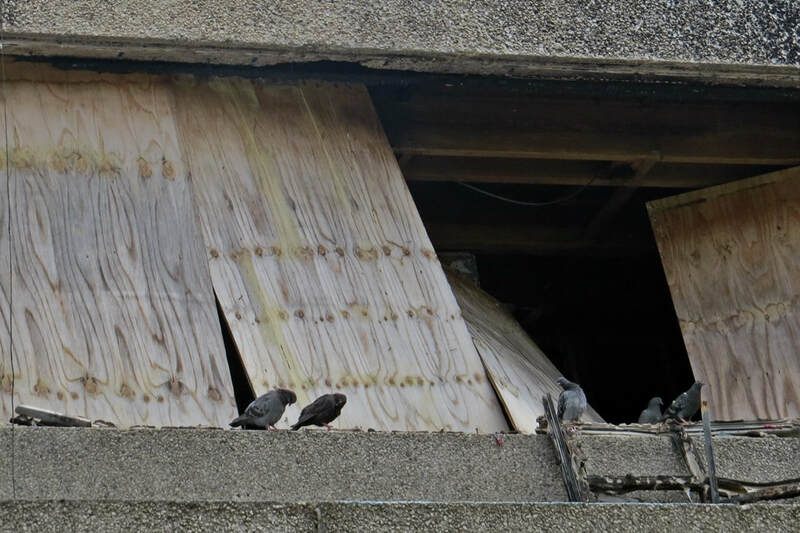 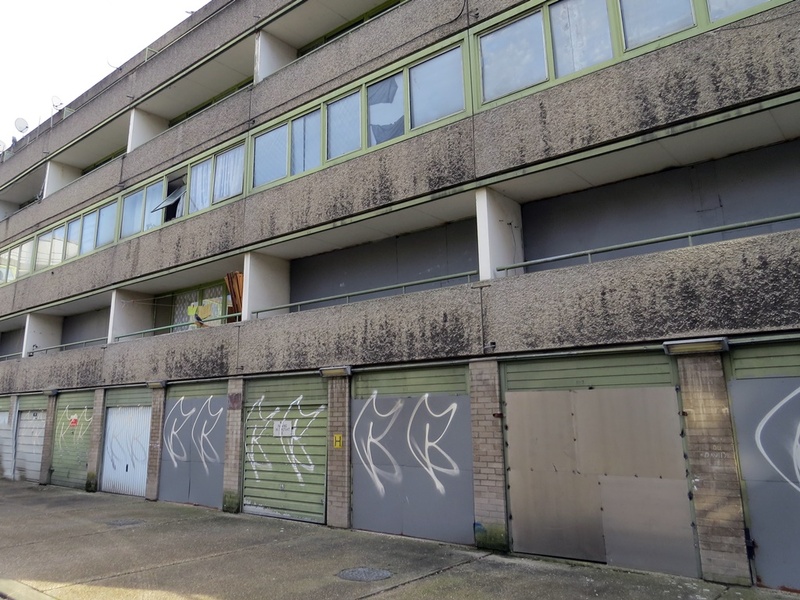 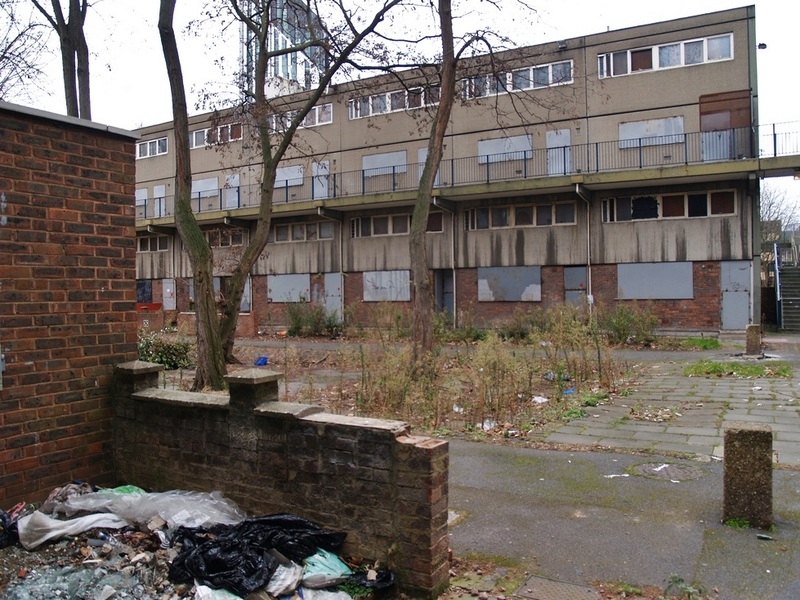 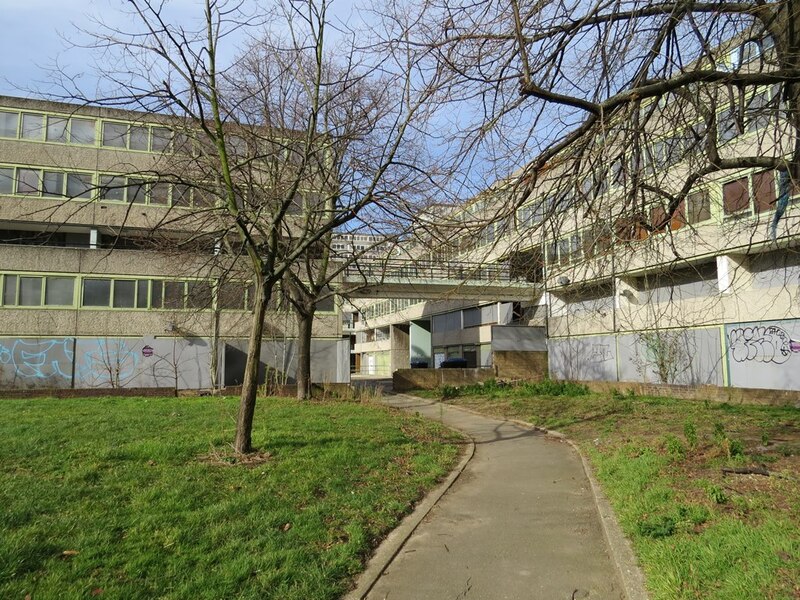 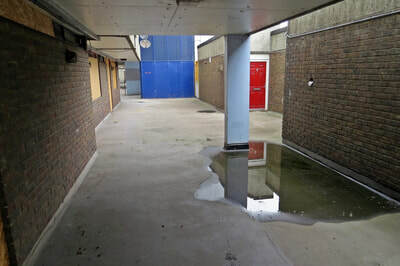 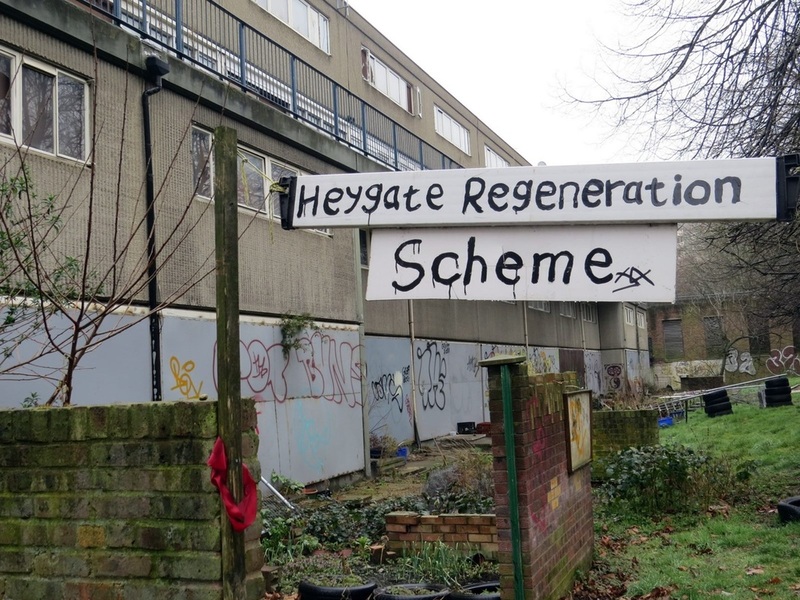 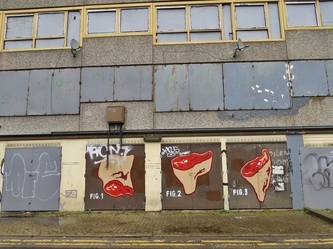 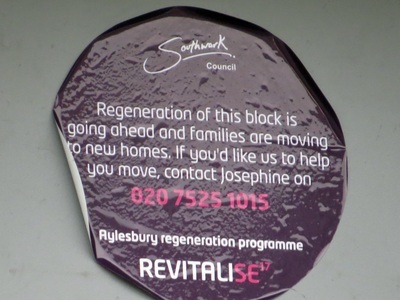 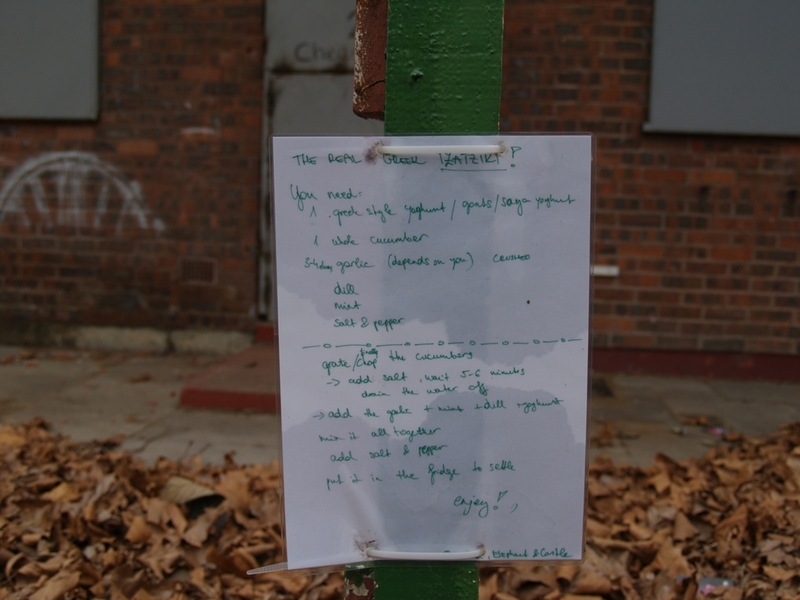 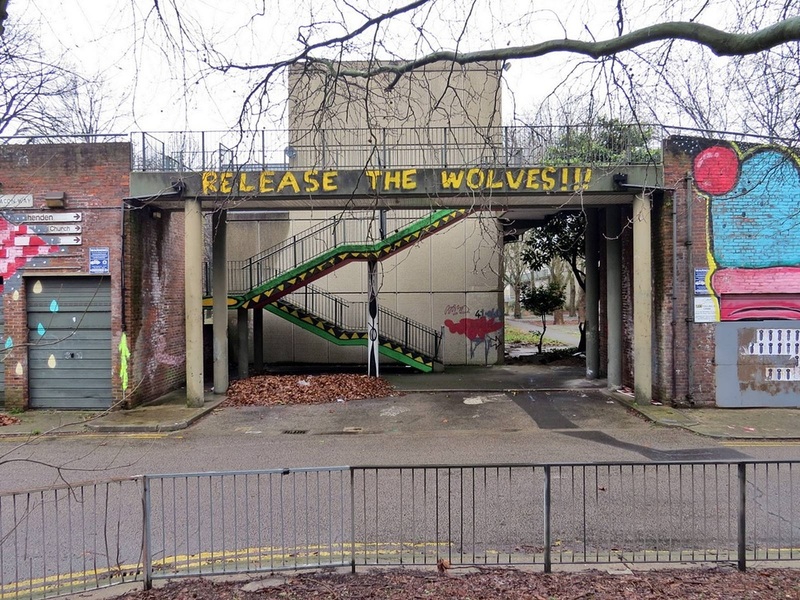 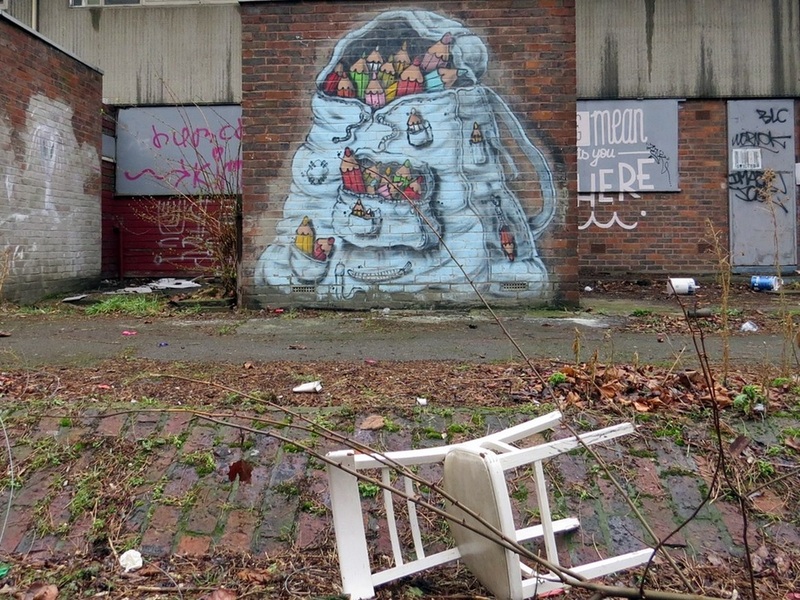 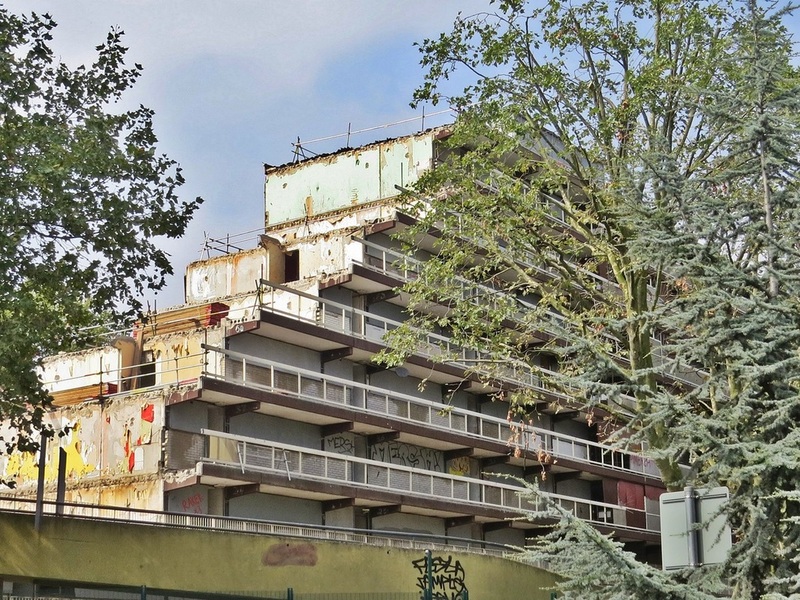 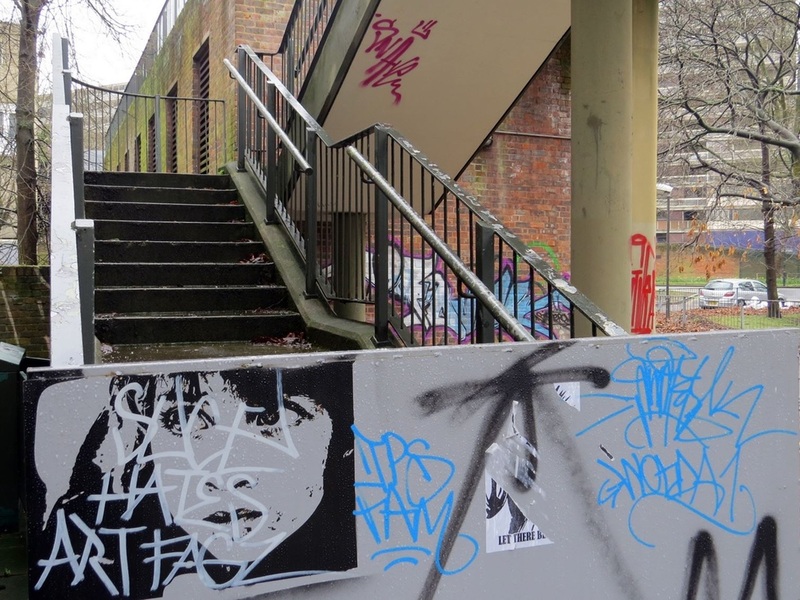 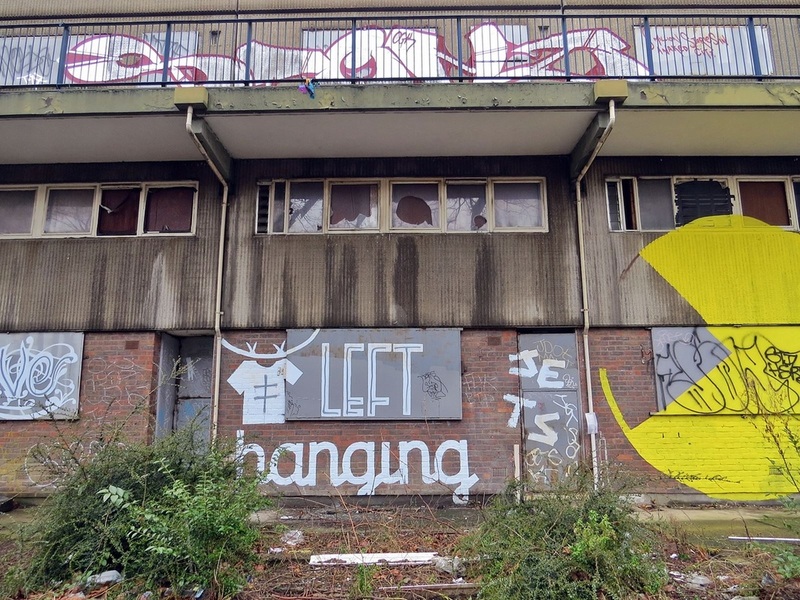 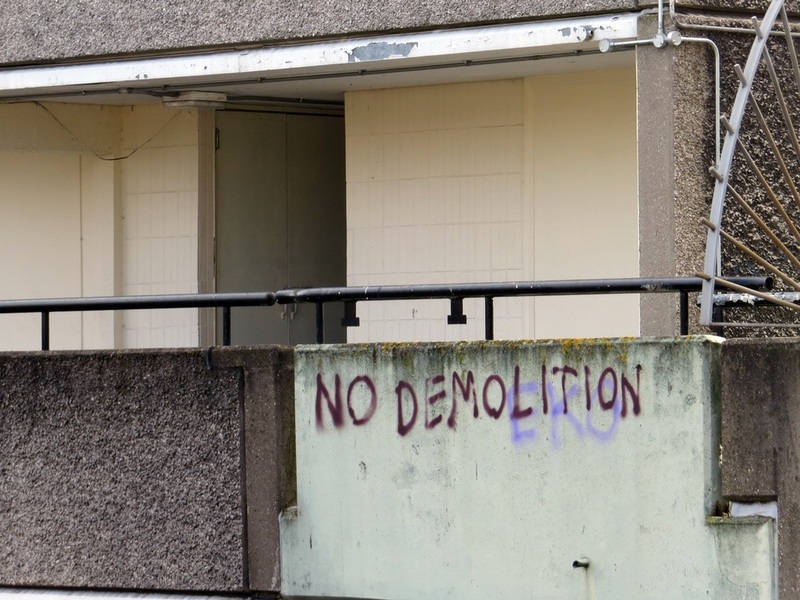 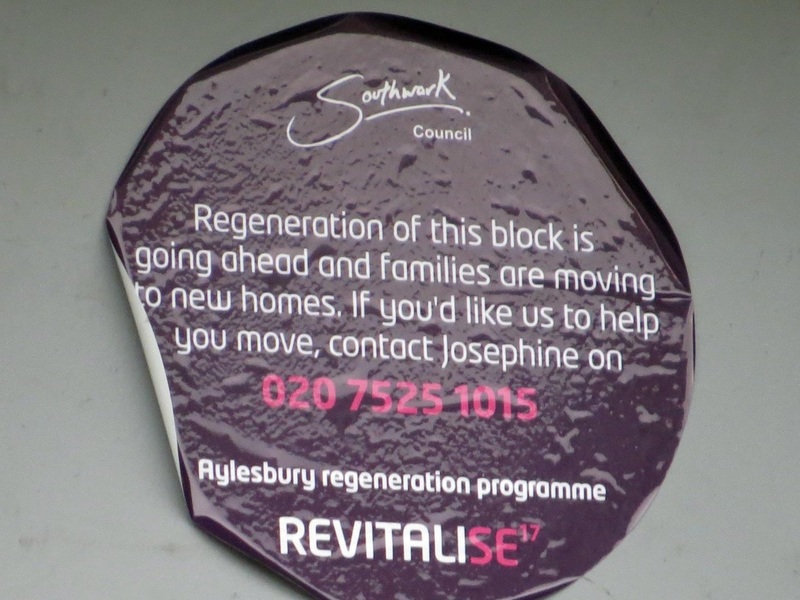 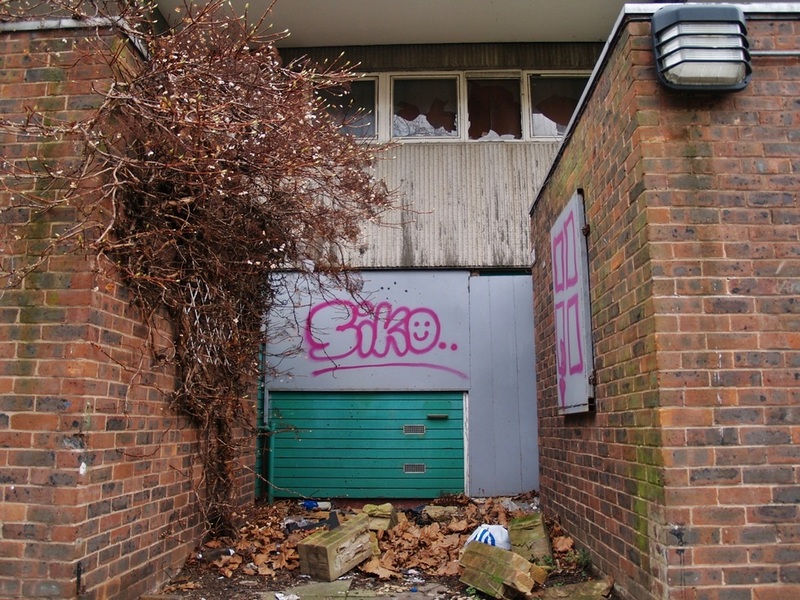 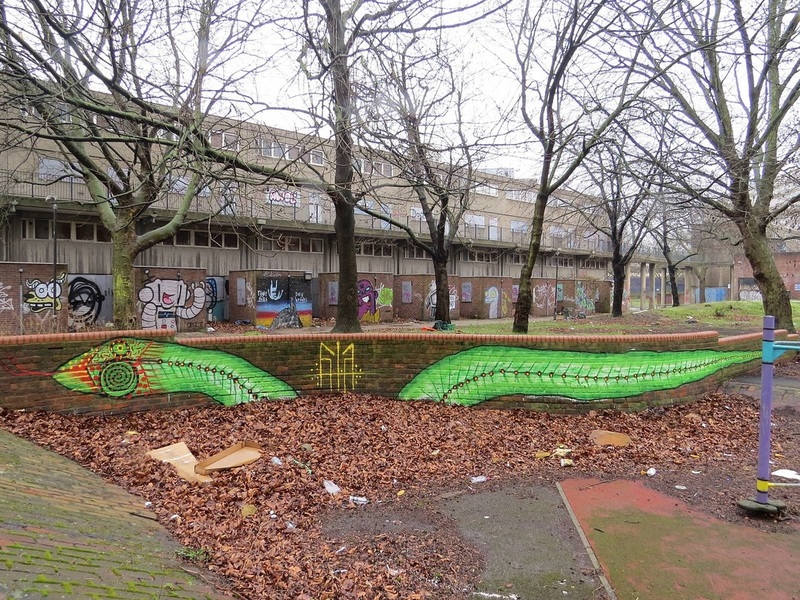 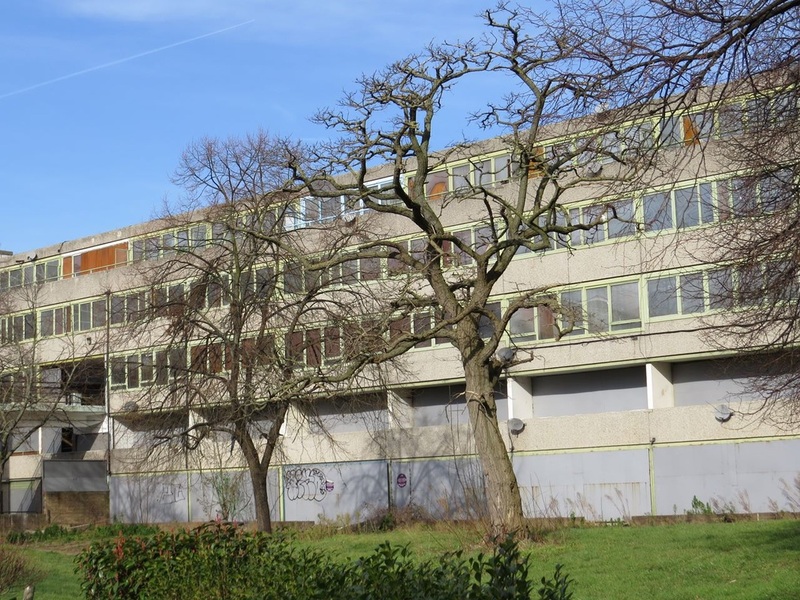 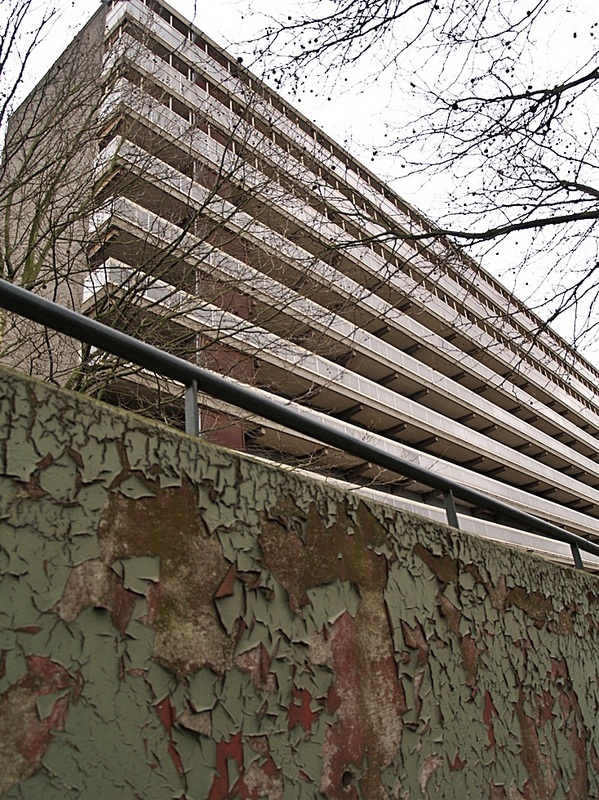 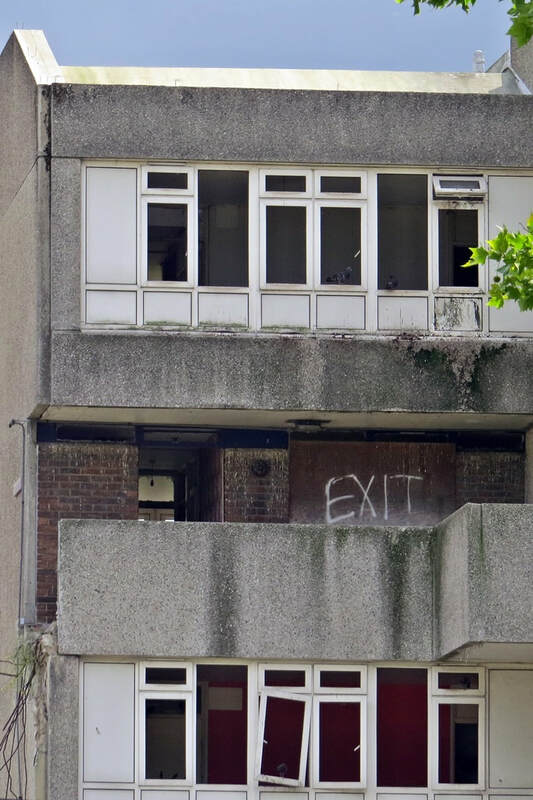 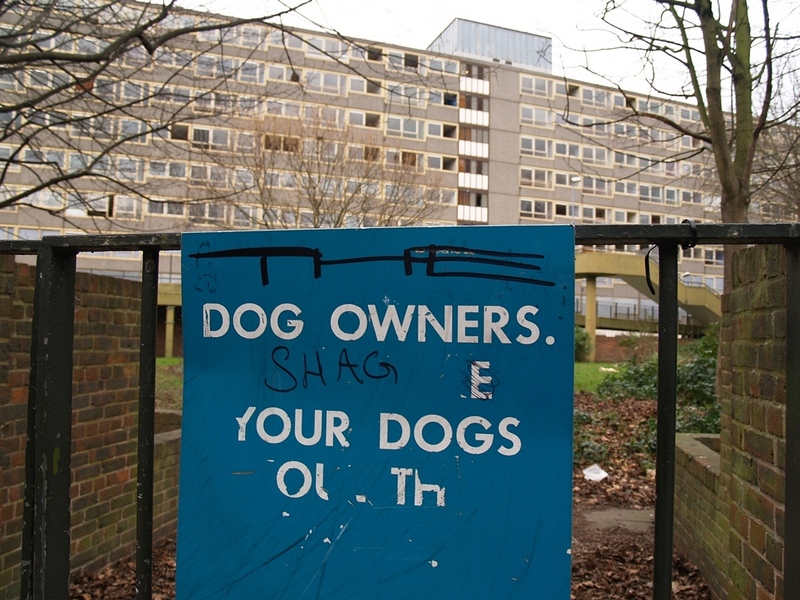 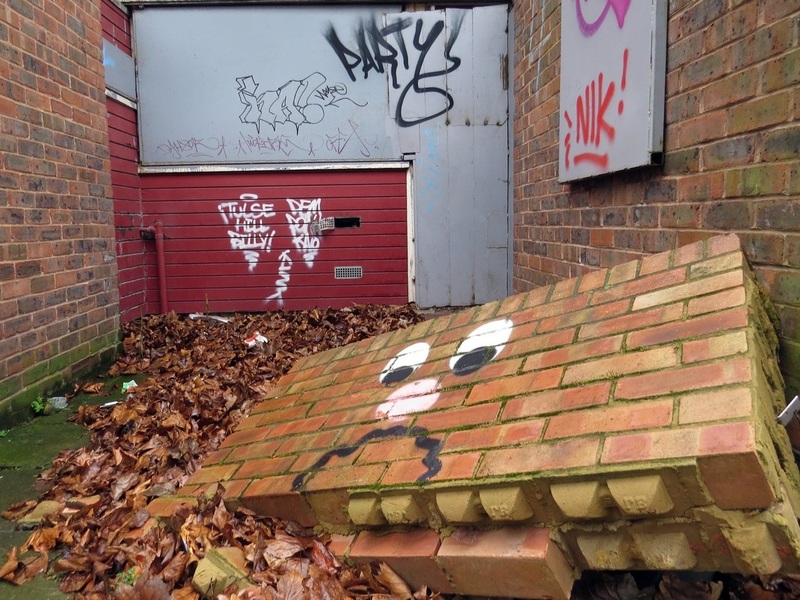 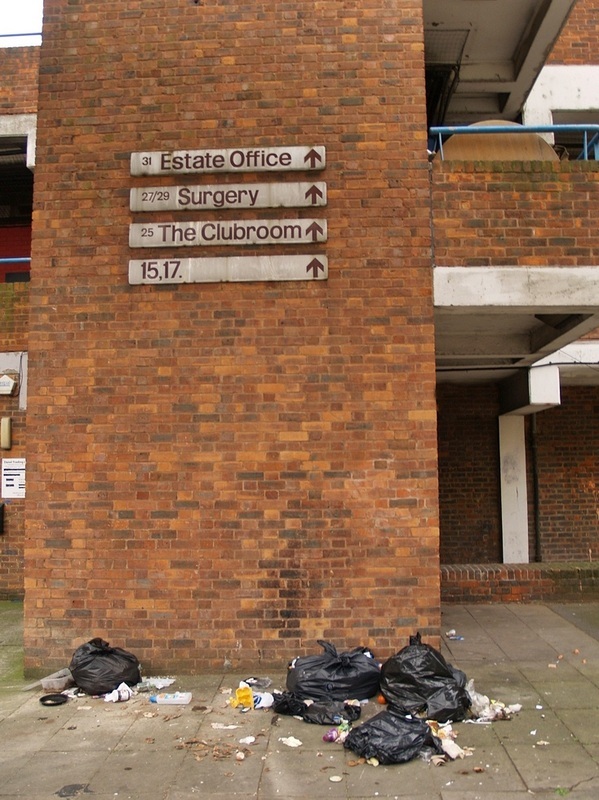 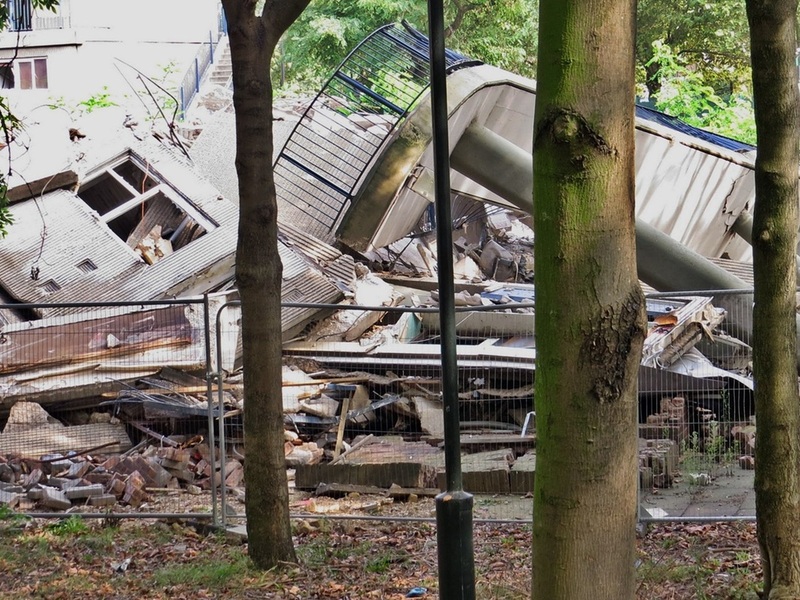 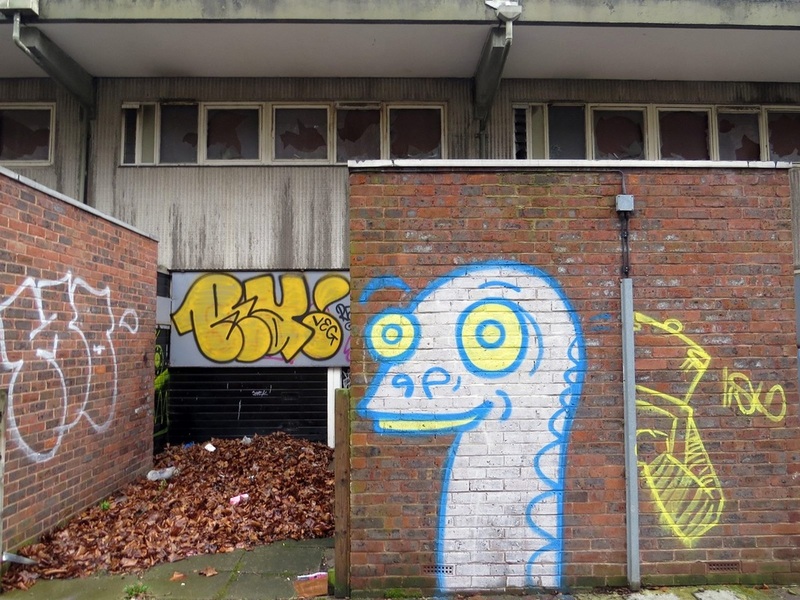 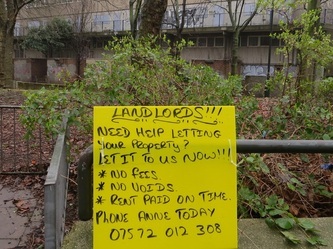 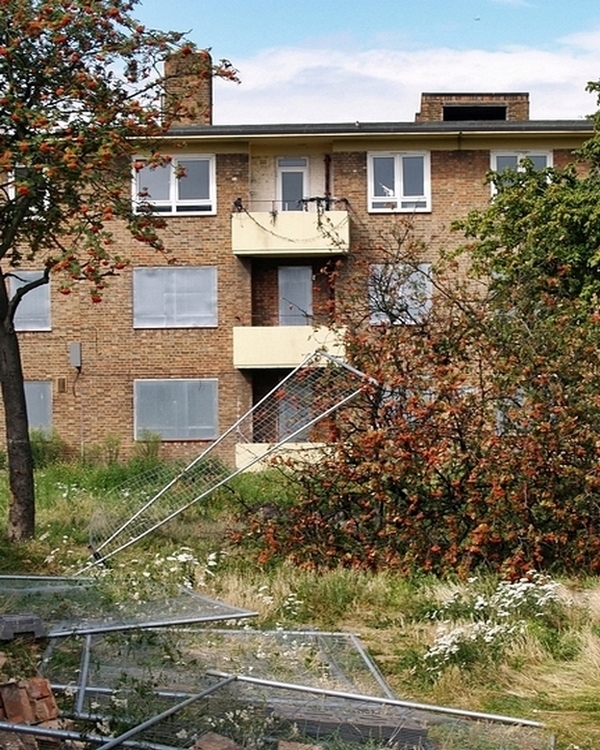 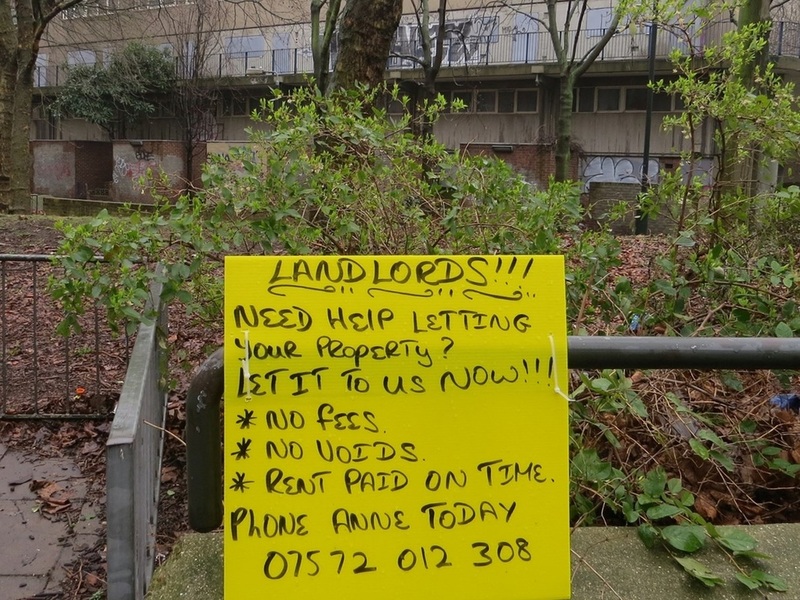 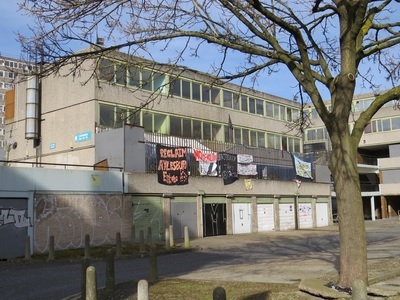 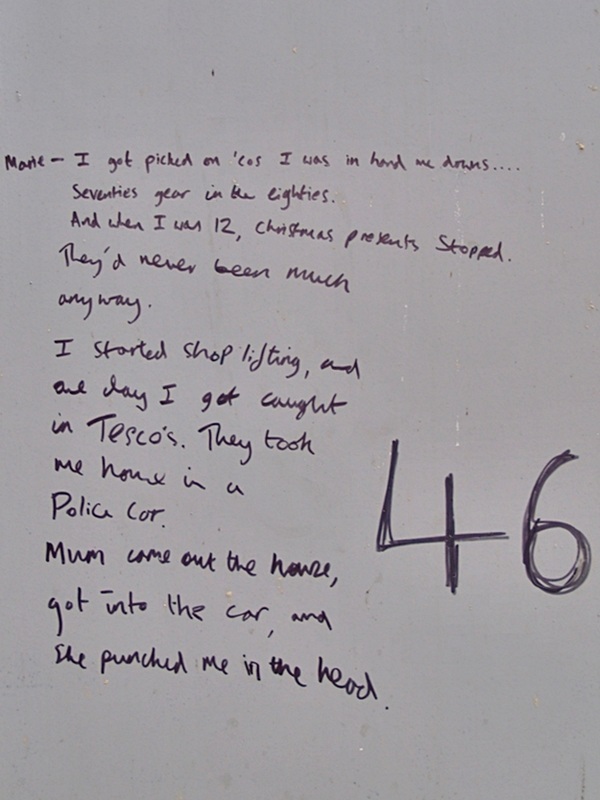 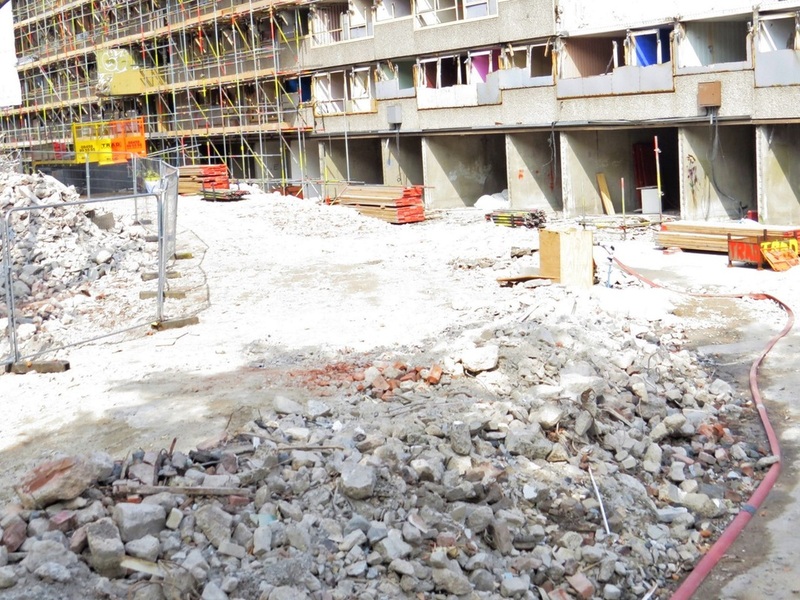 Most of the Heygate's 1,300 homes were boarded up ahead of its handing over to developers. 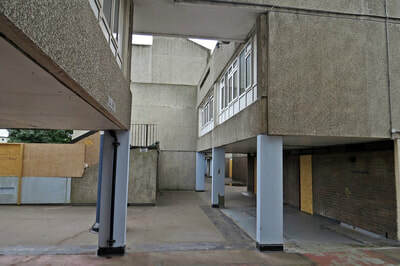 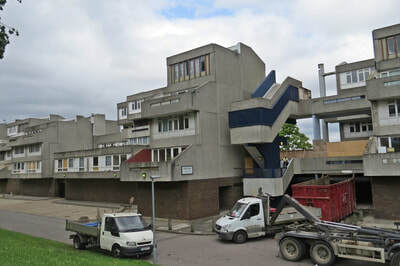 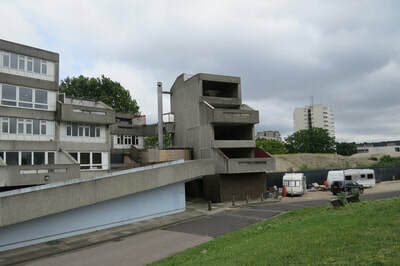 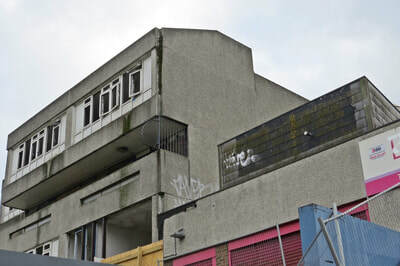 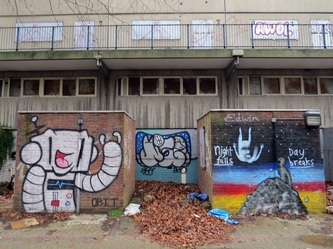 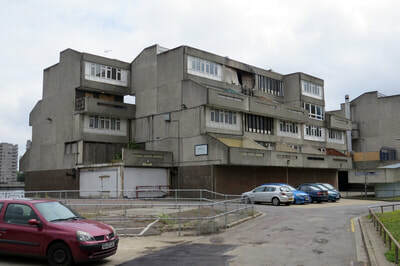 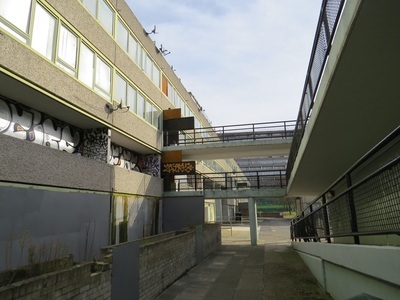 Just a small handful of people remained living on the estate.The futuristic buildings were designed to offer a utopian ideal where communal living provided a social hub for those who became the first to benefit from the post-war welfare state.But Southwark Council said the estate's stairwells and dark alleys actually turned into areas which encouraged crime and anti-social behaviour. 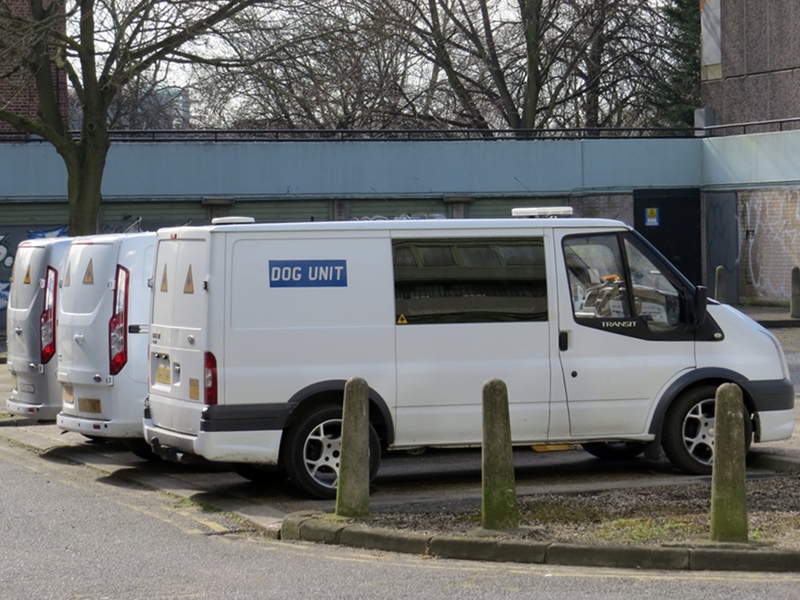 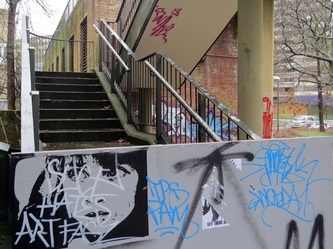 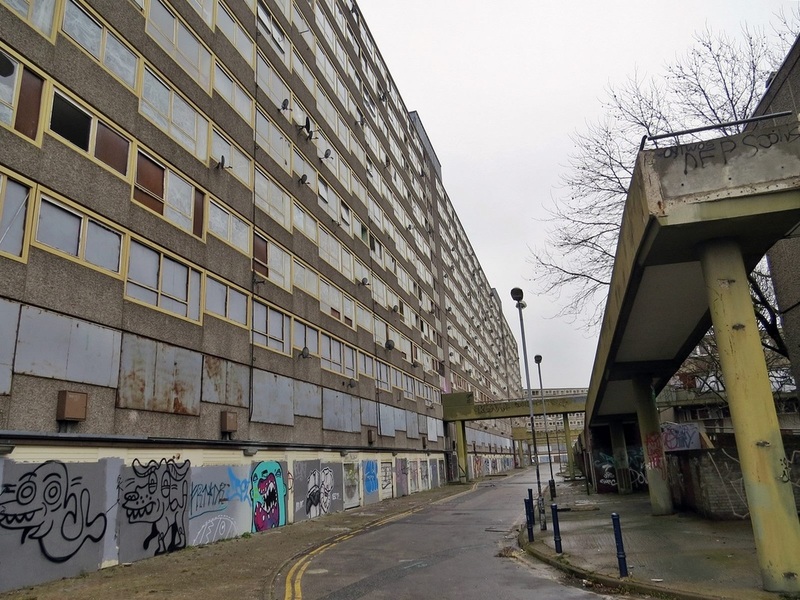 The Heygate Estate formed the backdrop to The Bill, Michael Caine film Harry Brown & other crime dramas which didnt help the image of the estate. 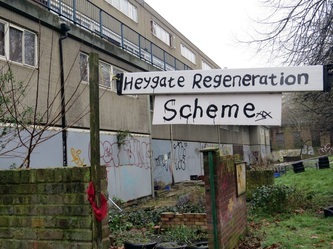 The Guardian interviewed one of the last residents who calls "the destruction of the Heygate an example of "environmental determinism". 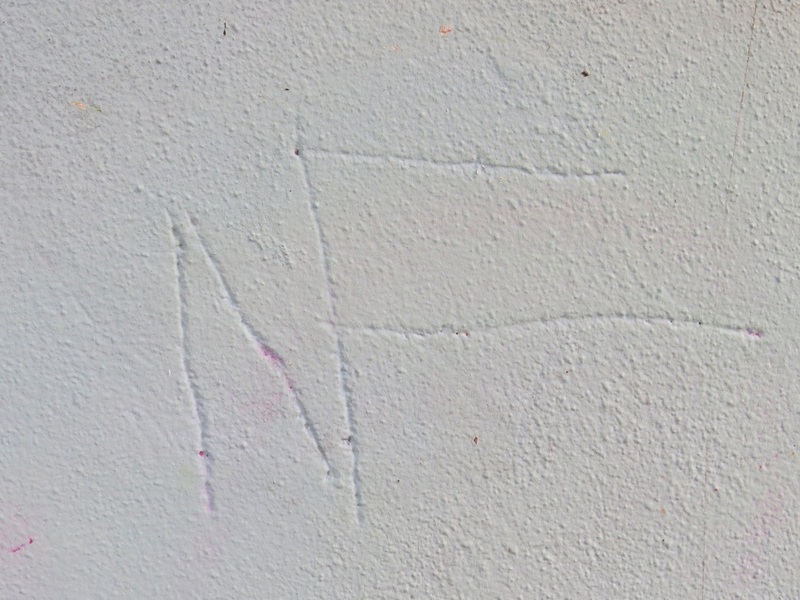 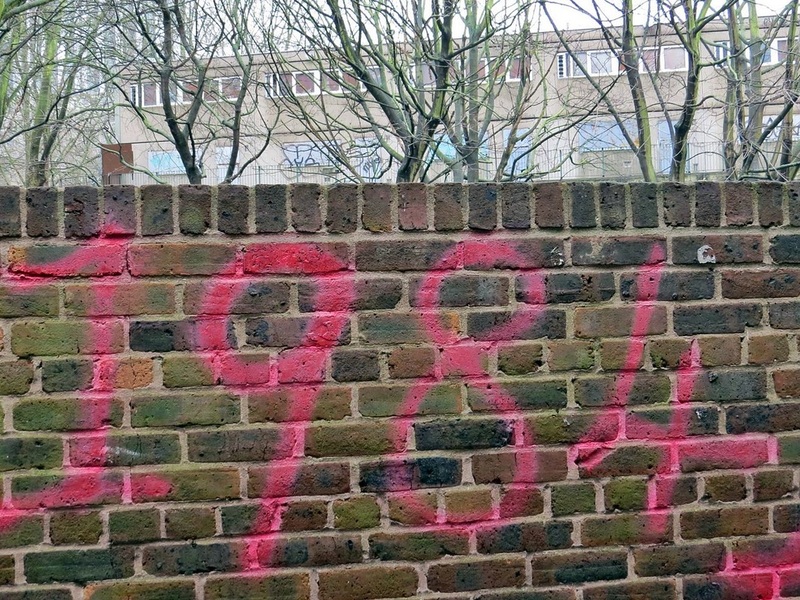 "It's part of the same discourse that was being bandied around in the 1960s," he argues. 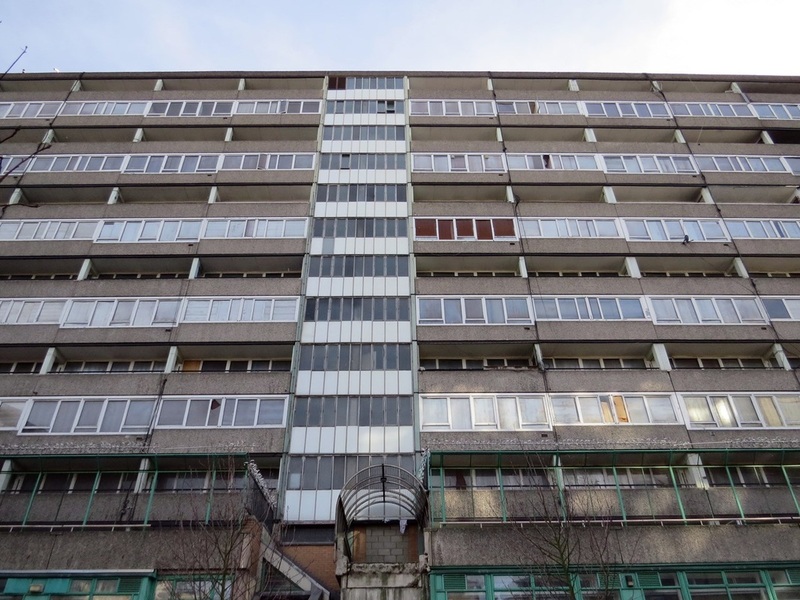 "Then it was said that the tenement buildings needed to be demolished because they didn't create an environment where people could live happily. 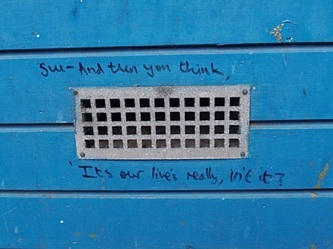 It was precisely what is being said now." 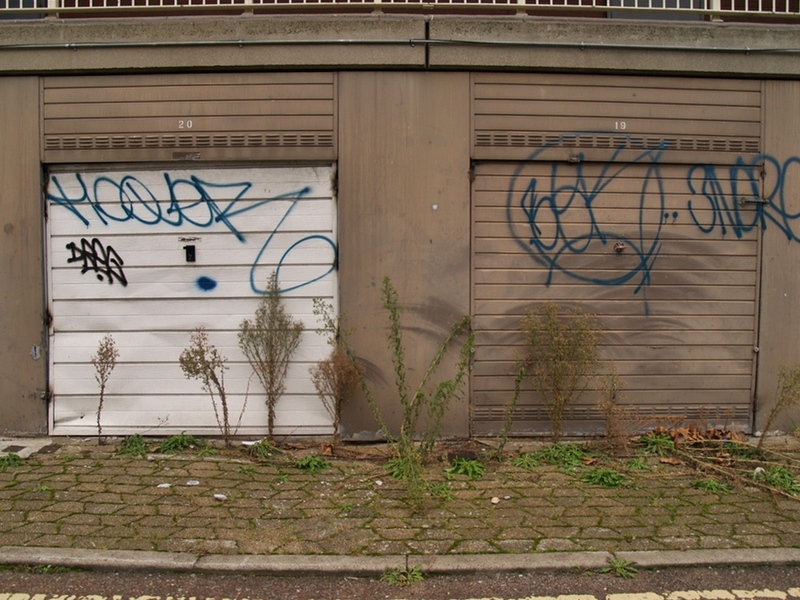 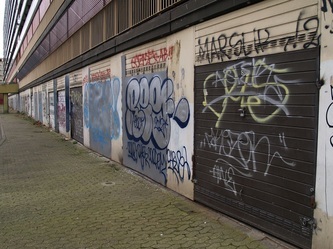 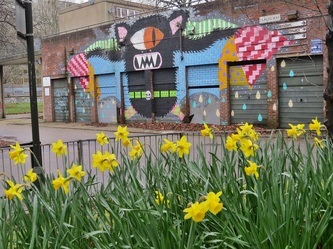 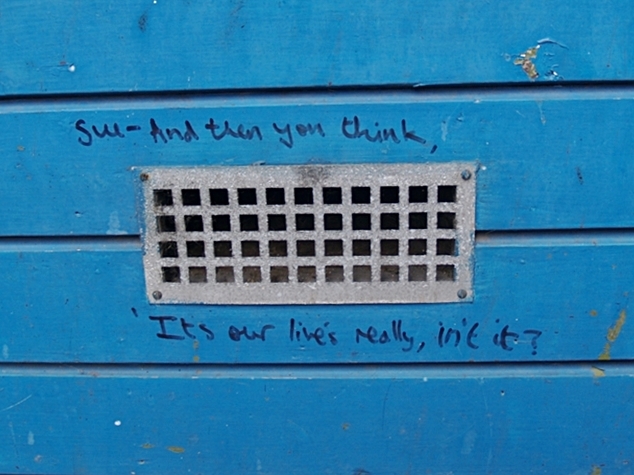 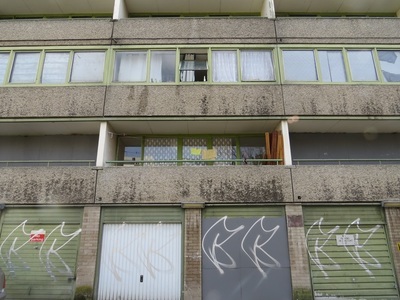 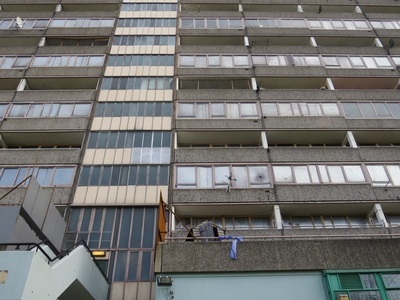 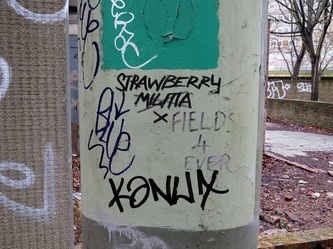 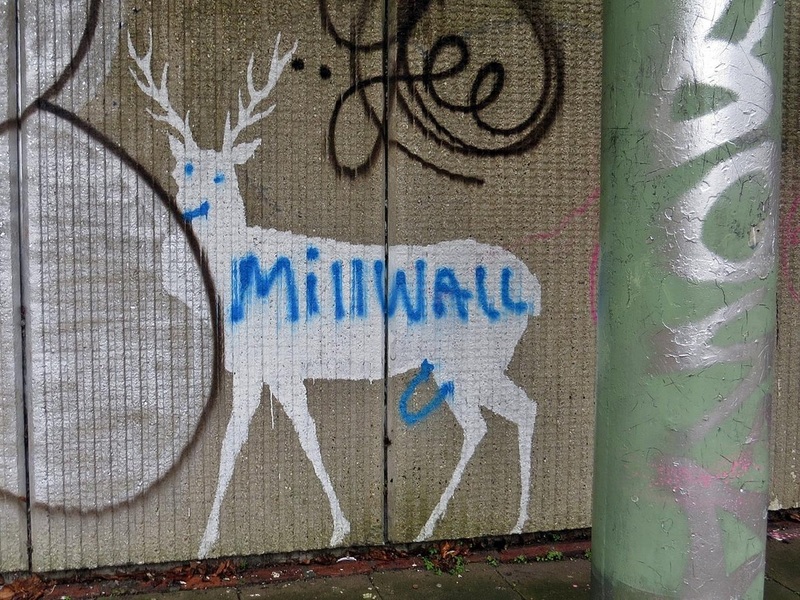 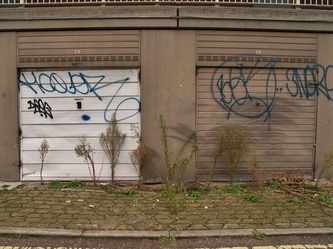 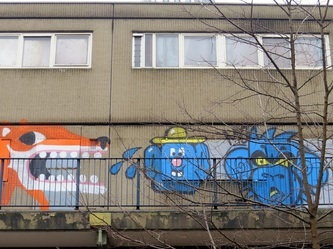 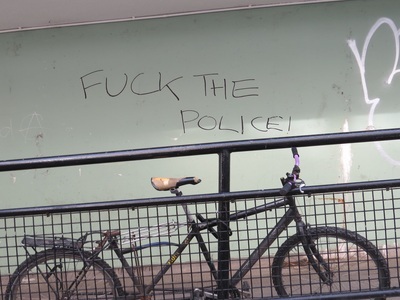 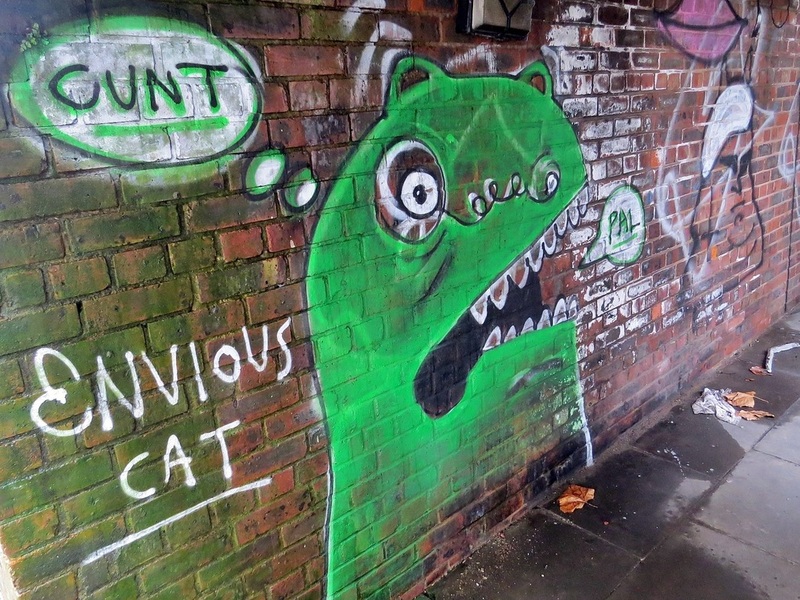 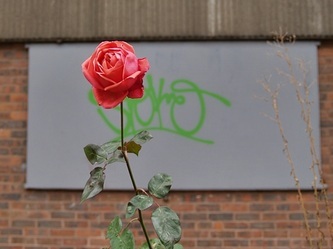 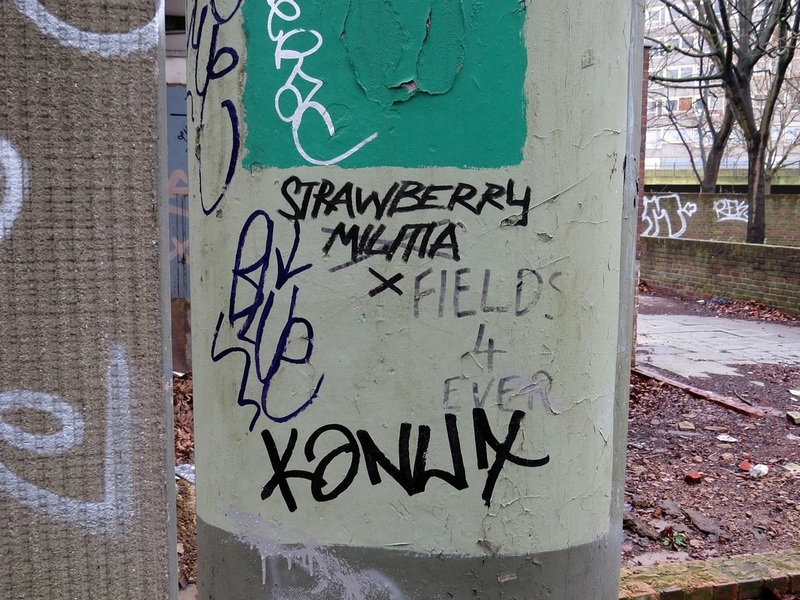 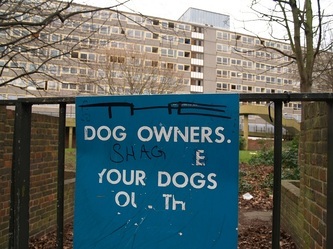 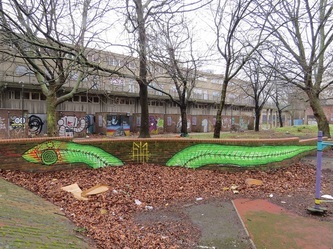 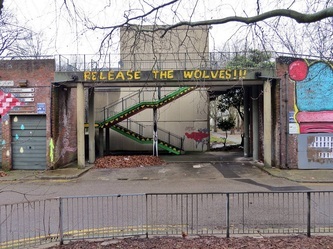 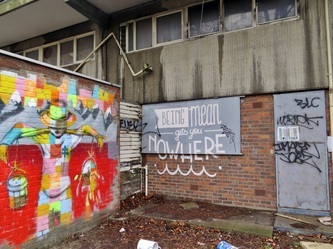 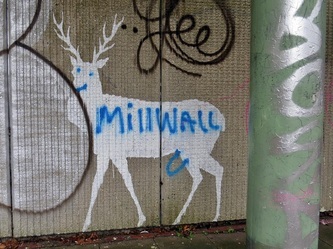 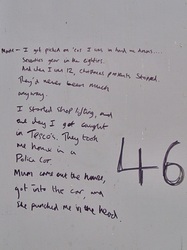 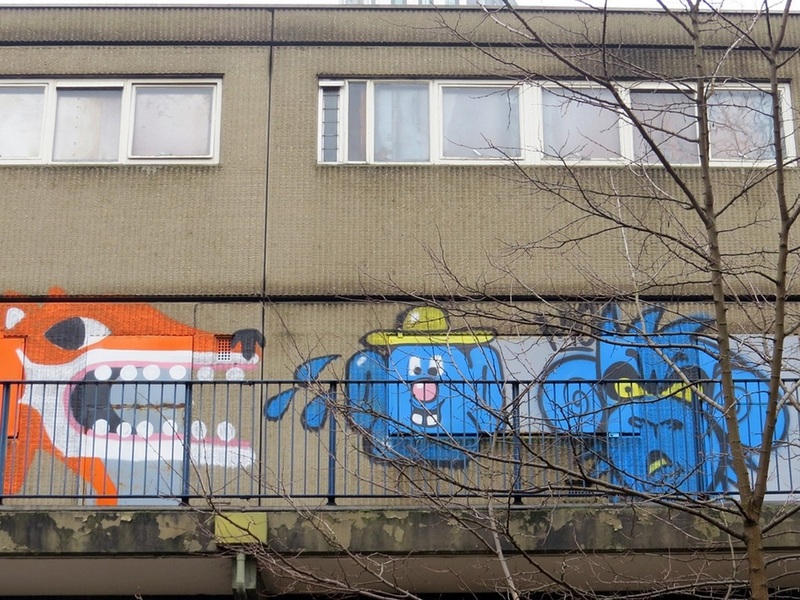 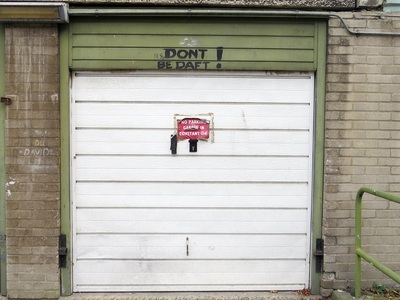 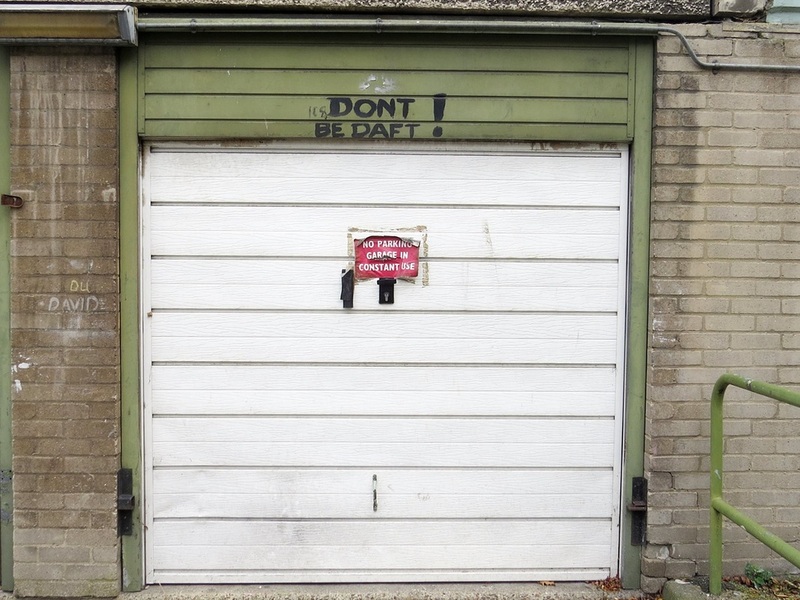 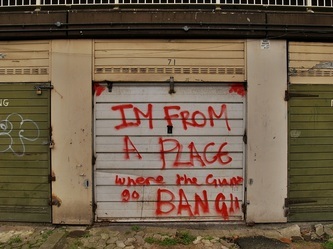 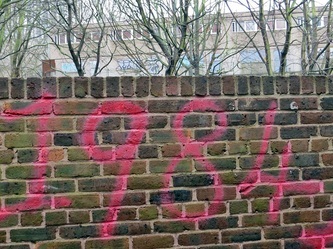 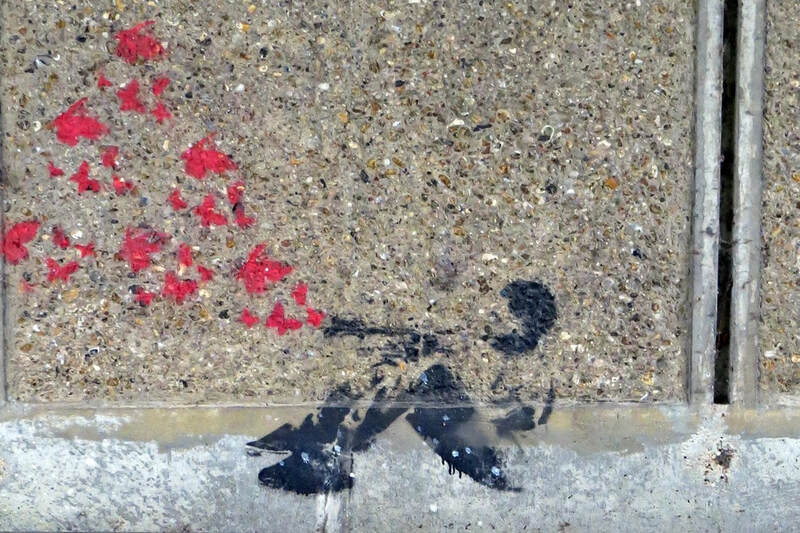 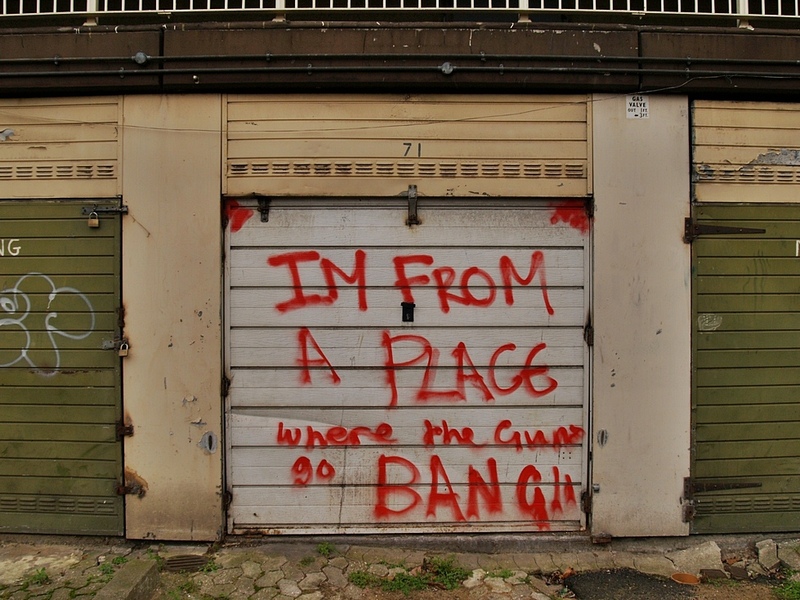 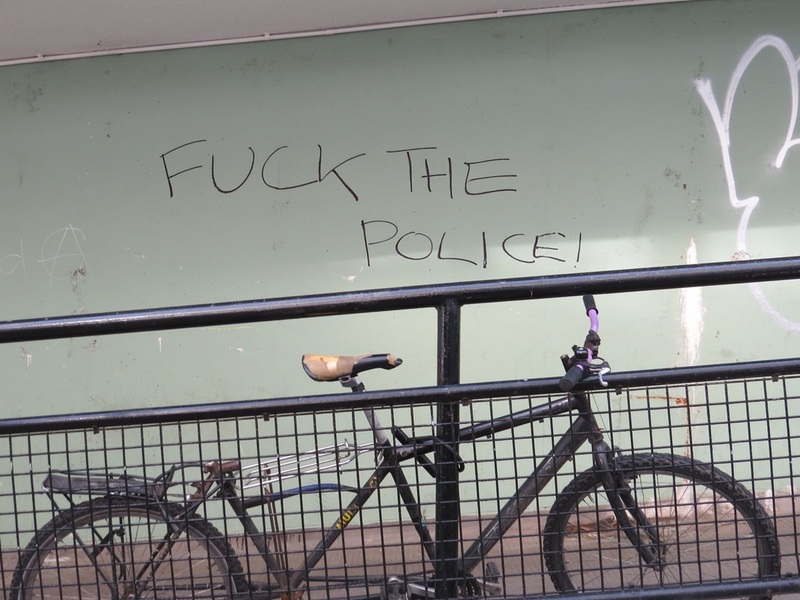 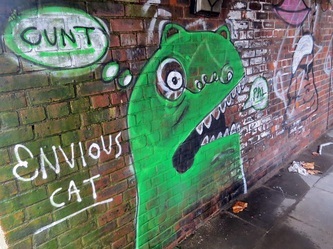 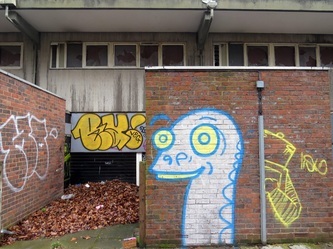 He believes the idea that the estate was "blighted" by crime and drugs was part invention – the product of an excitable media and of film-makers who liked to use the Heygate as a set for gritty realist dramas – and part self-fulfilling prophecy, as the council neglected maintenance and replaced long-term tenants with short-term licensees, who tended to be more disruptive. 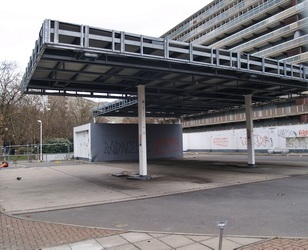 Tim Tinker, the man who originally designed the estate believes the council knocked the Heygate down because of its central location. 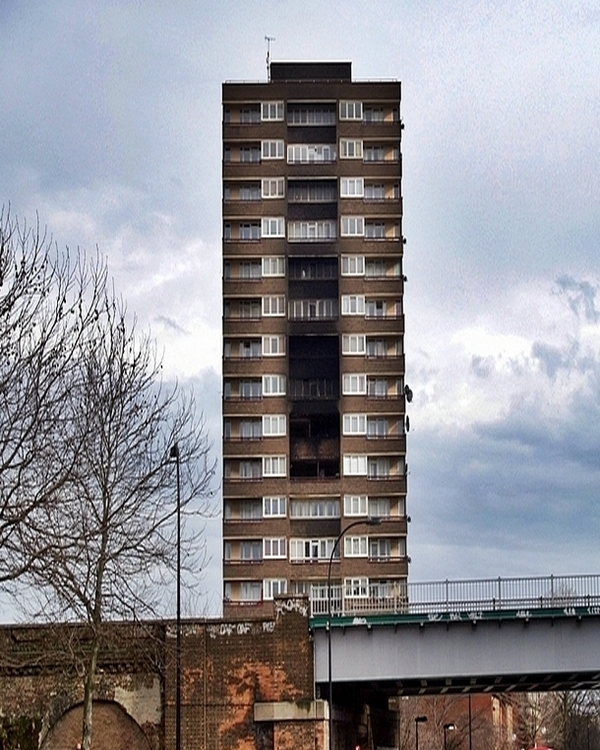 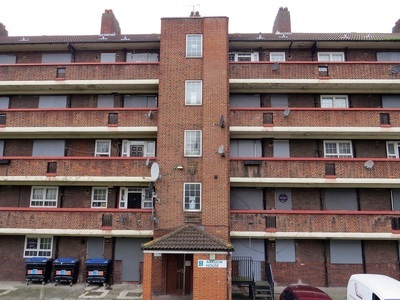 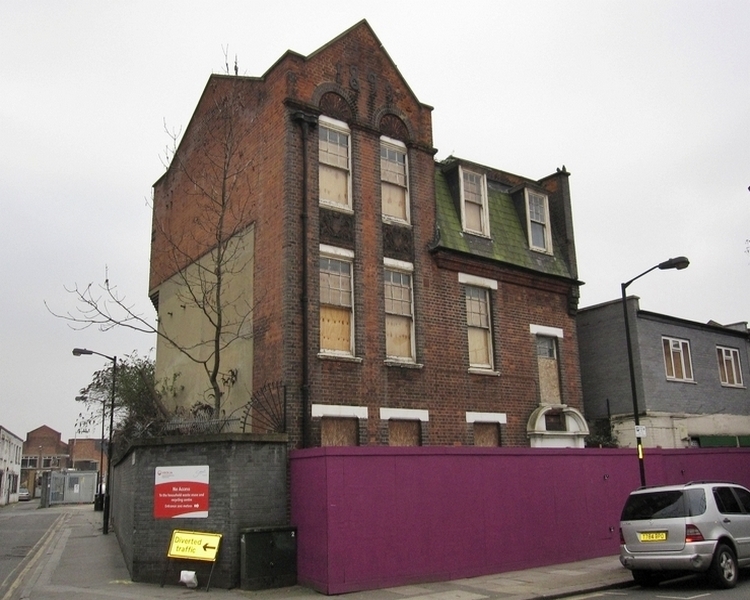 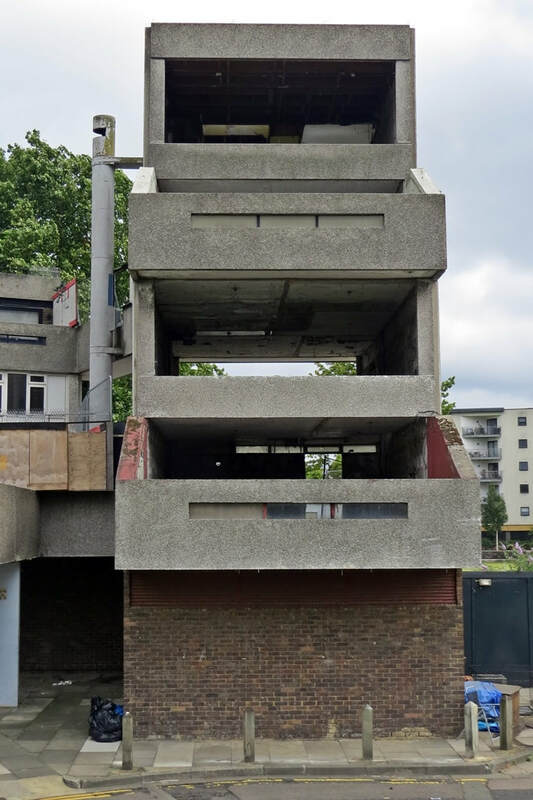 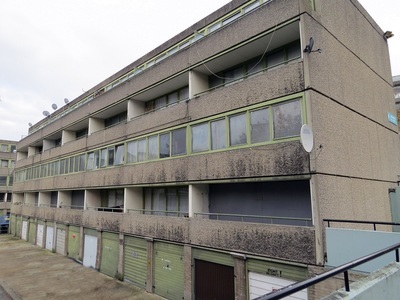 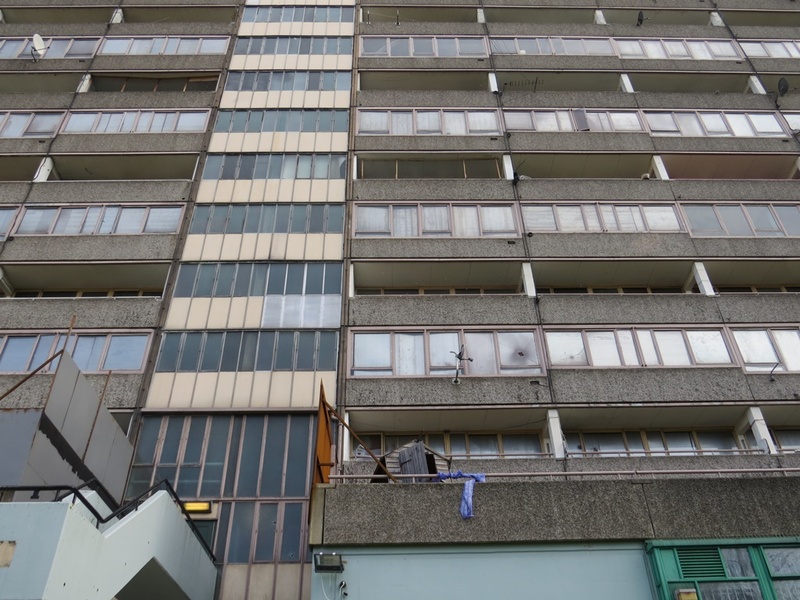 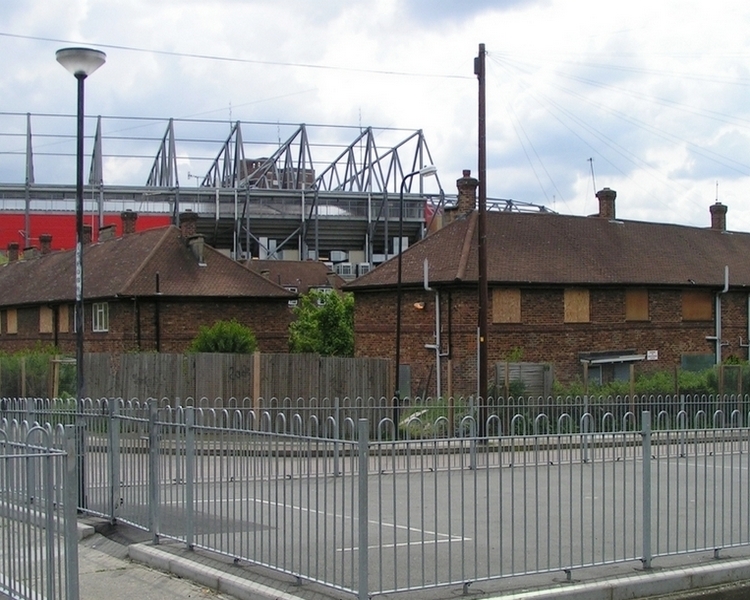 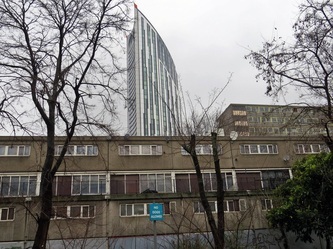 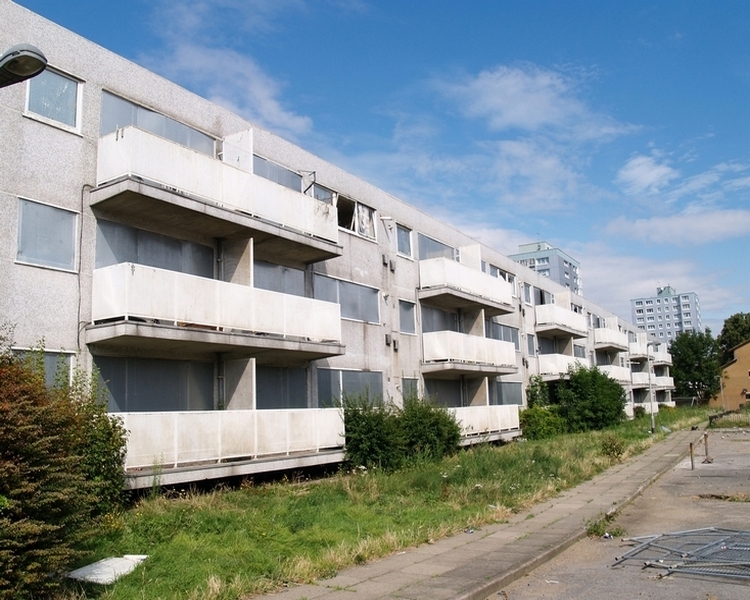 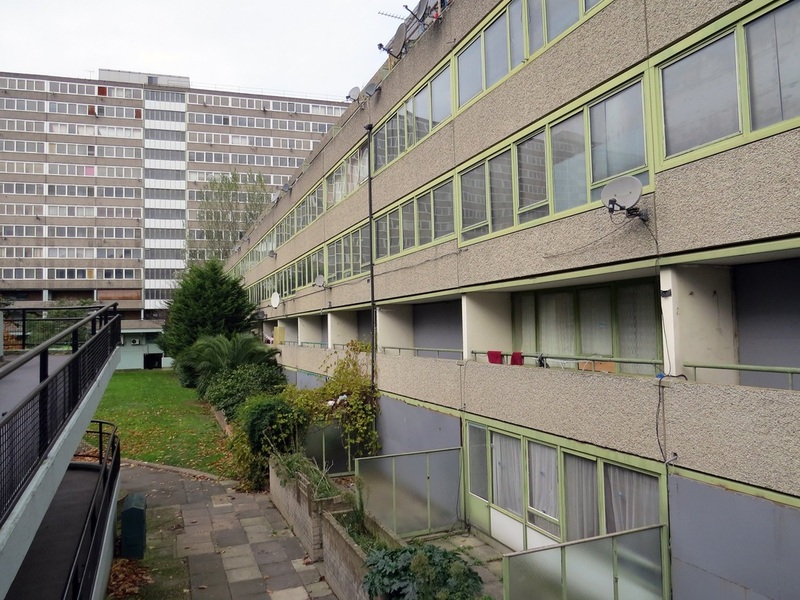 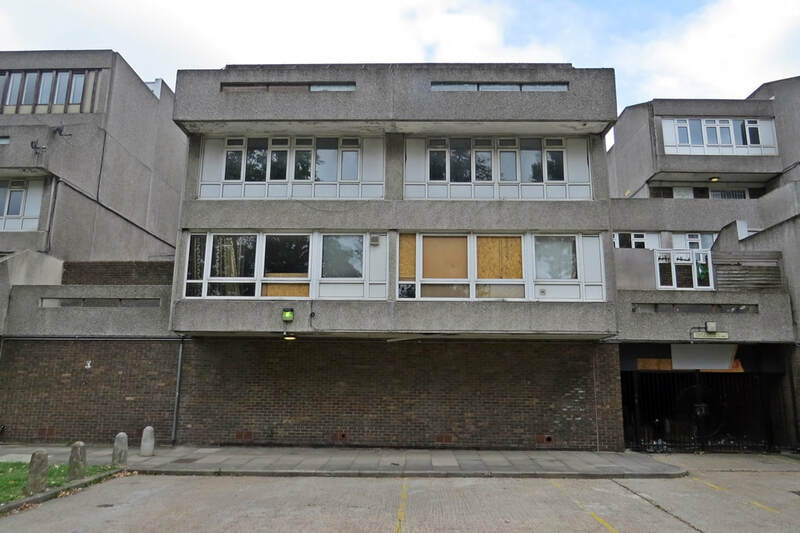 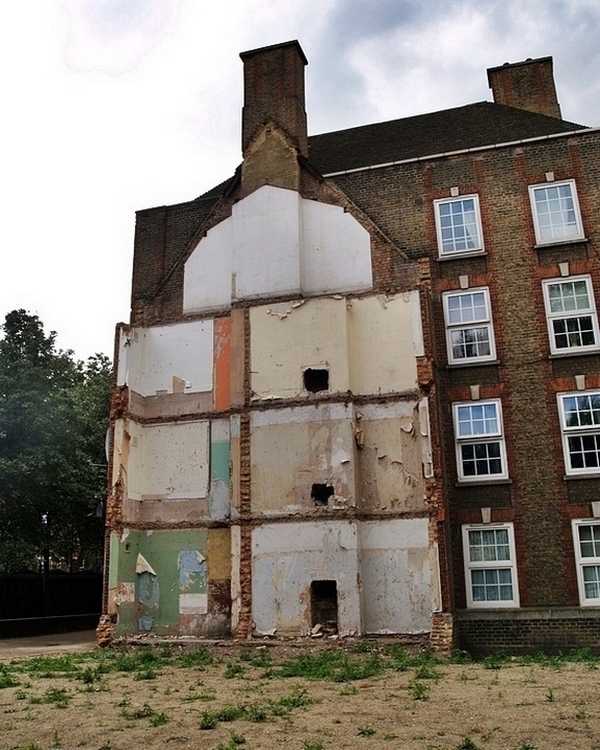 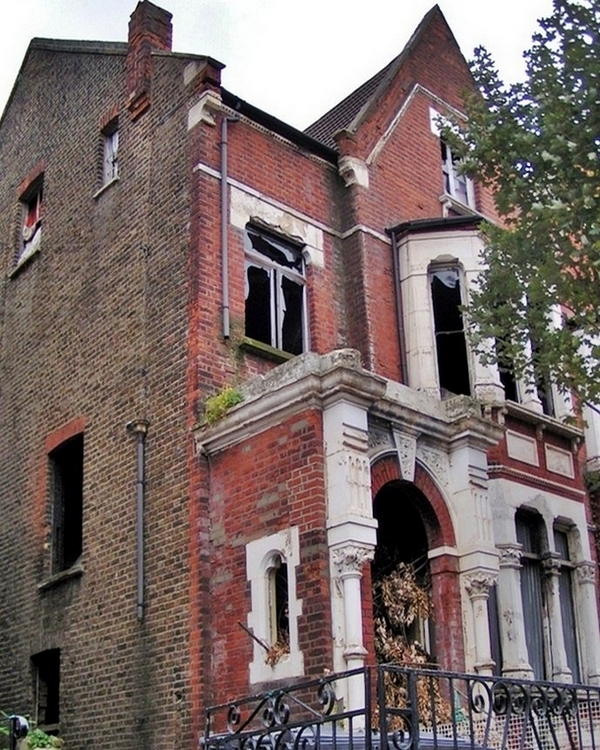 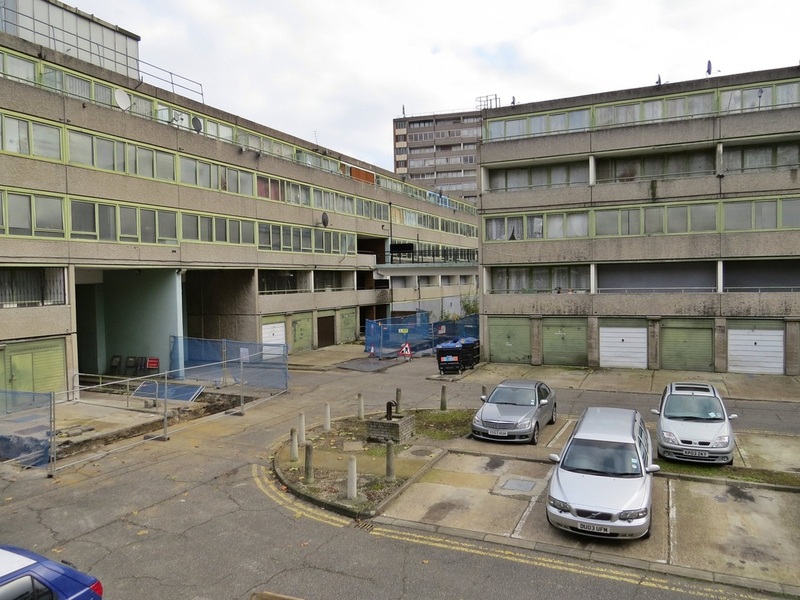 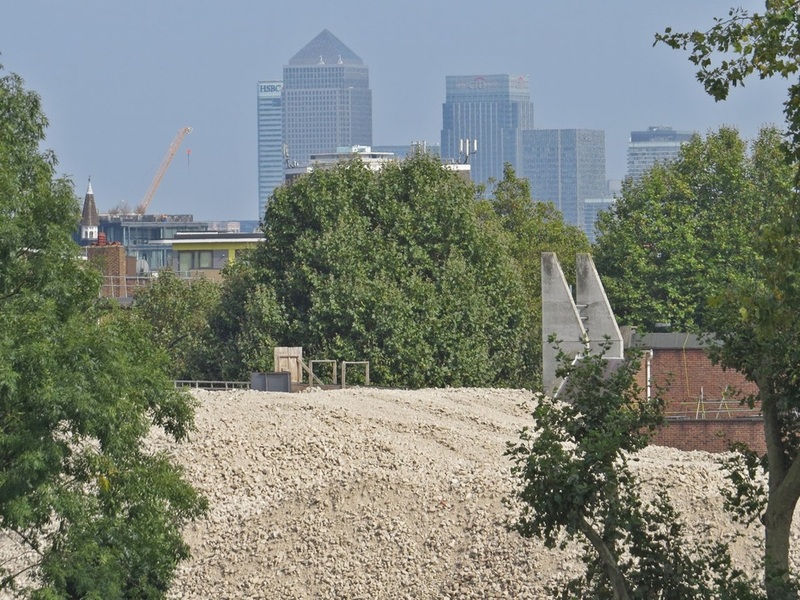 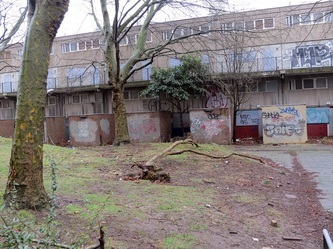 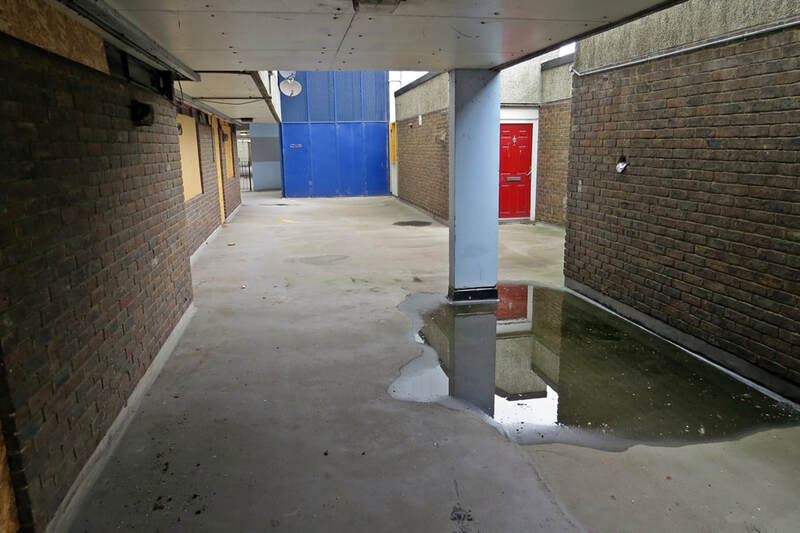 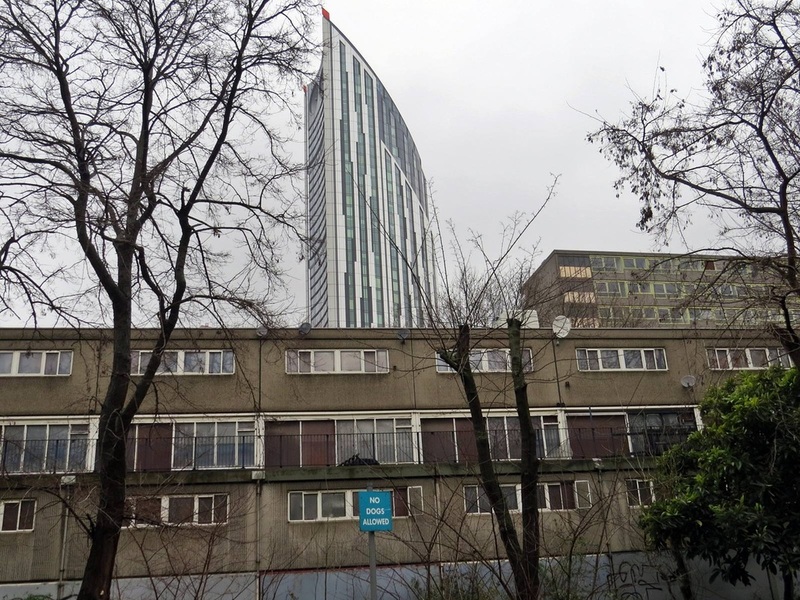 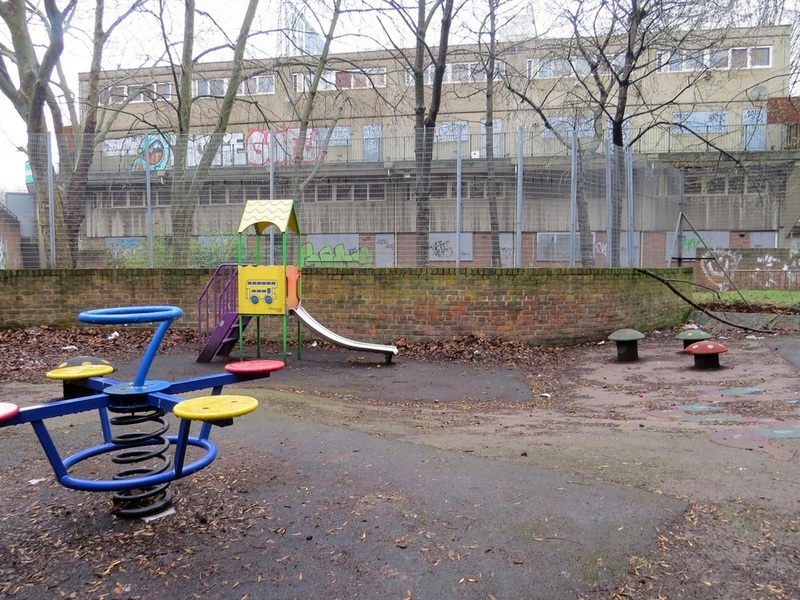 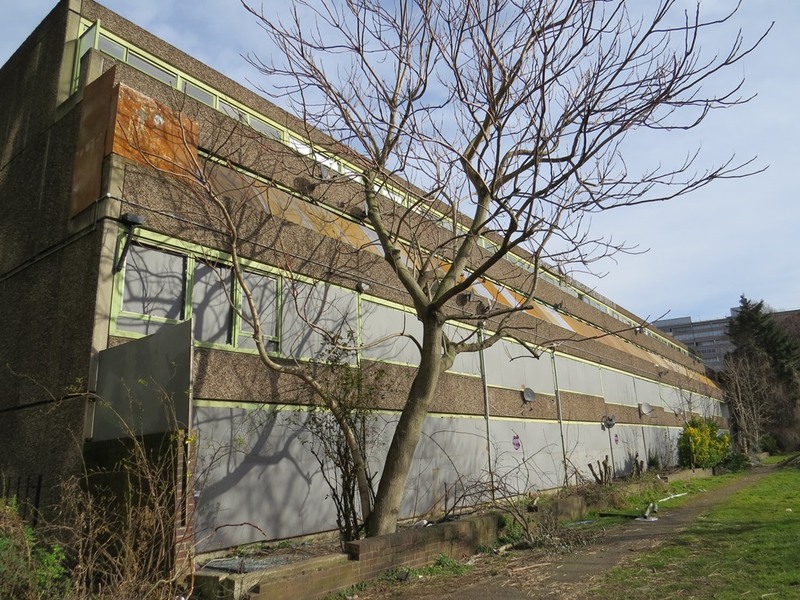 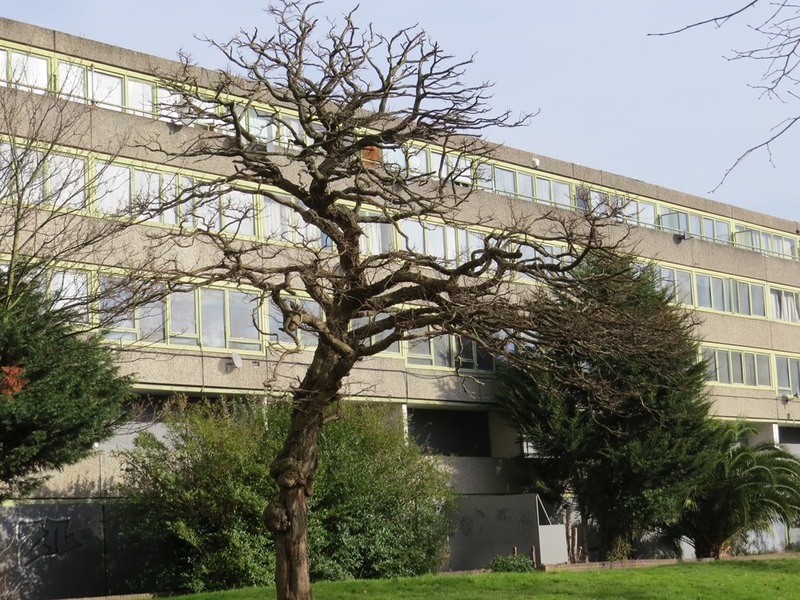 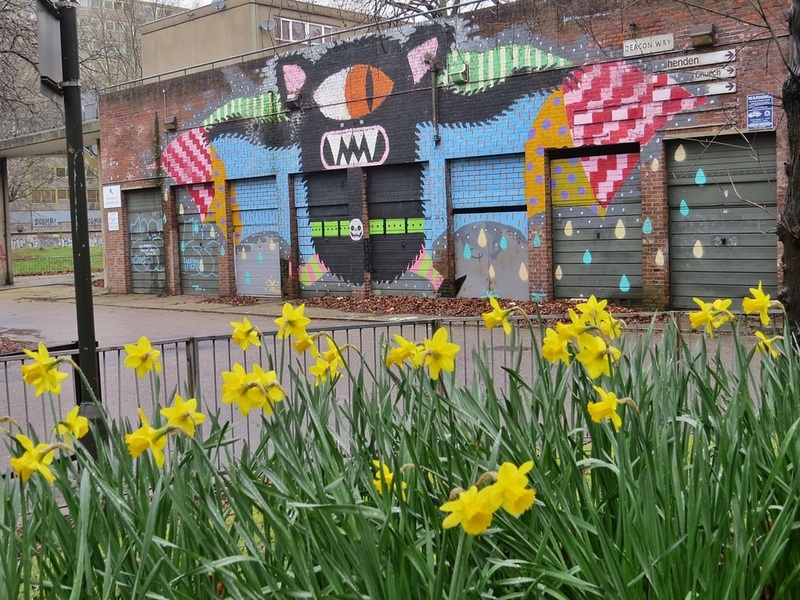 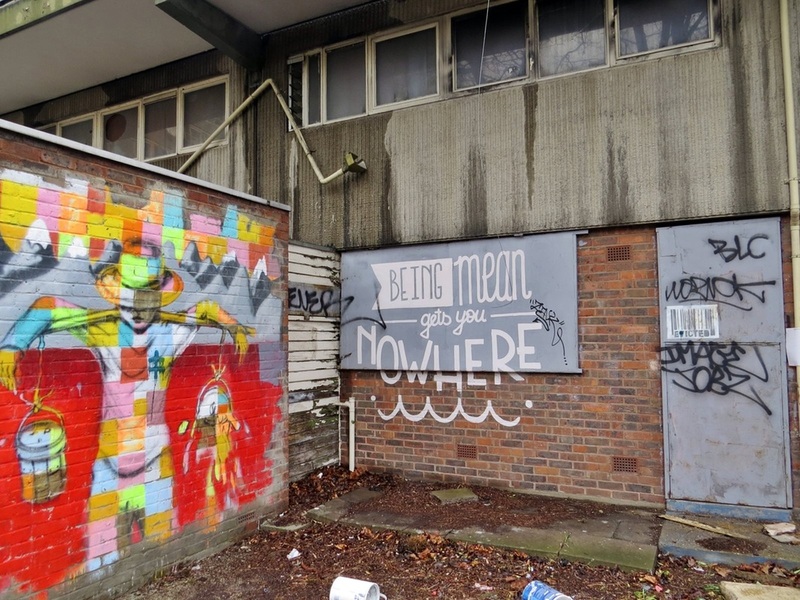 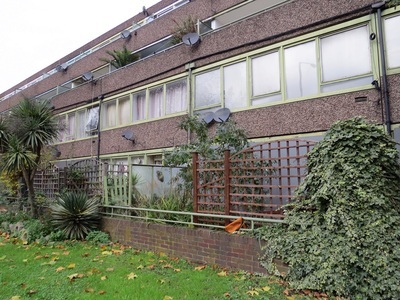 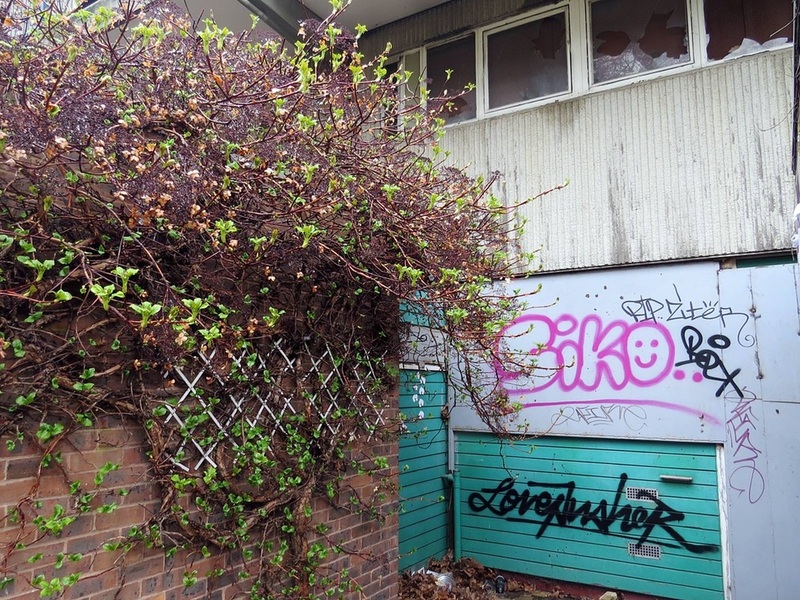 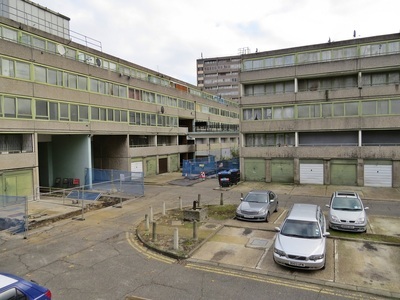 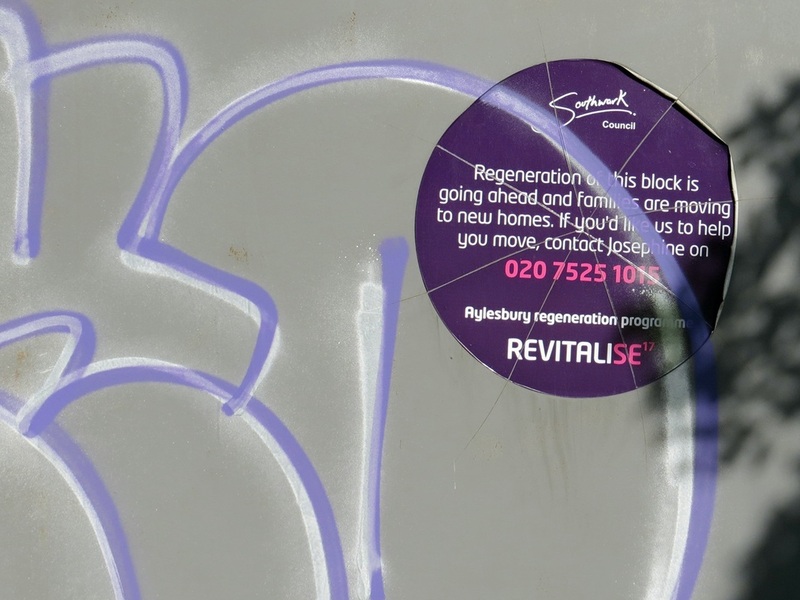 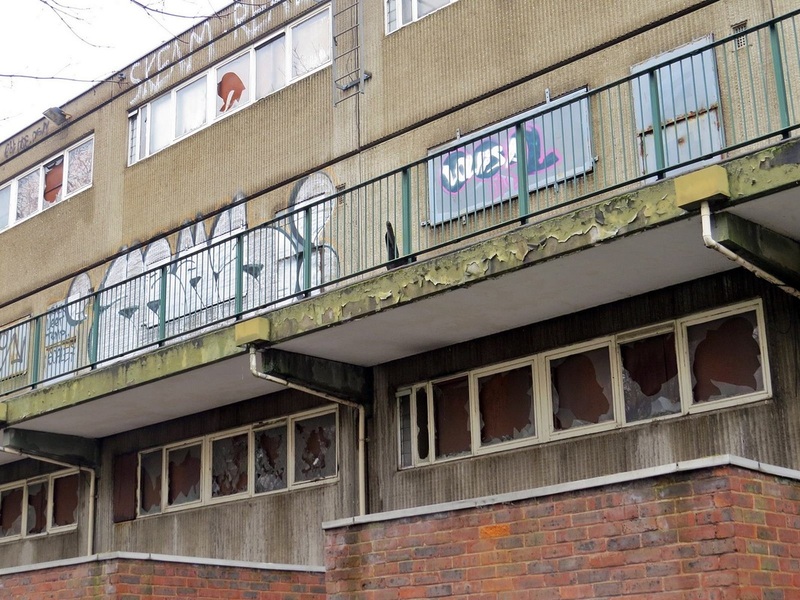 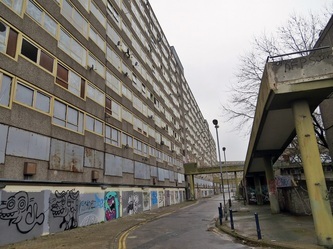 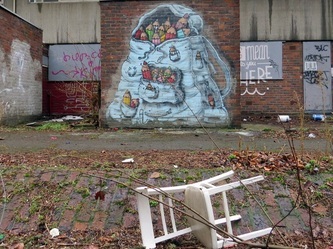 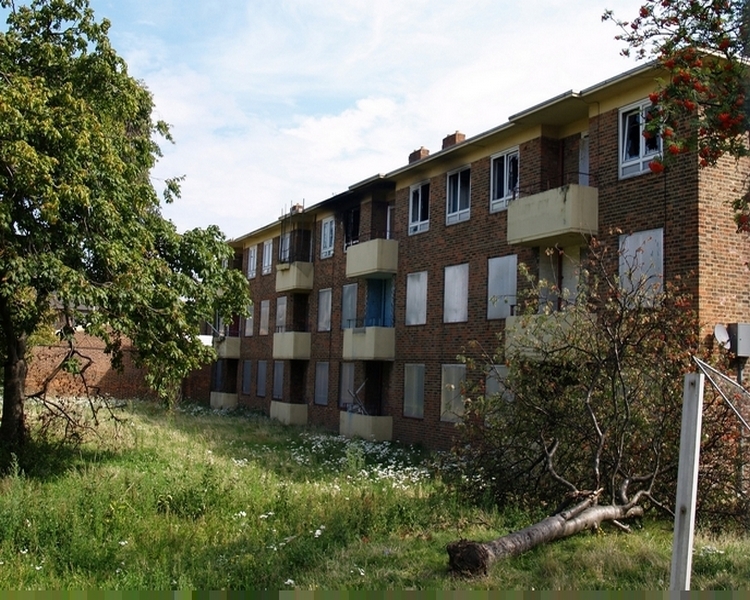 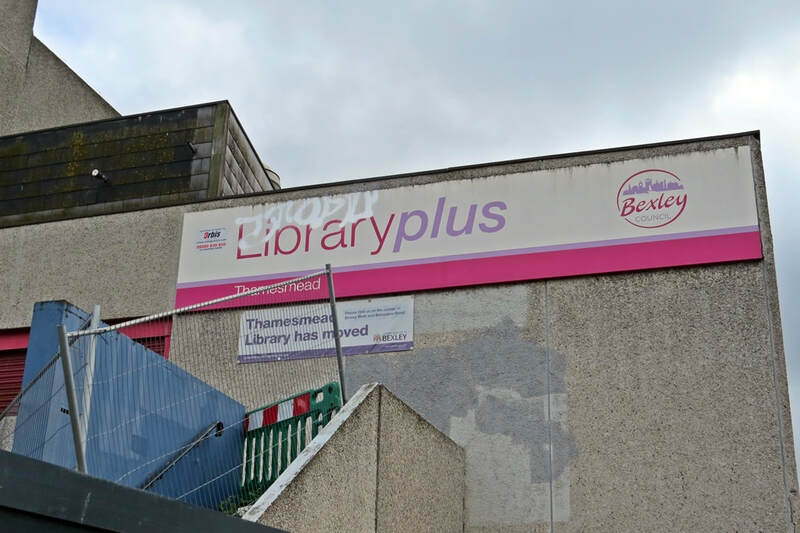 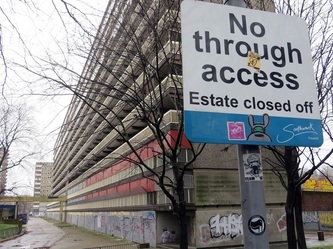 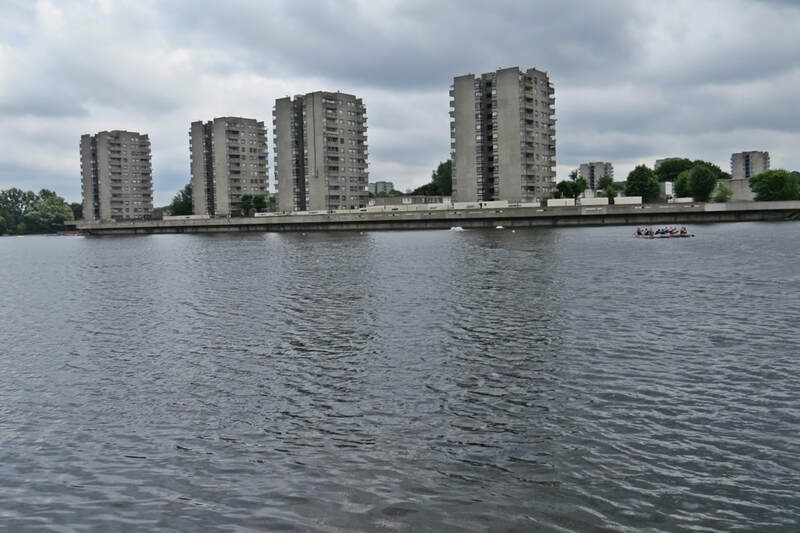 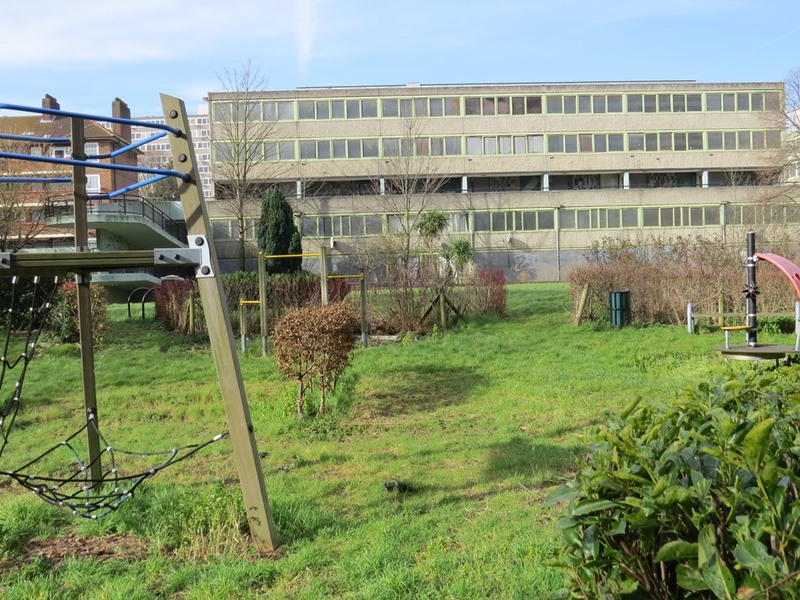 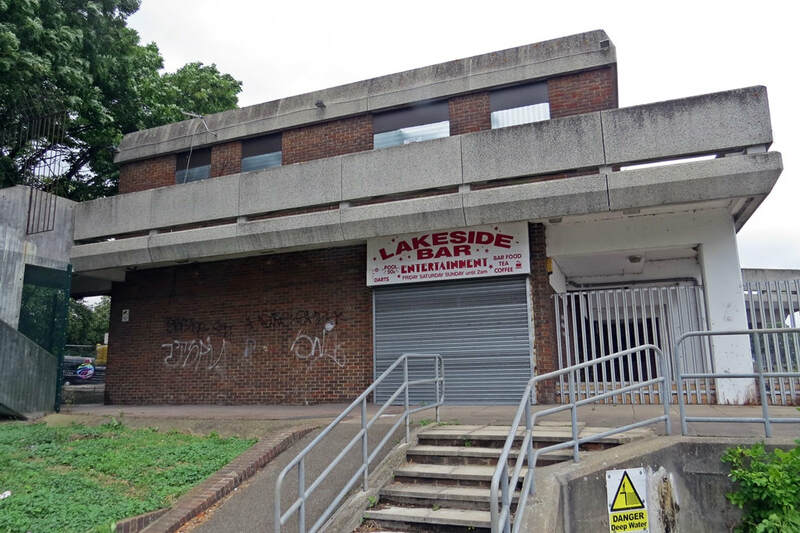 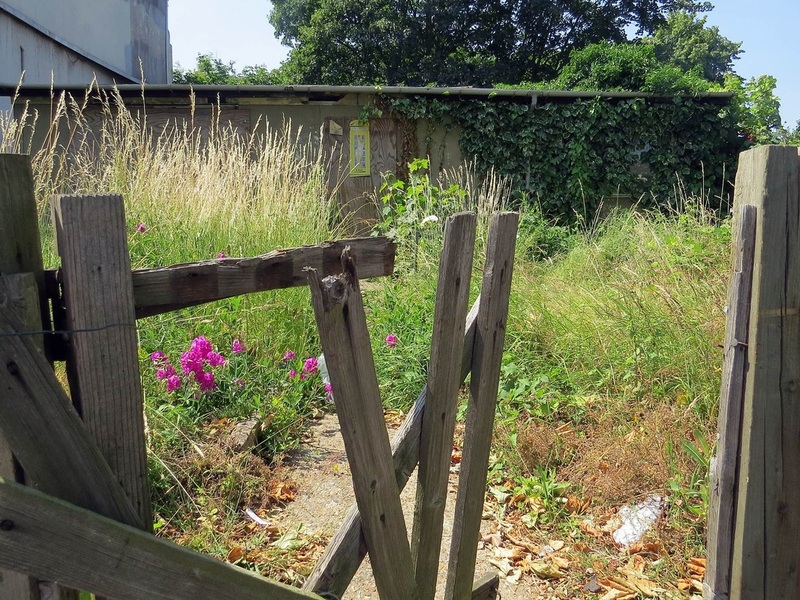 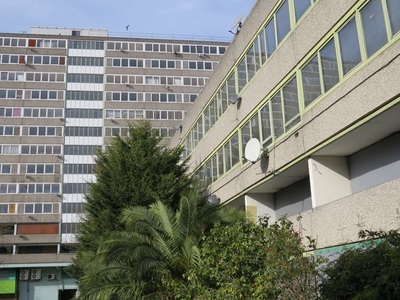 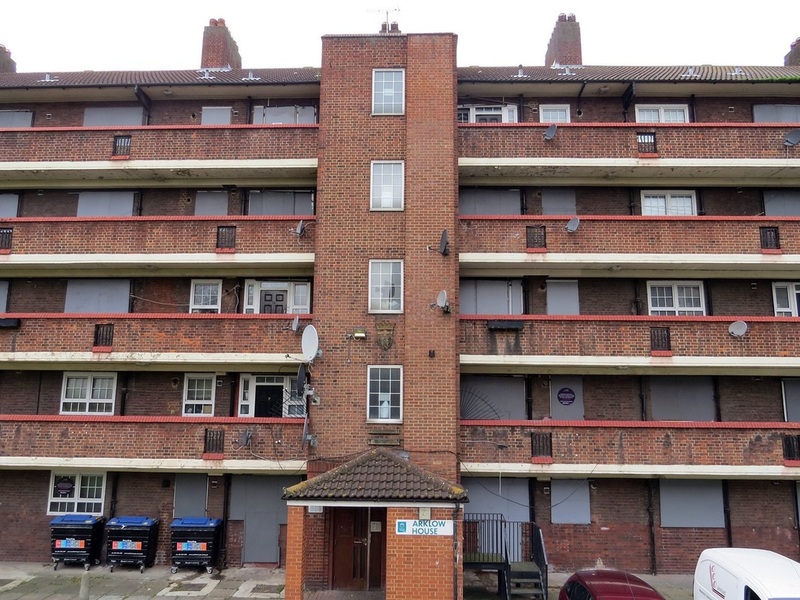 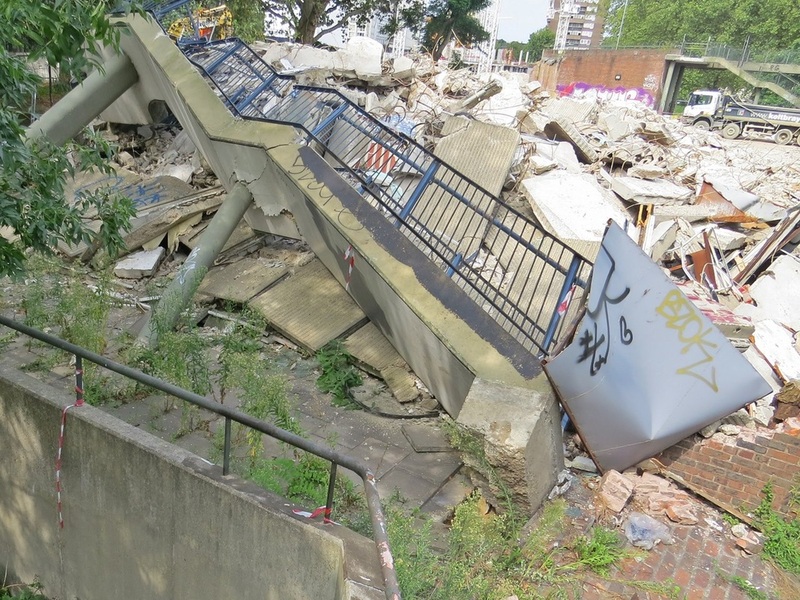 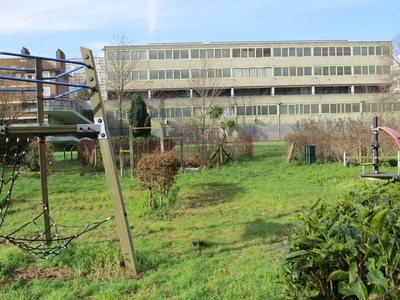 "There weren't any problems [with the estate] until relatively recently, but the council eyed it as an opportunity...."
In 2013, a London Assembly report claimed that Southwark Council had looked at different options for the estate in 1998. 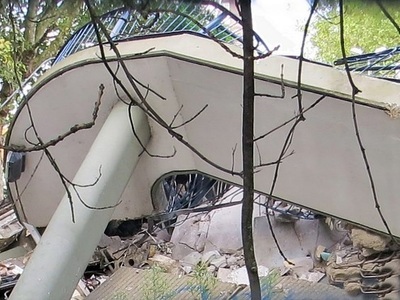 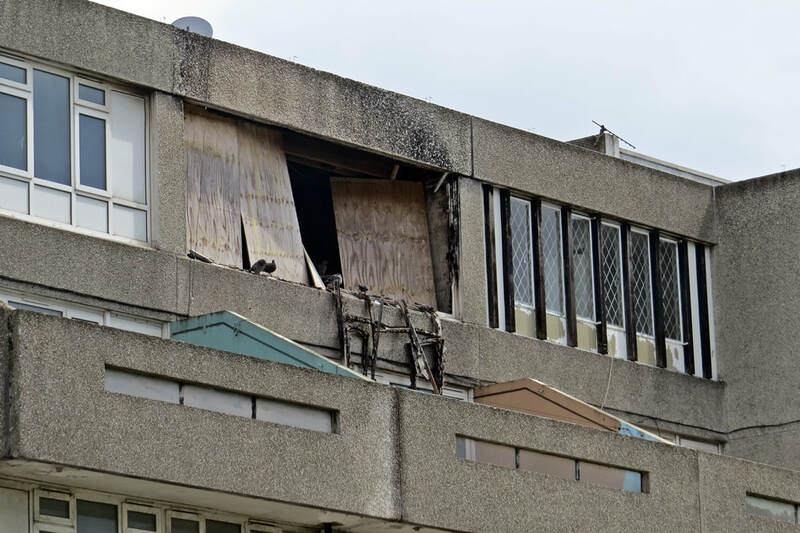 It said the surveyors found that the buildings were structurally sound and suggested that the best option was refurbishment. 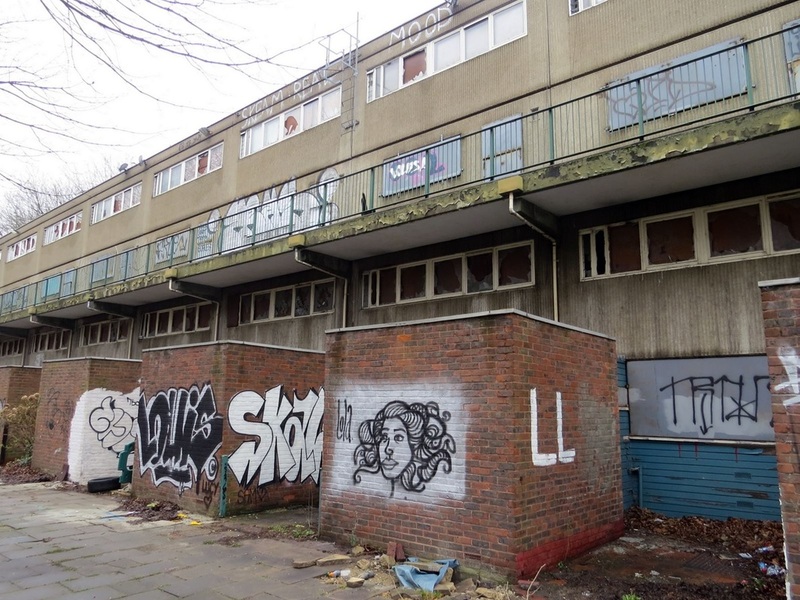 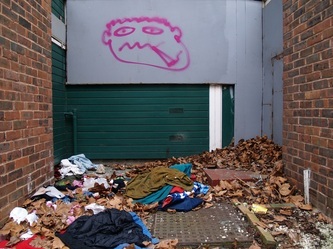 The survey also found that four in five residents didn’t want to move off the estate, and that the crime rate was half the average for the borough of Southwark. 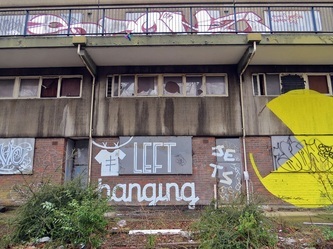 In July 2014, the Council leader came under criticism for having accepted gifts from developer Lend Lease; these included a property show in Cannes, and 2 £1,600 tickets to the Olympics. 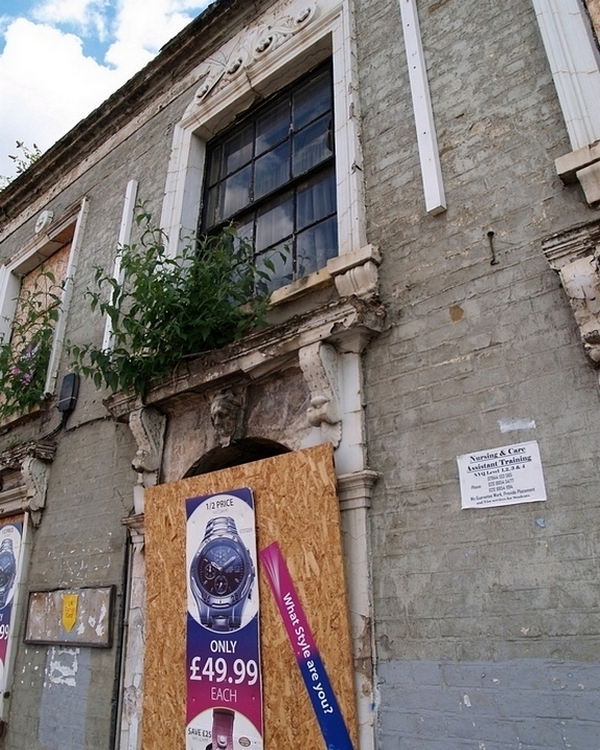 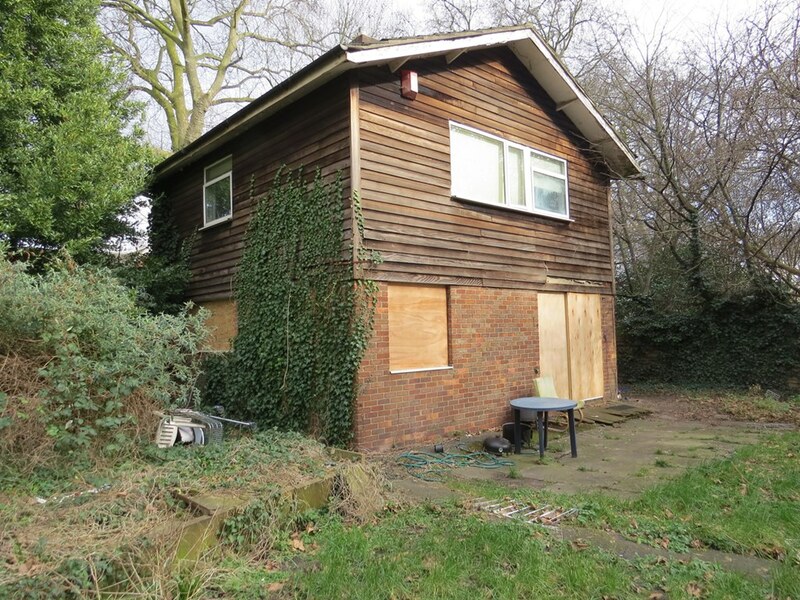 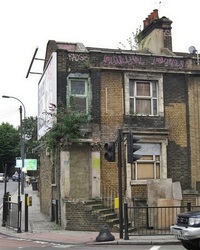 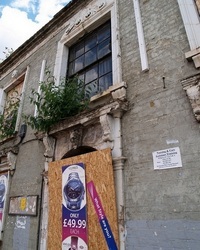 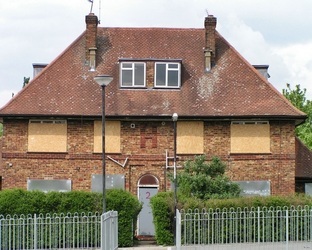 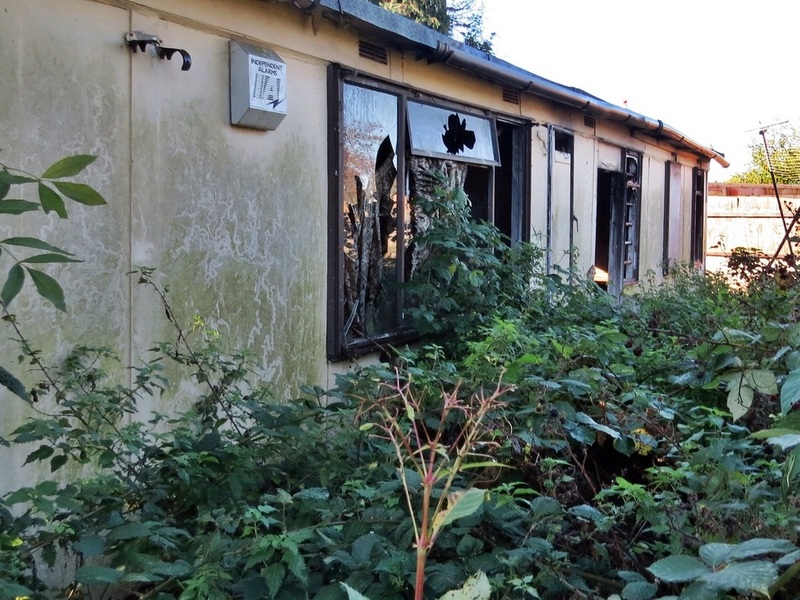 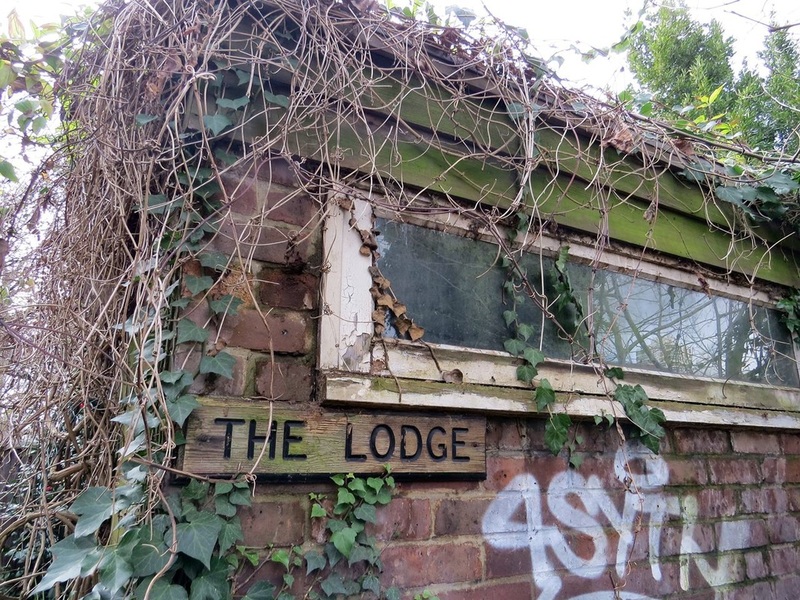 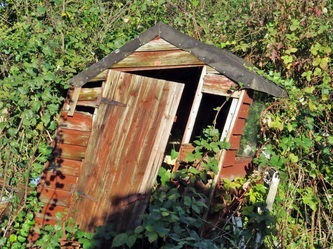 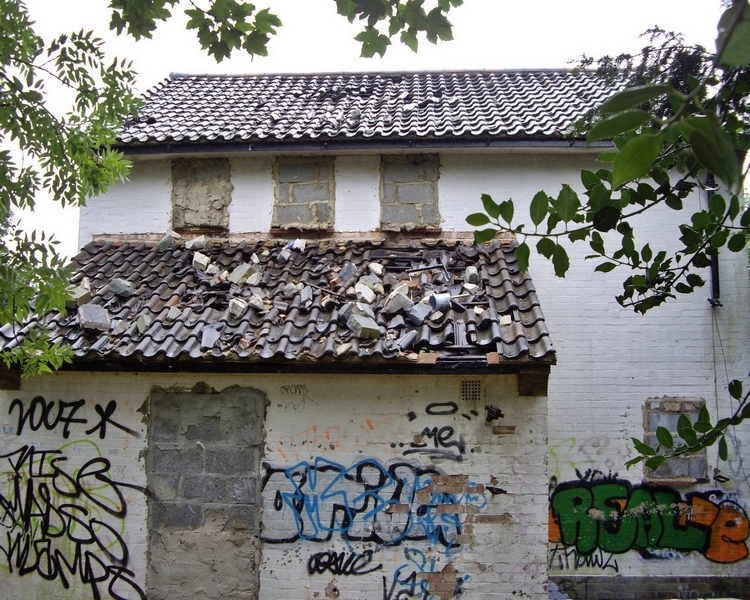 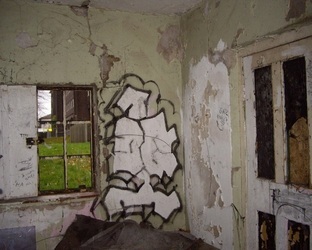 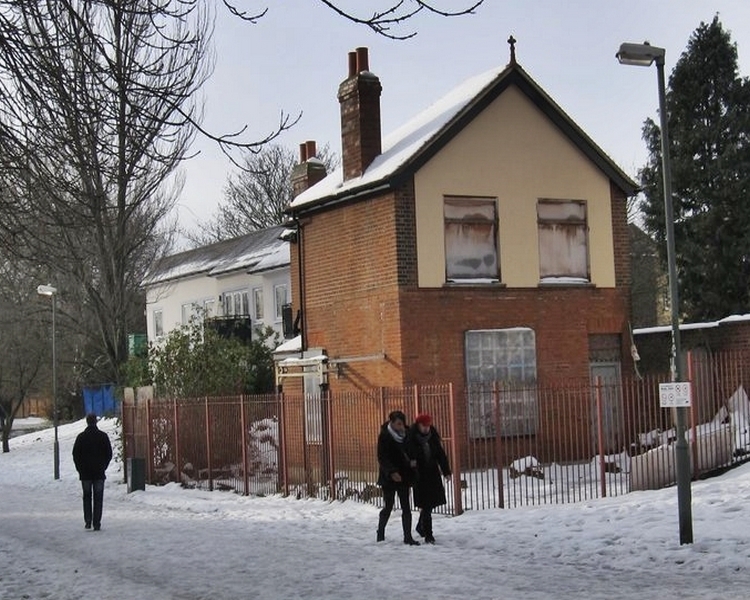 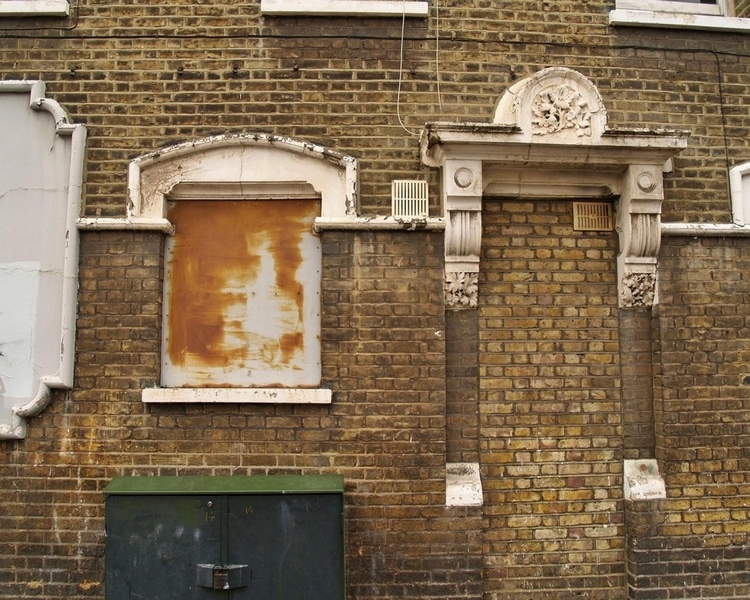 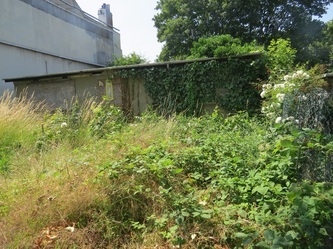 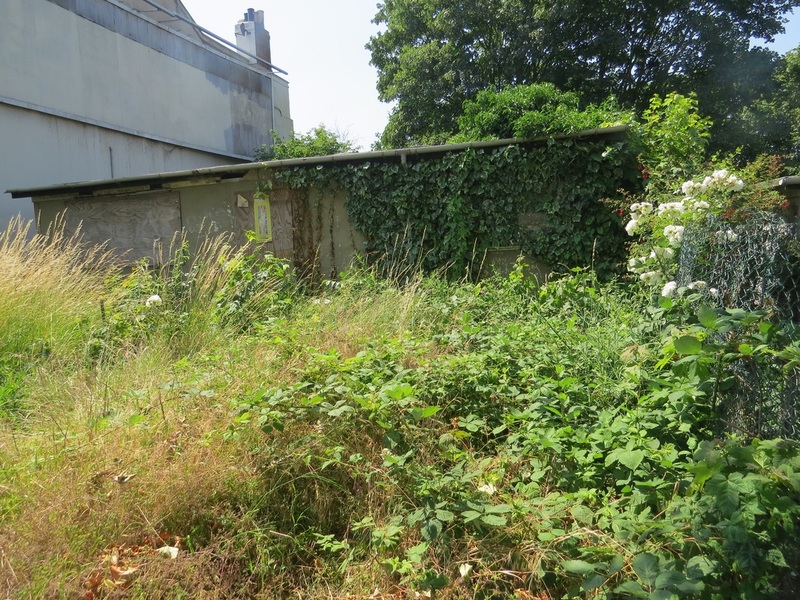 This derelict park keepers house know as “The Lodge” sits approximately in the centre of a large plot that was formally part of the original Southwark Park. 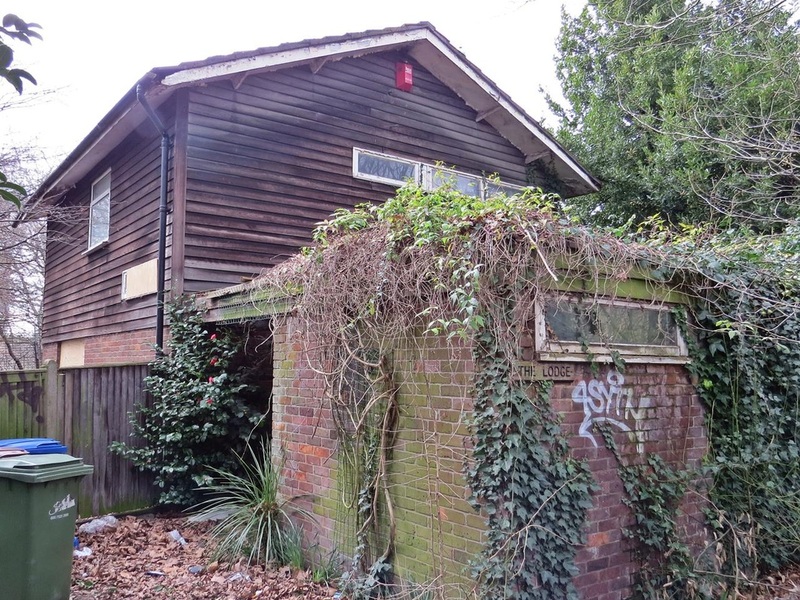 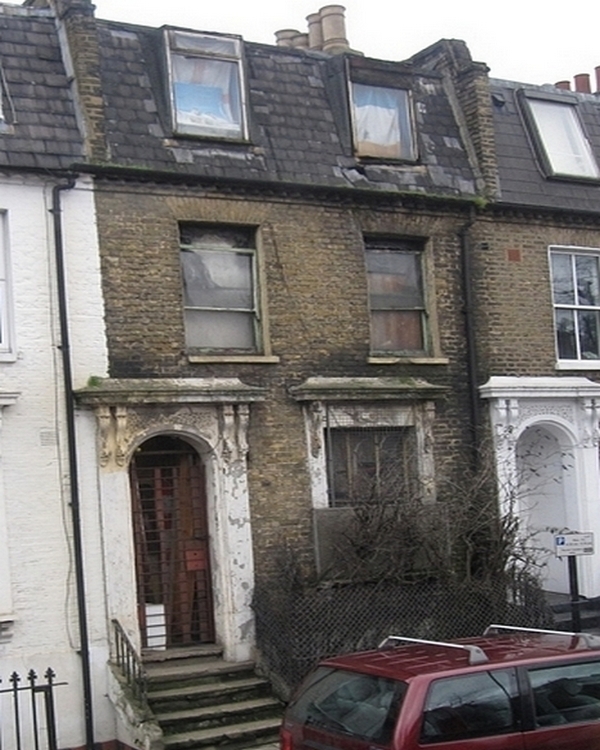 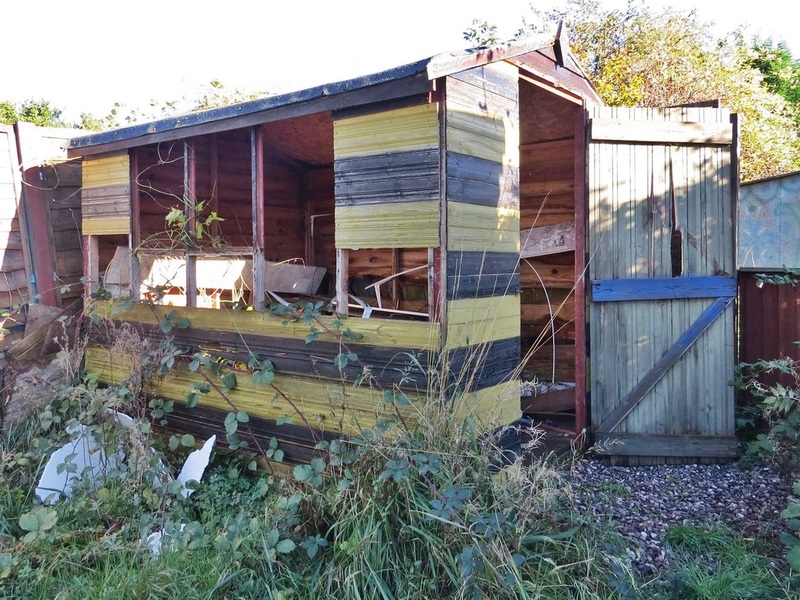 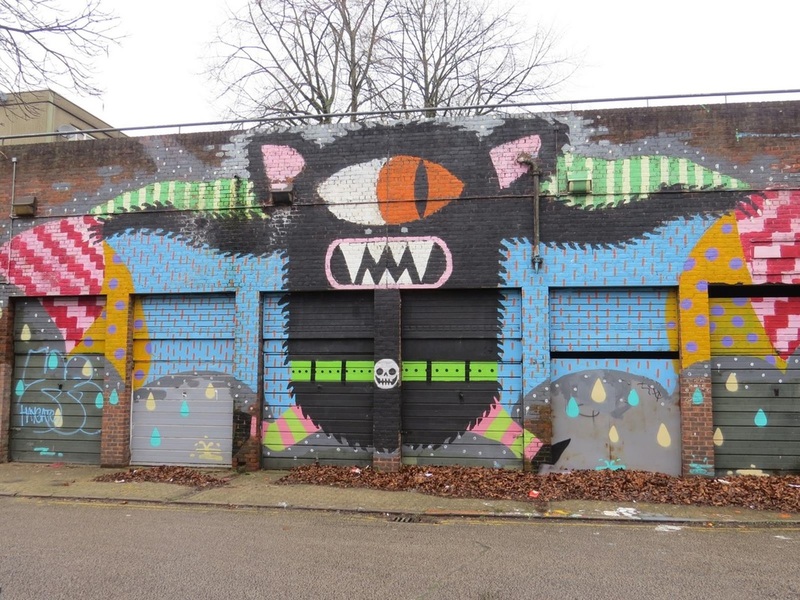 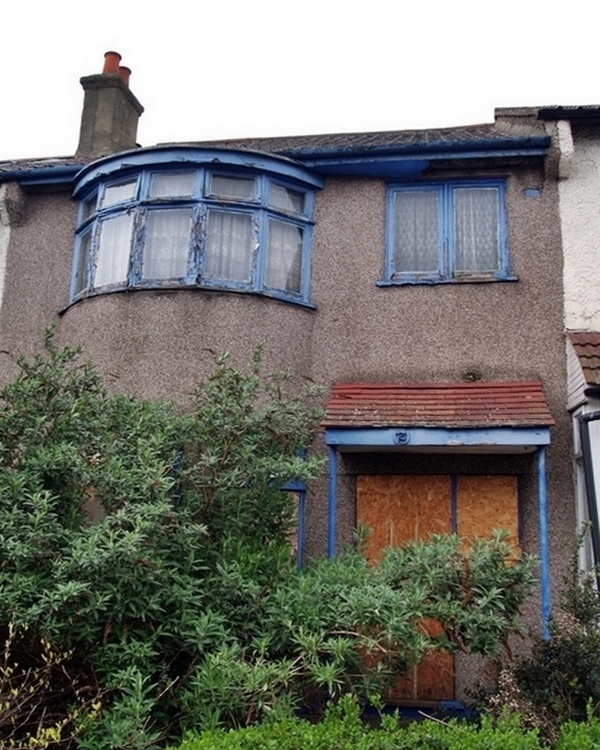 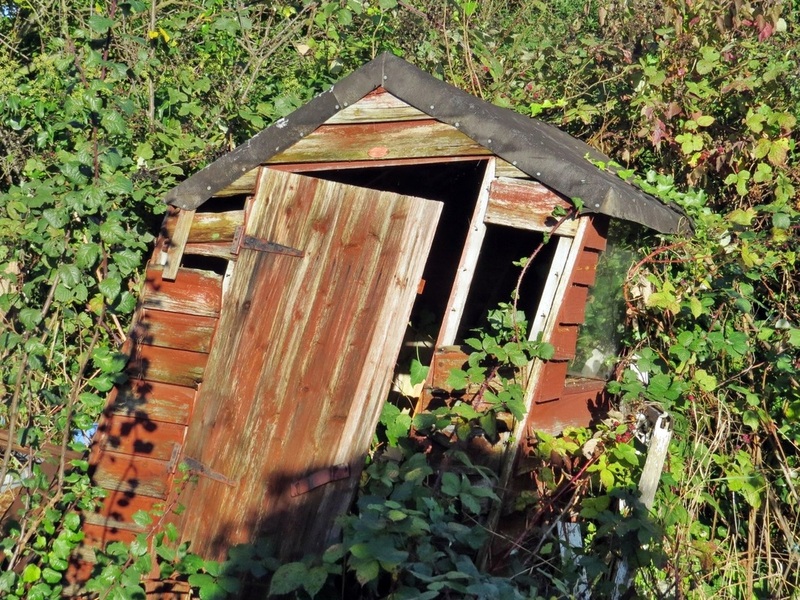 There are plans to demolish this building (and garden shed!) 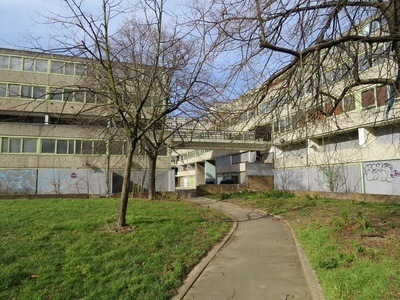 and build a yoga centre on the ground floor with dining facilities with a courtyard facing over the Southwark Park. 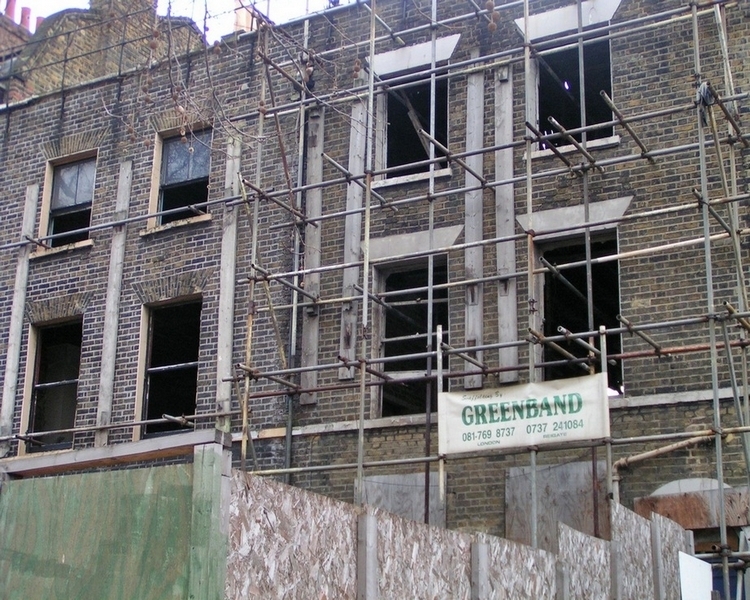 There are also to be 8 residential apartments on three floors above the yoga centre. 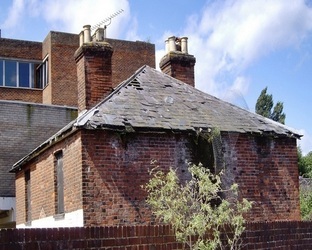 This sorry looking building used to be the stables of Worcester Park House and where the coachman lived. 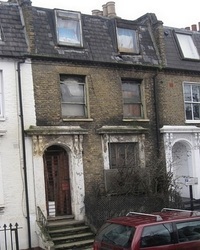 Then when the landlord switched to a car it became the garage and home of the chauffeur. 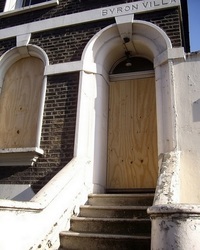 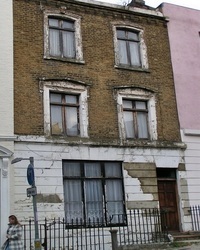 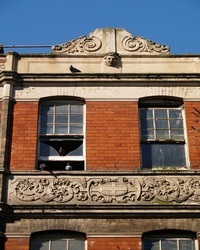 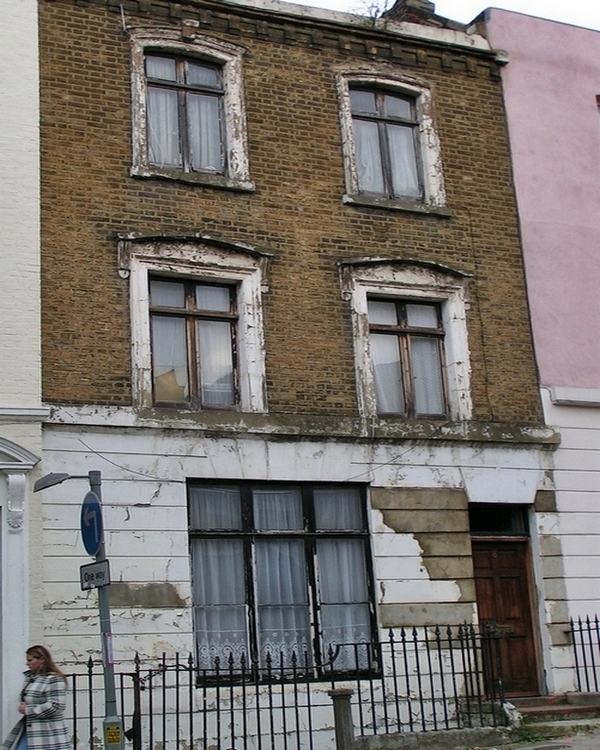 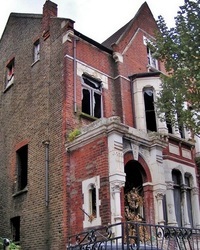 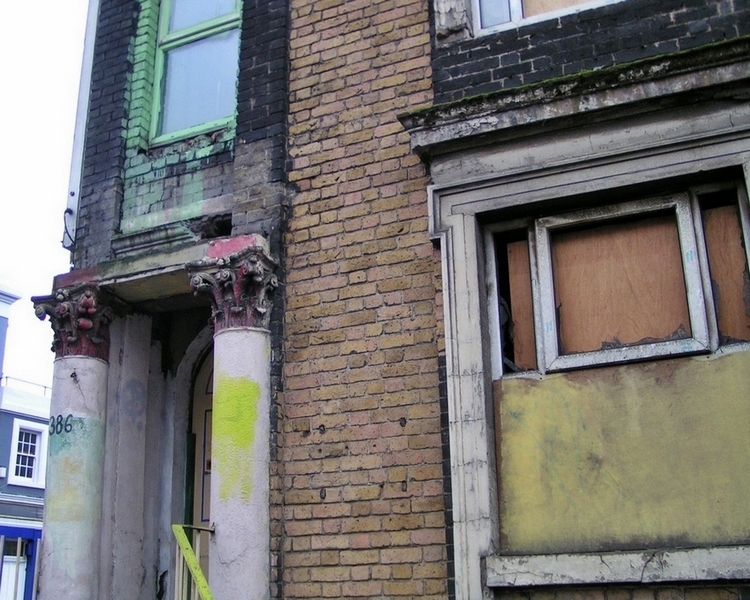 The building is in extremely poor (and dangerous) condition although its survived longer than the house that it served. 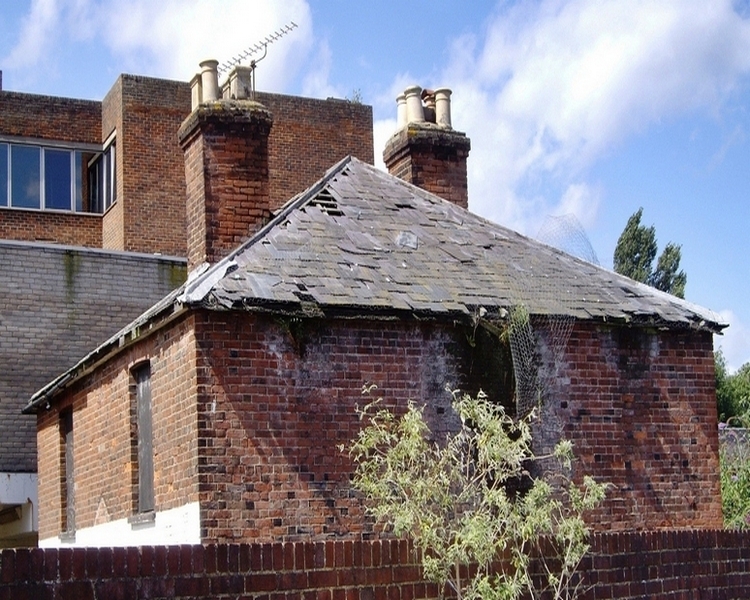 The imposing 30 room Worcester Park House was constructed in 1795. 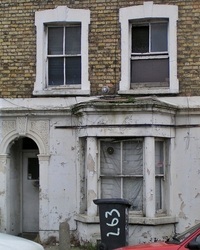 Apparently from 1875 it was inhabited by 8 unmarried brothers and sisters who lived there in style. Then in 1938 the last remaining sibling, laid off the 8 servants and had moved out leaving the place empty. 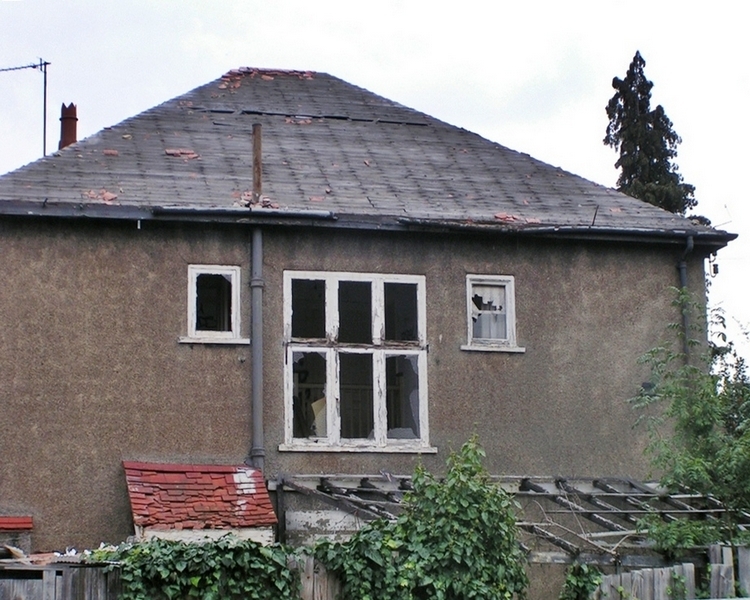 One of the wings was hit by a bomb in the war and in 1948 the whole place burnt down. 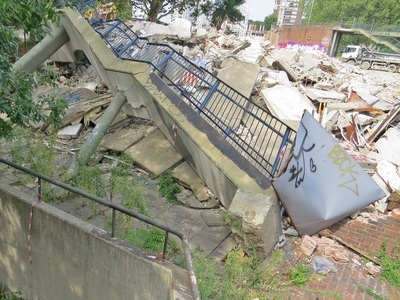 The ornamental lake dried up, the ornate balustraded bridge collapsed and nature has taken over the area leaving little clues of any existance of this grand house and its grounds. 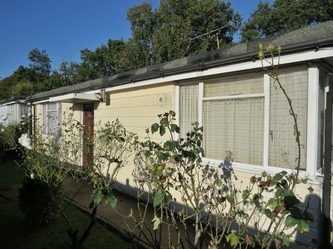 Winston Churchill pledged the fast construction of prefabs to help house people following the destruction caused during the Second World War.150,000 were eventually built around the Uk.The single-story prefabricated bungalows designed by the Ministry of Works; each with two bedrooms, a private garden and an indoor lavatory. 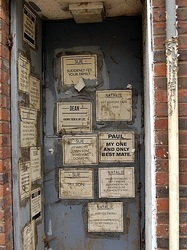 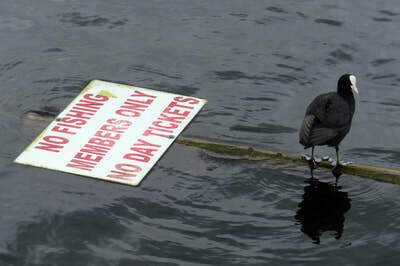 They had a projected lifespan of only a decade though there are still some around the country still standing. 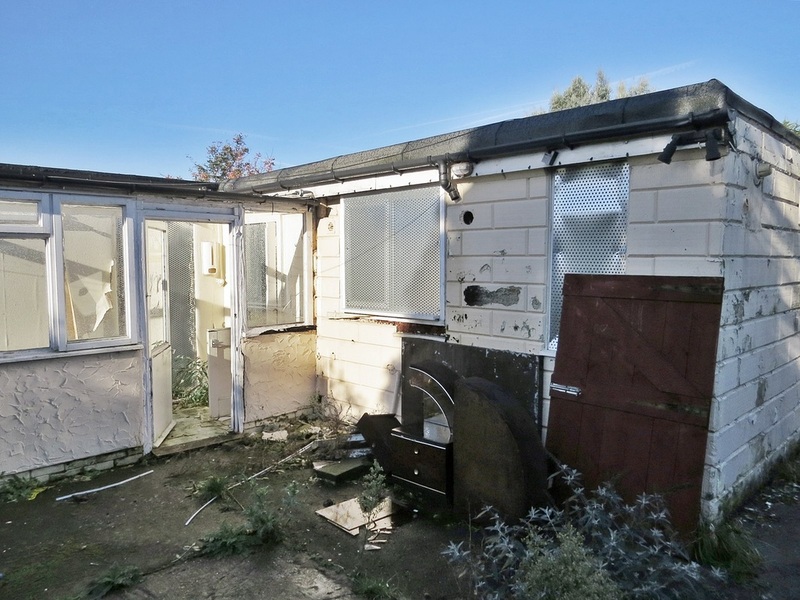 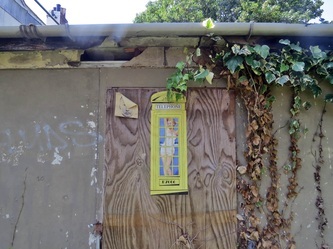 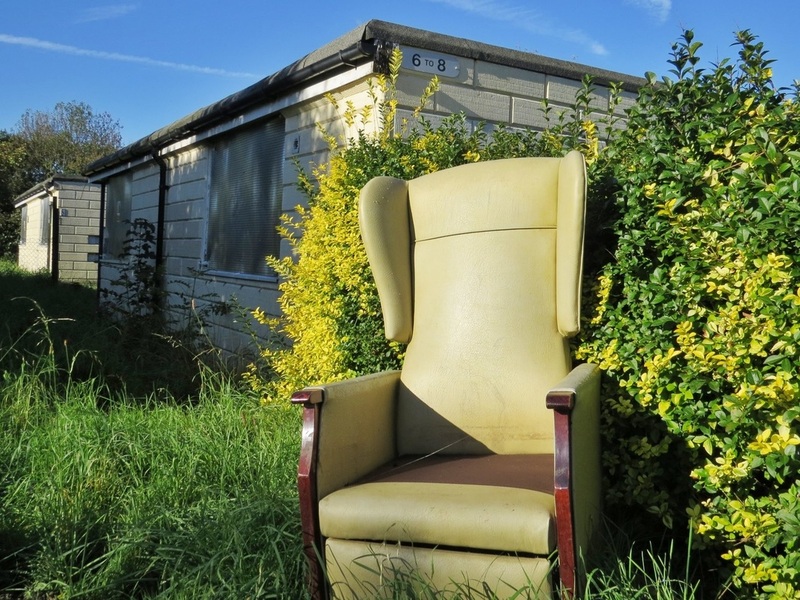 A smattering of survivors can still be spotted around SE London - Dulwich, Peckham and Nunhead with one whole estate (The Excalibur) still surviving in Catford although prefabs are becoming endangered. The Excalibur Estate with its street named after characters from Arthurian legend was constructed on parkland in Catford in 1945-46 by German and Italian prisoners of war and consists of 187 bungalows. 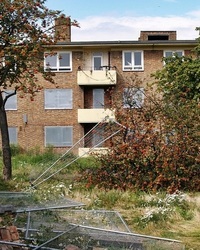 In a 1946 letter, the London County Council promised to return it to parkland once the temporary houses had been cleared.The temporary houses have been around far longer than intended but redevelopment of the land could still meet legal opposition from campaigners. 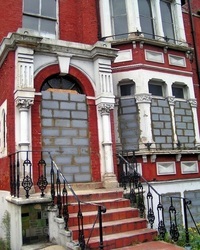 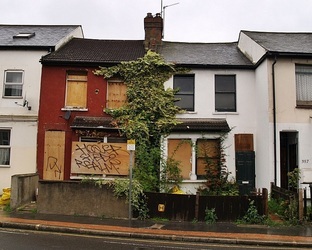 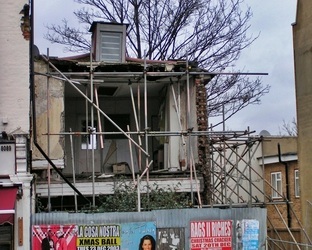 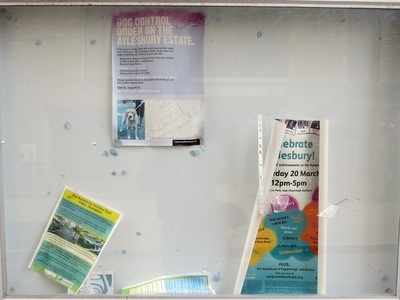 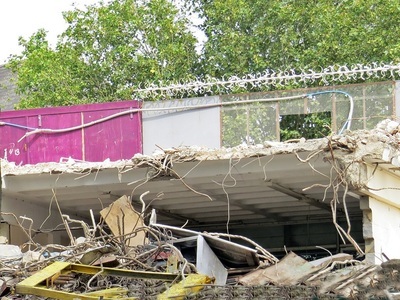 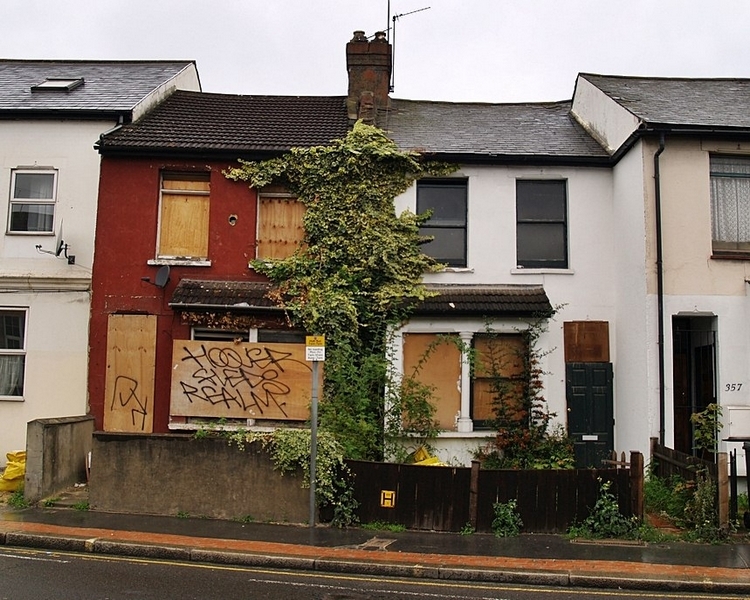 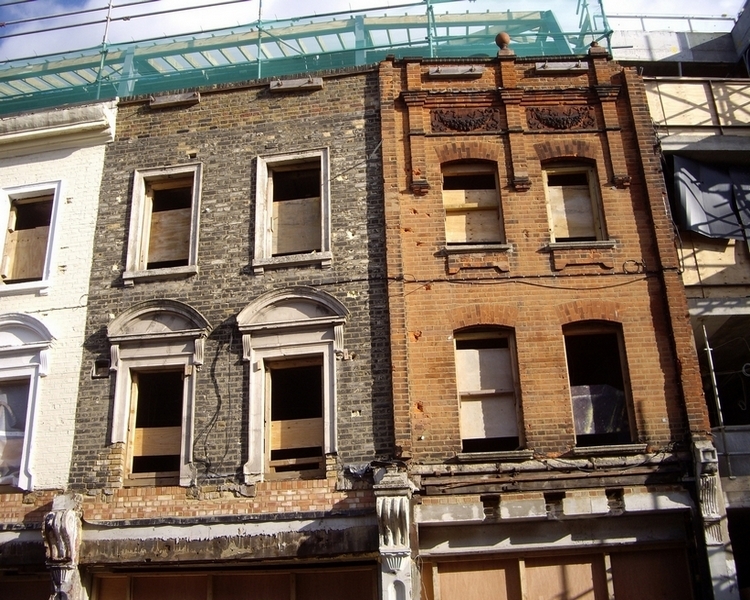 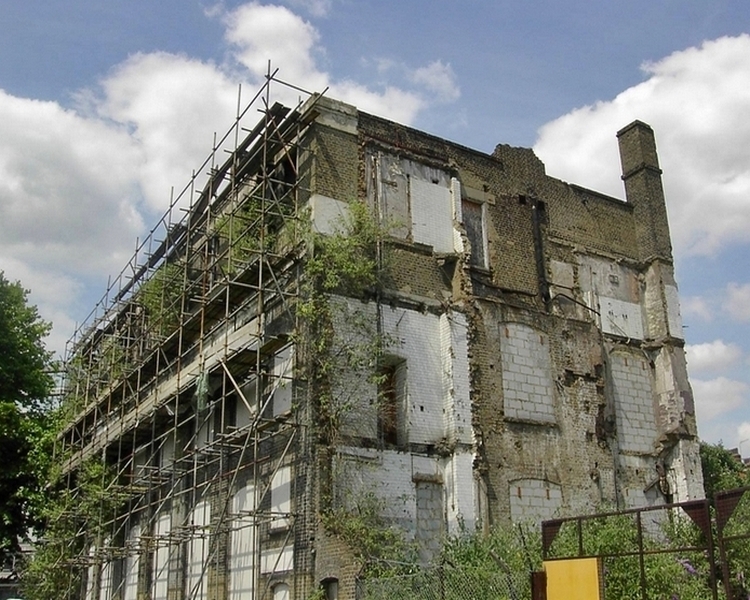 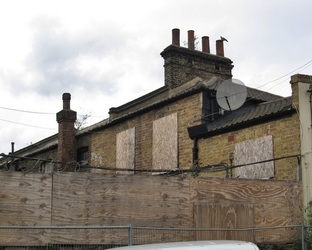 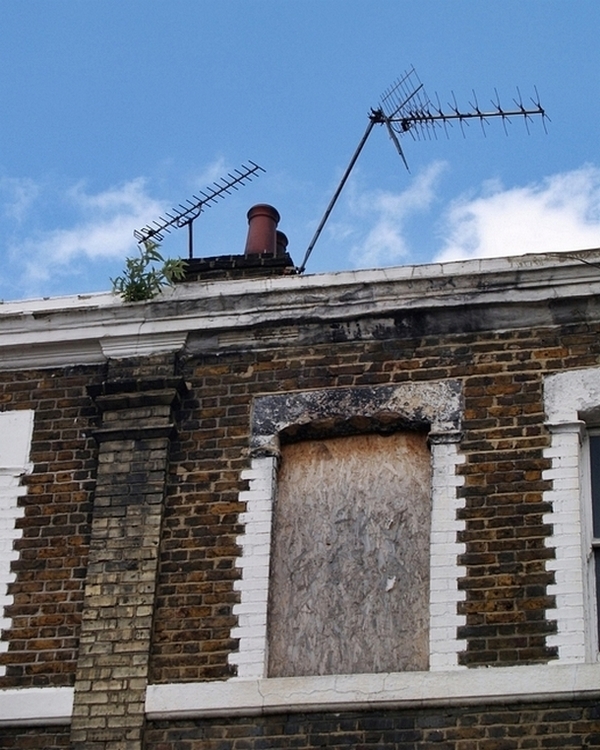 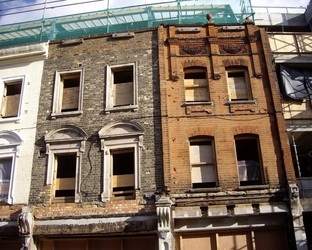 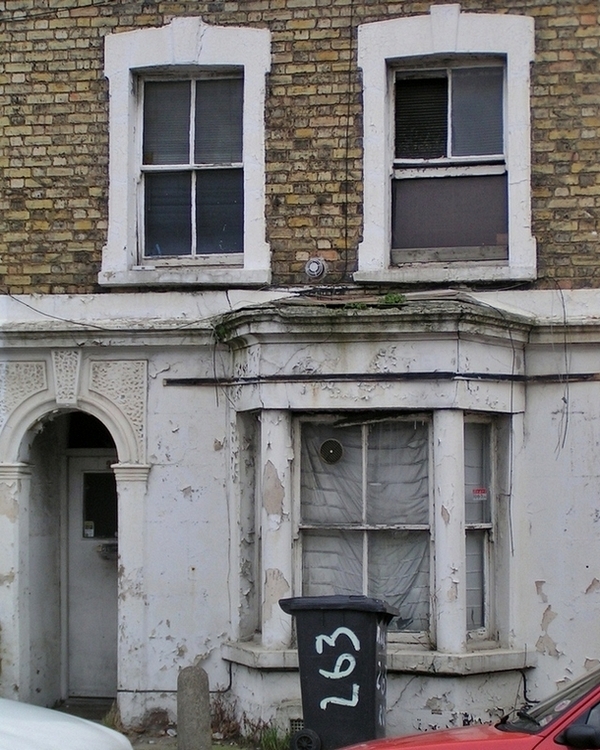 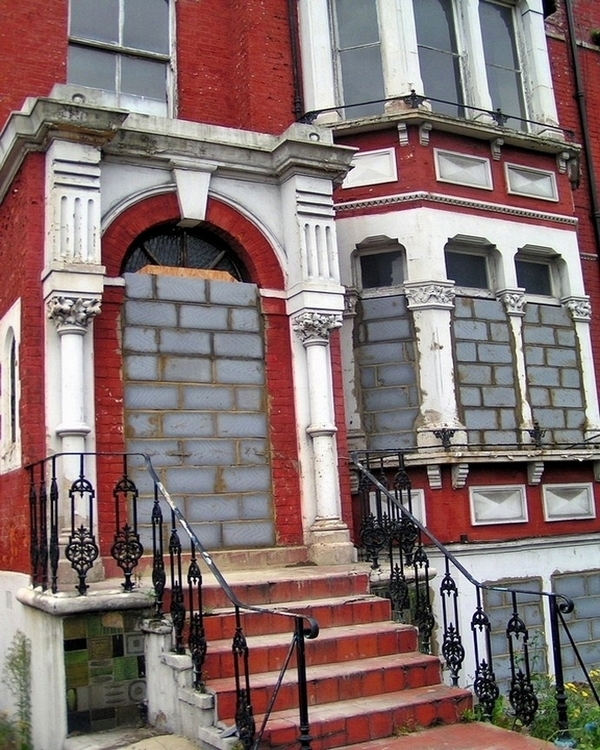 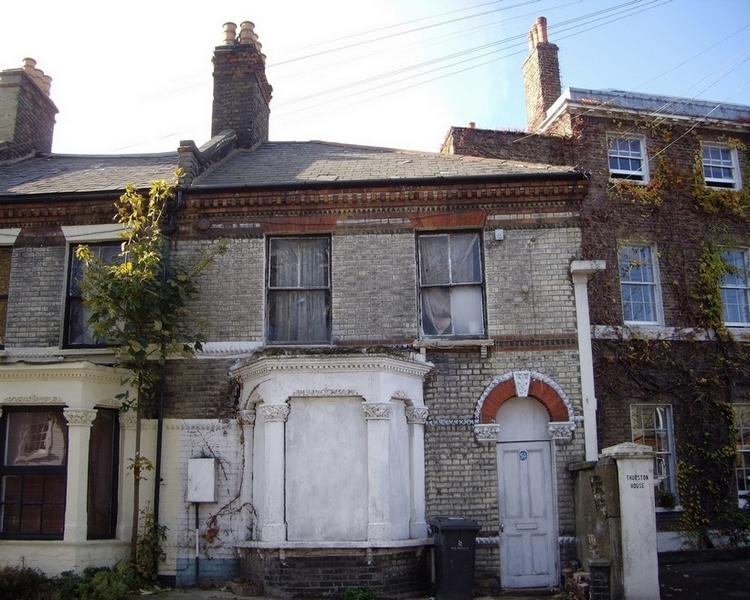 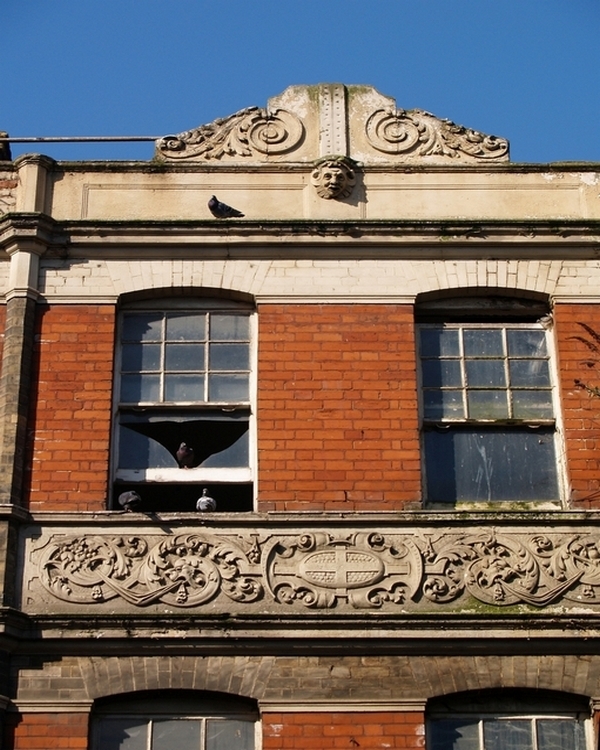 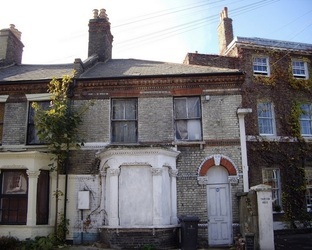 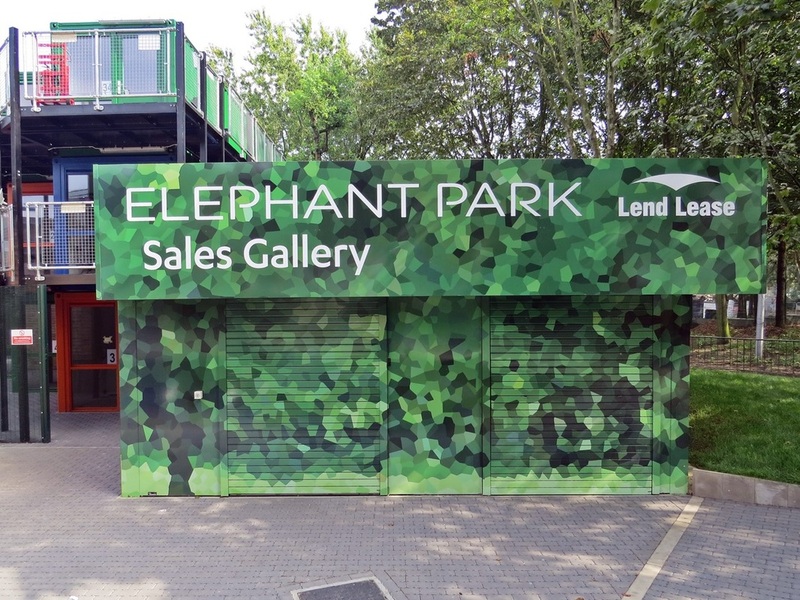 The London Borough of Lewisham proposed to demolish all the properties & build new homes as they claim that it would not be financially viable to bring the properties up to the Decent Homes Standard. 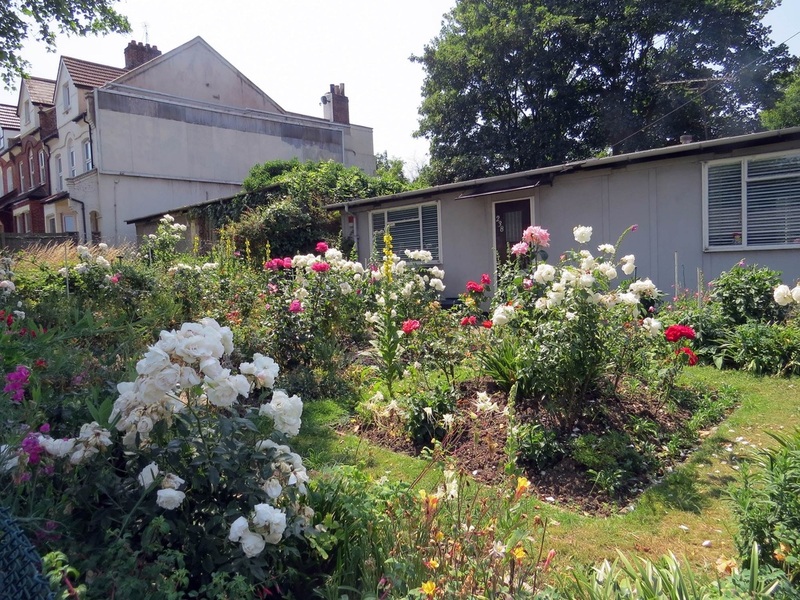 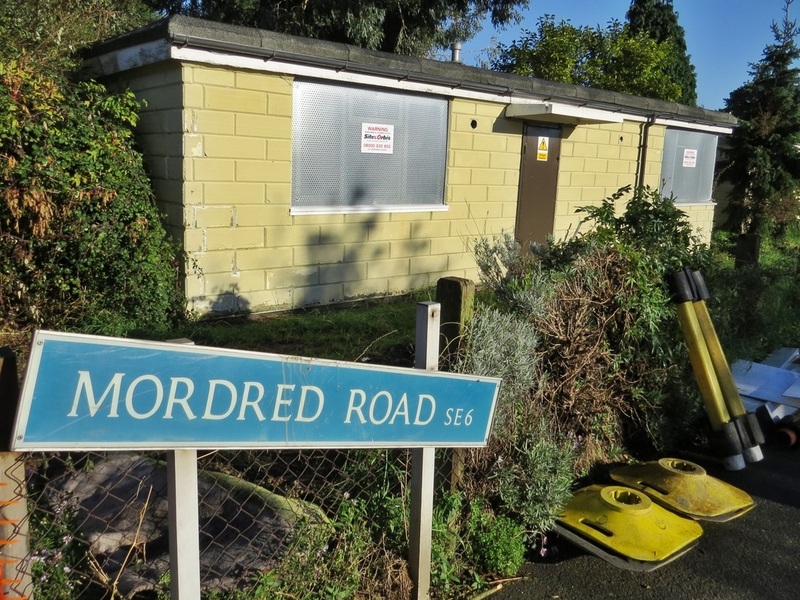 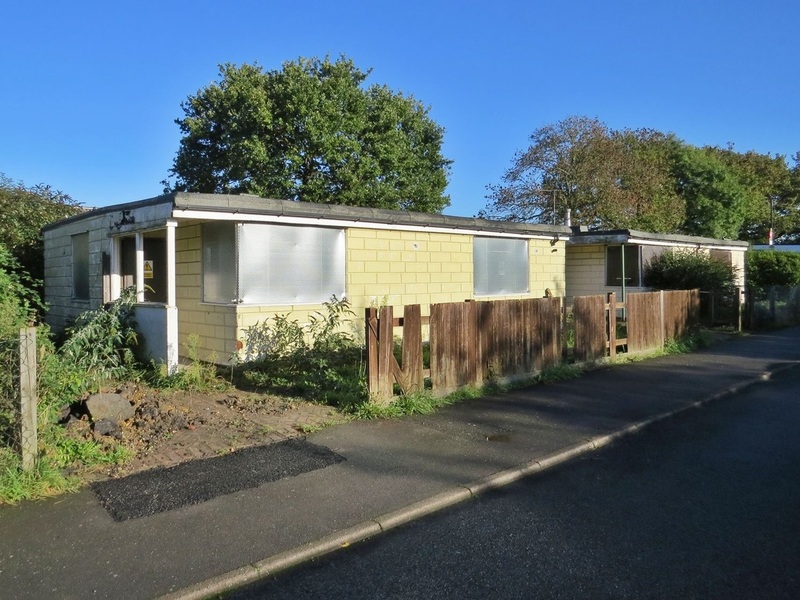 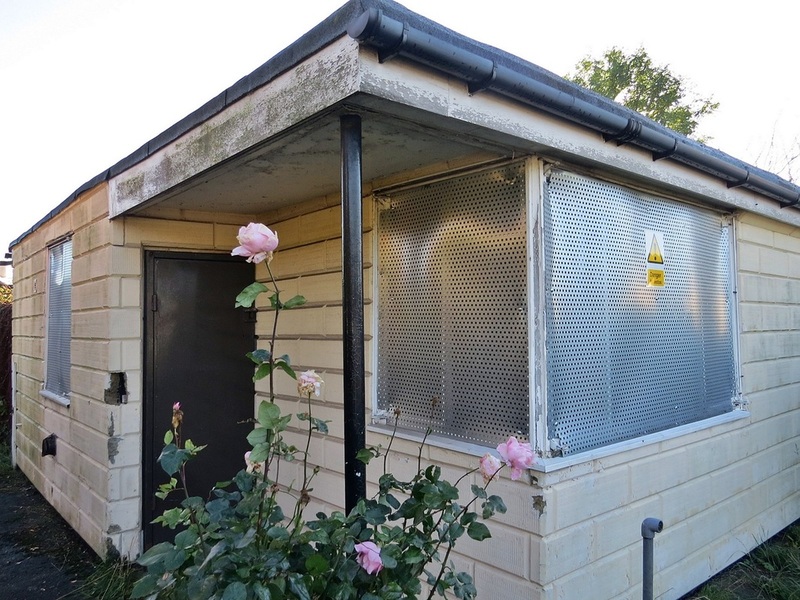 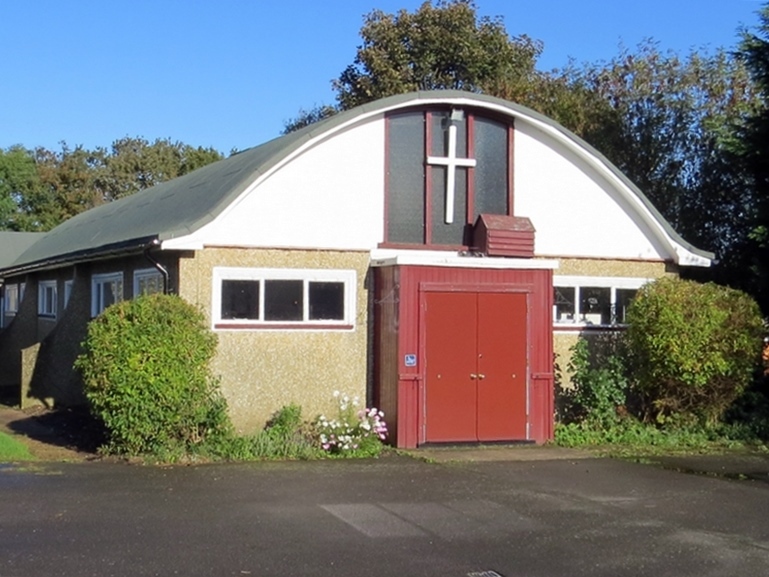 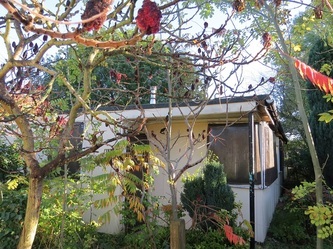 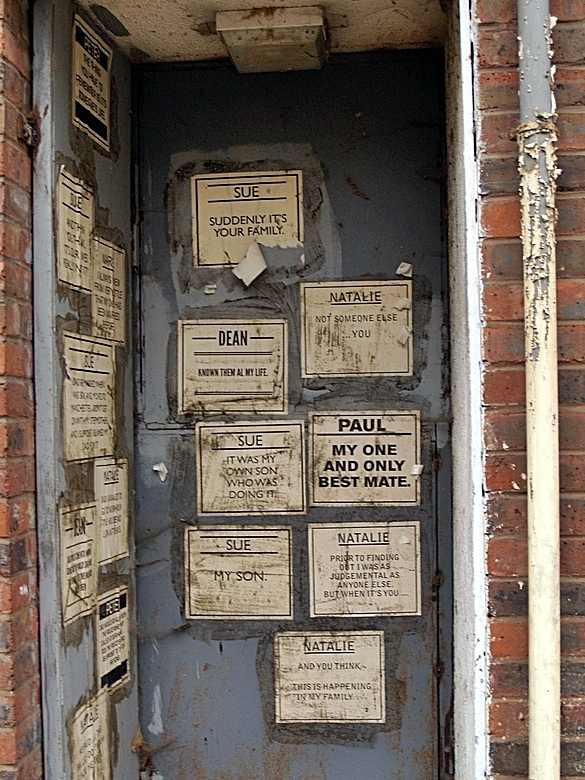 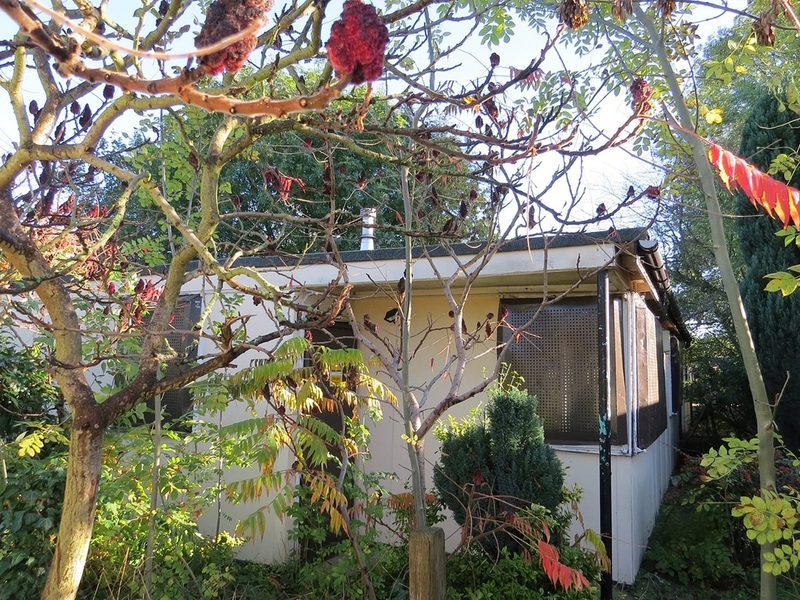 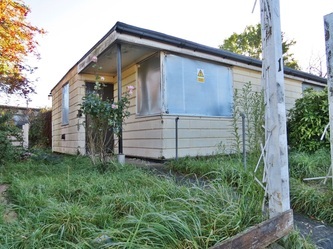 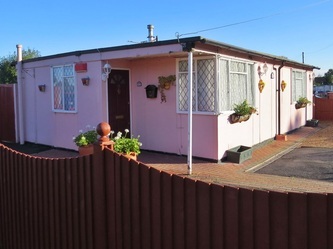 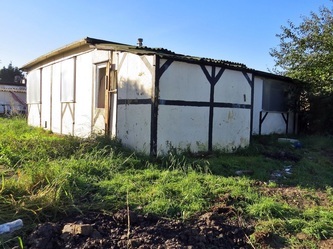 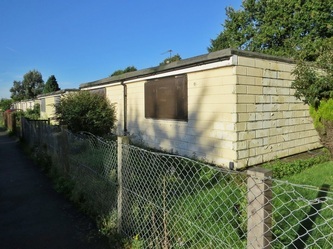 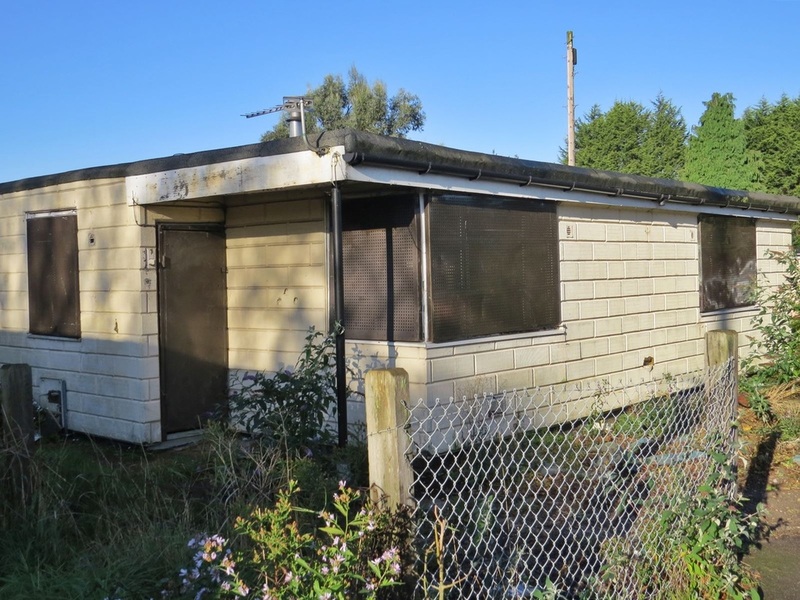 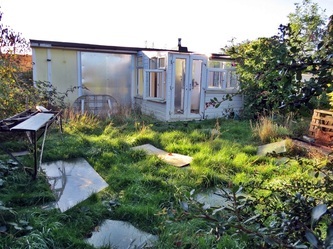 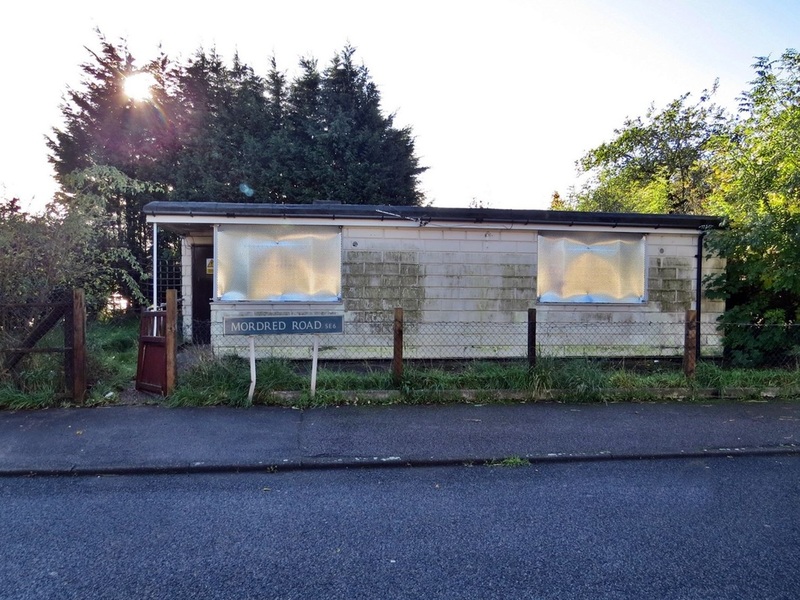 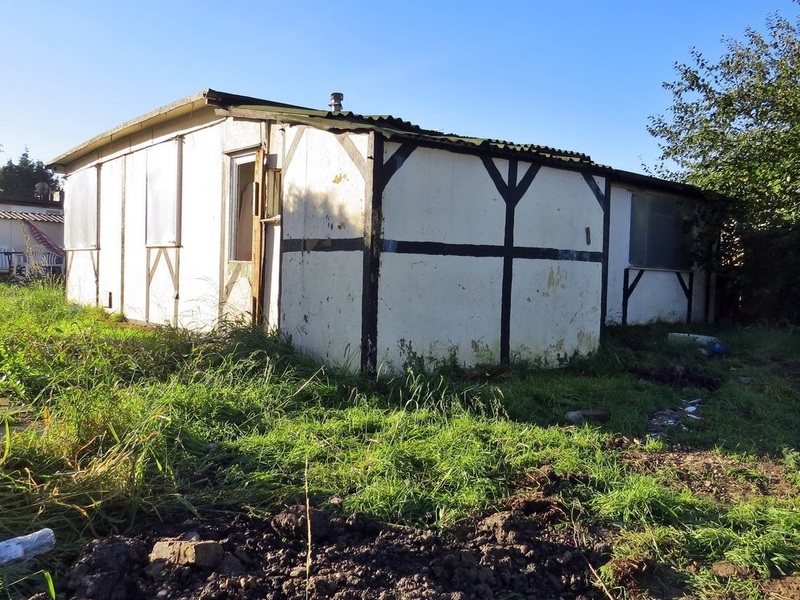 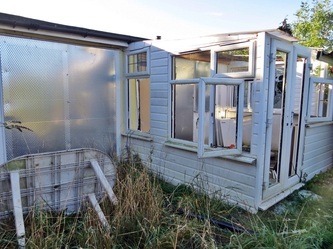 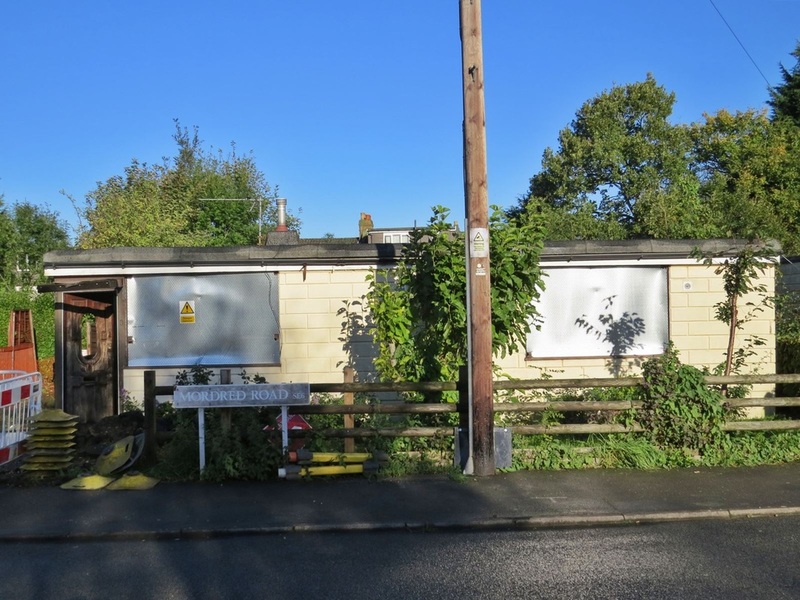 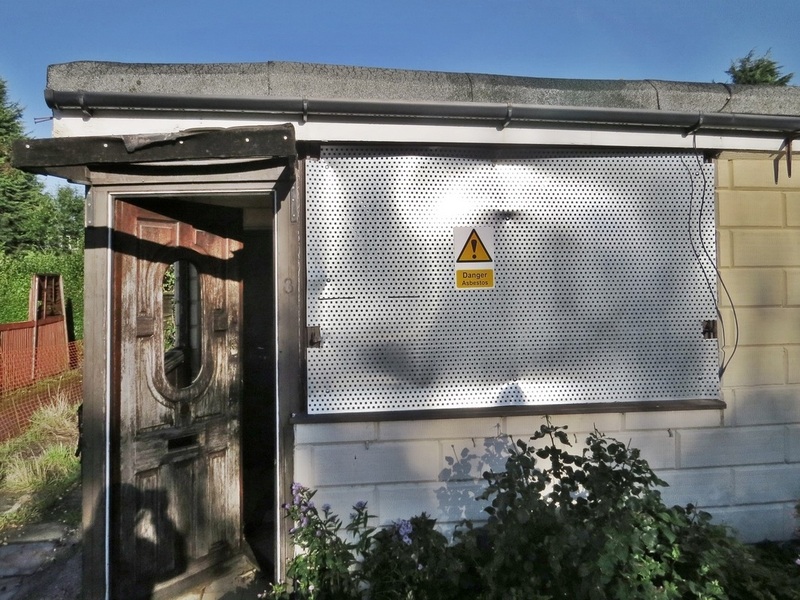 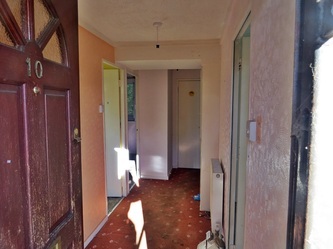 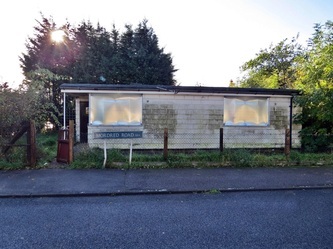 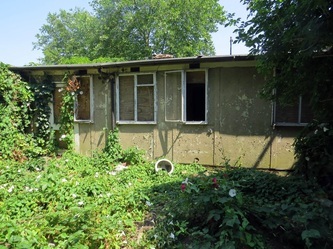 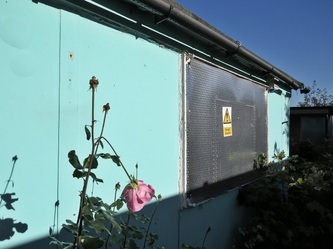 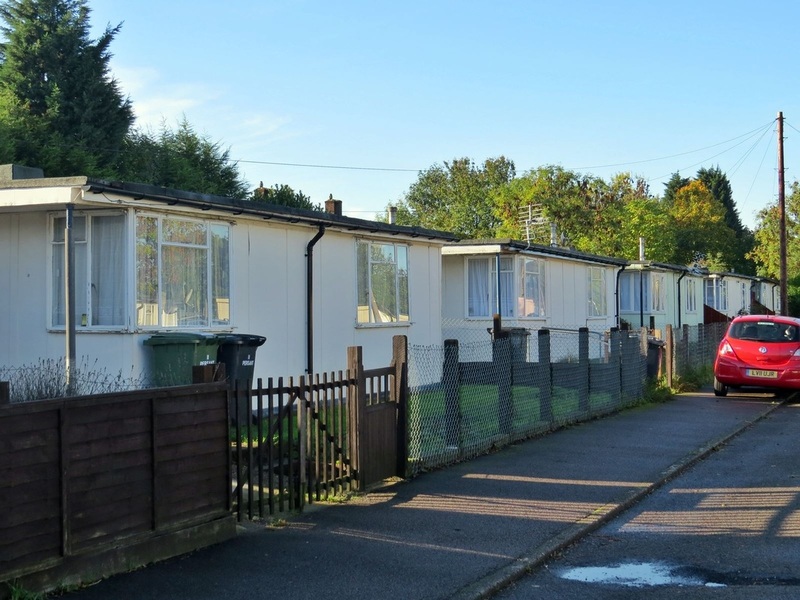 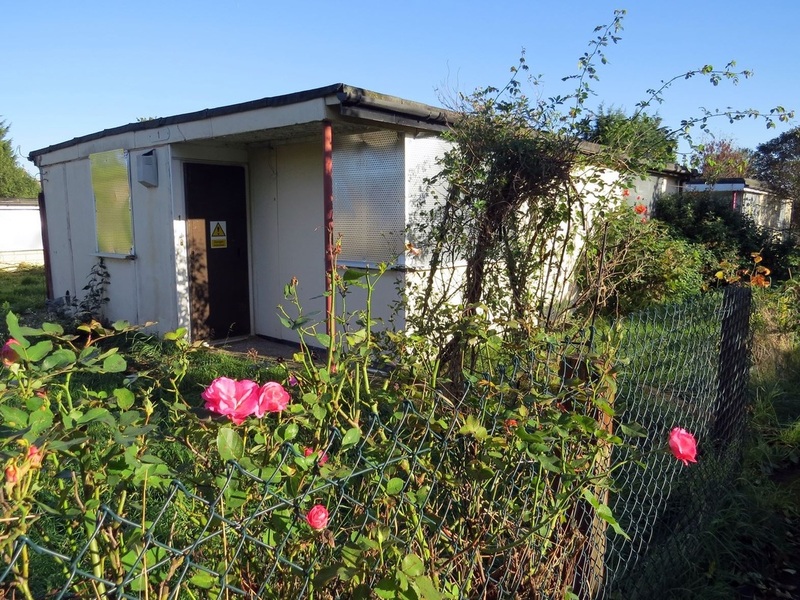 English Heritage have however listed six prefabs, exempting them from demolition. 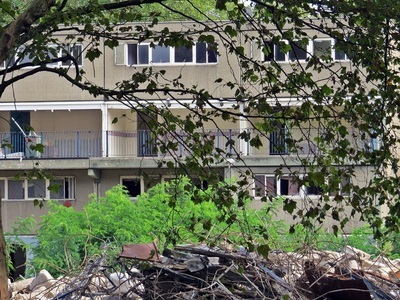 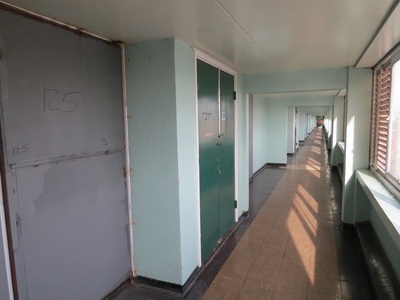 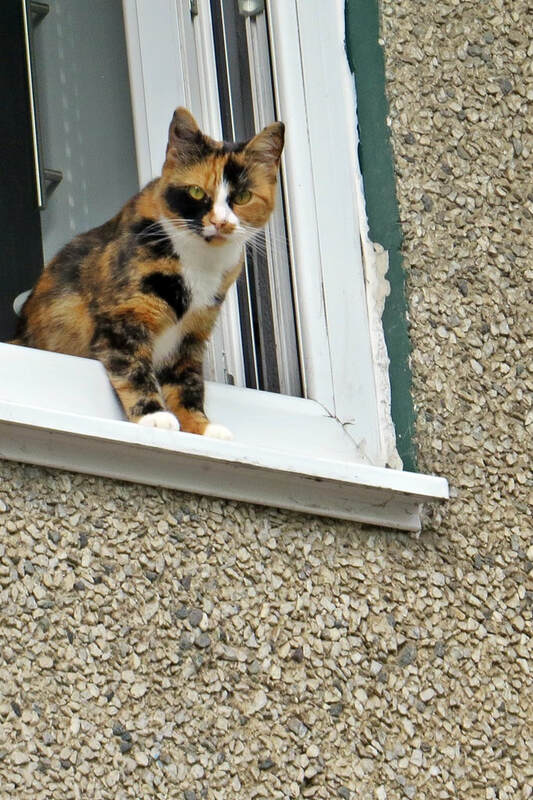 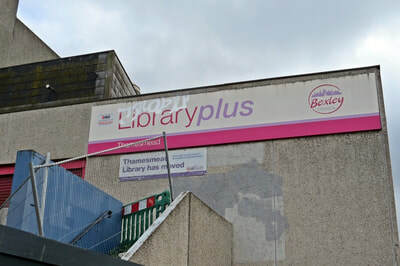 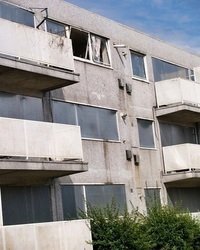 The council have begun relocating residents in phases in preparation for demolition. 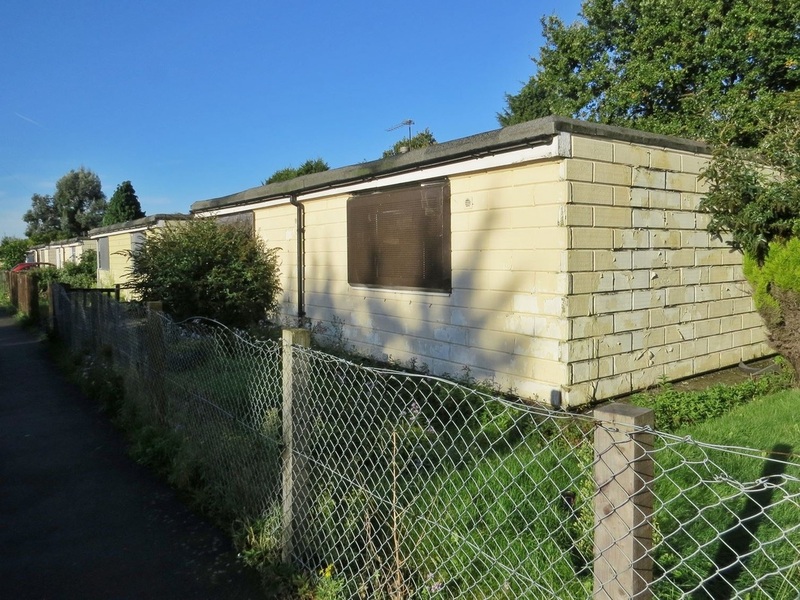 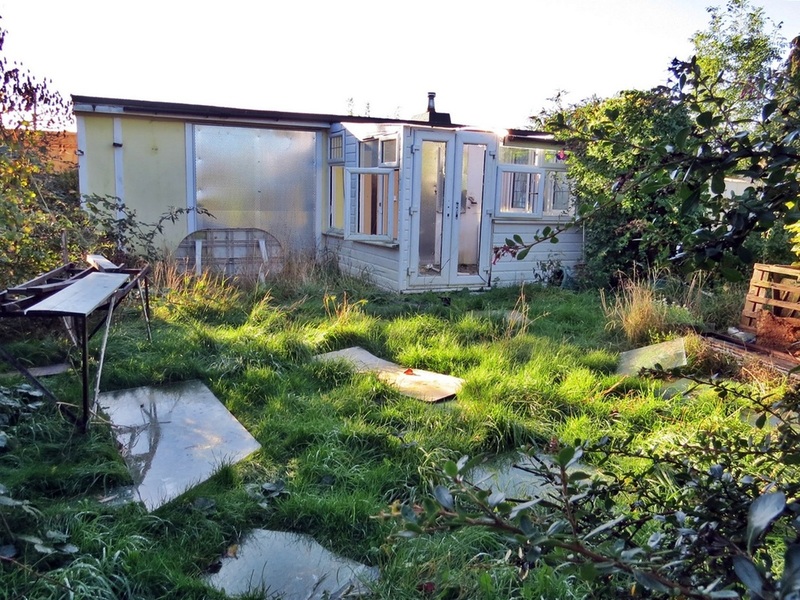 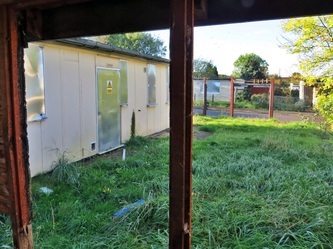 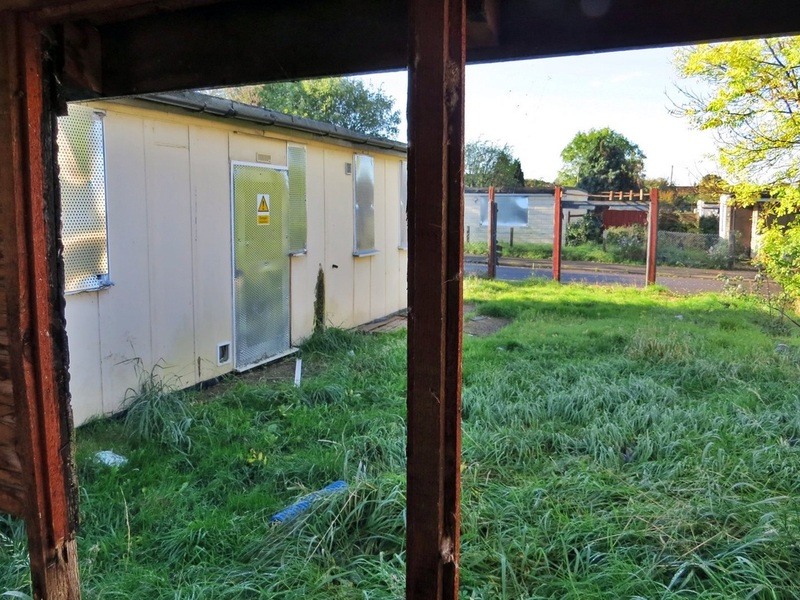 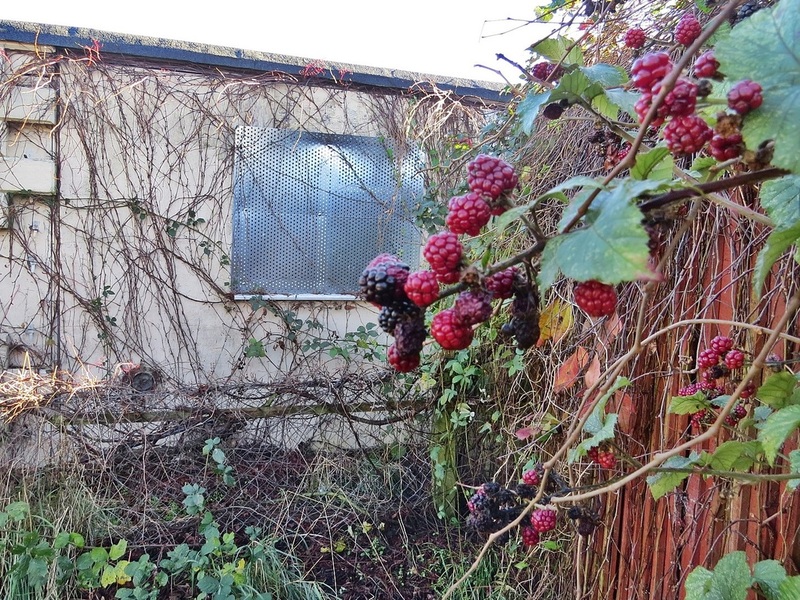 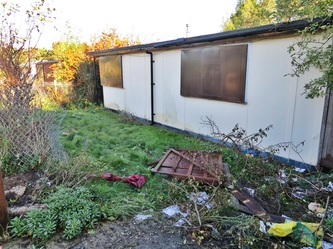 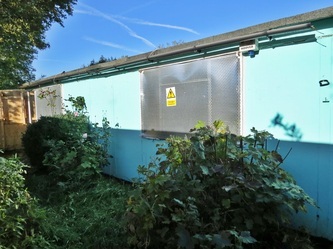 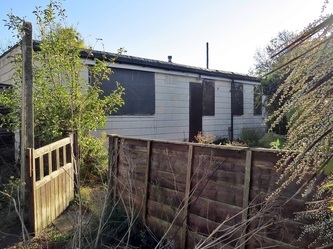 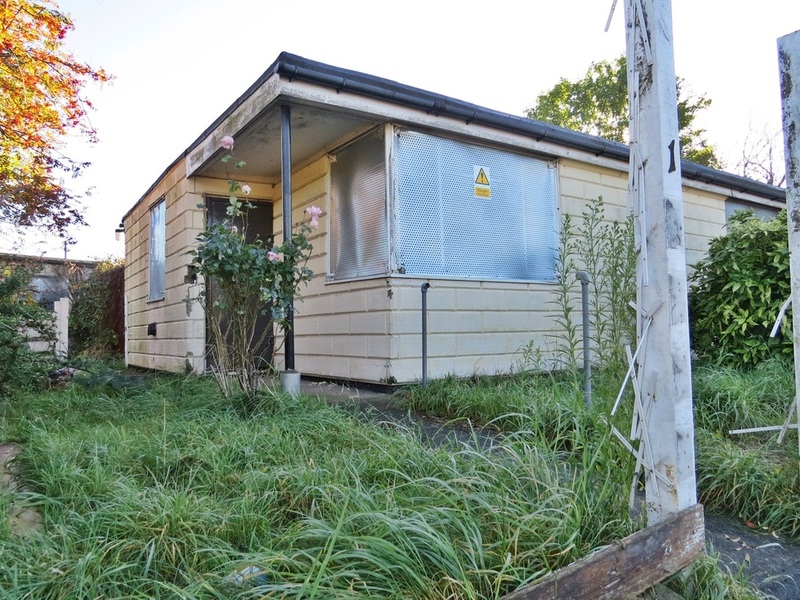 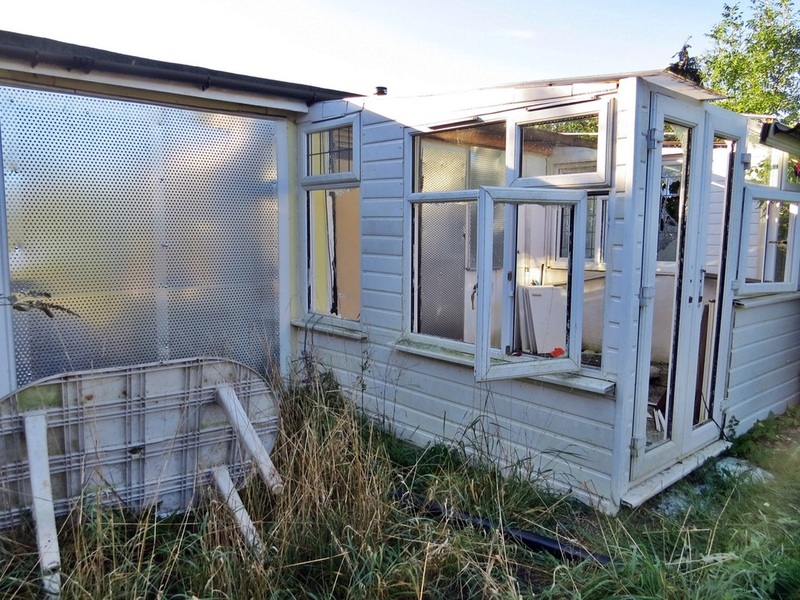 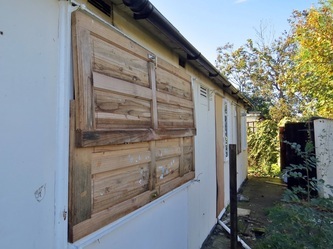 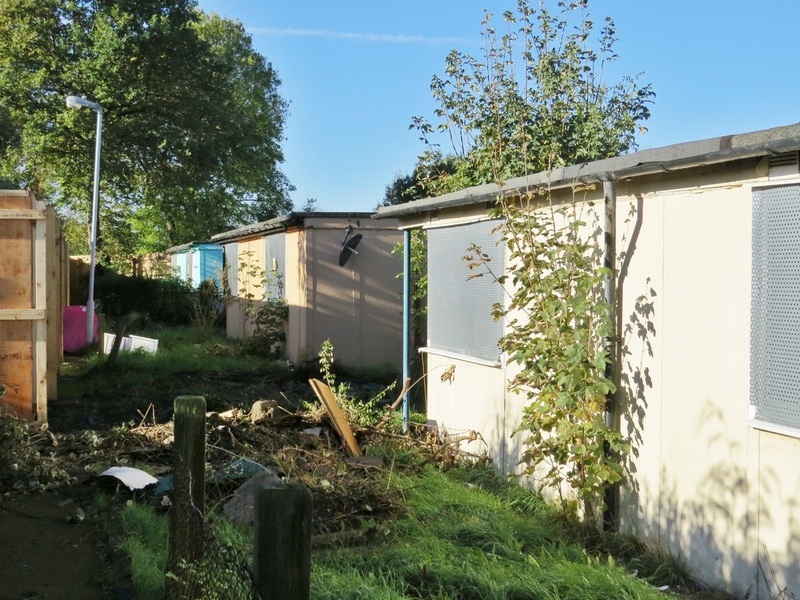 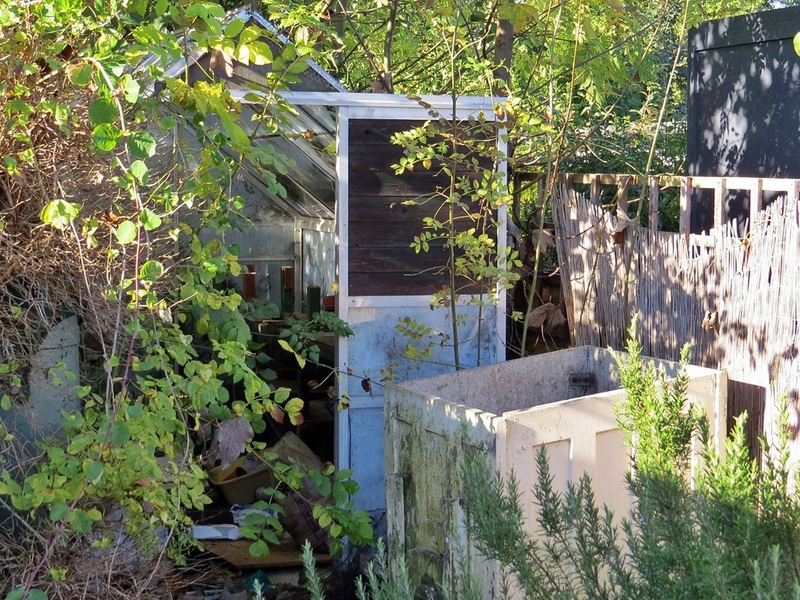 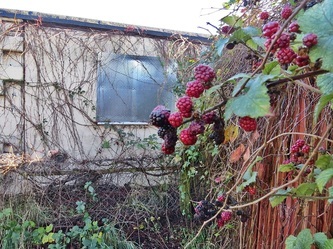 Many of the prefabs are boarded up looking sad with their once well maintained gardens becoming overgrown and broken down fences. 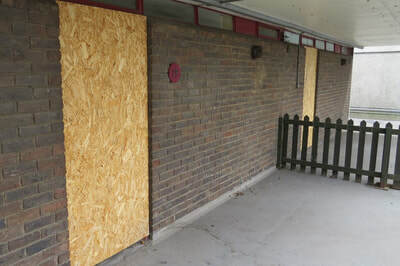 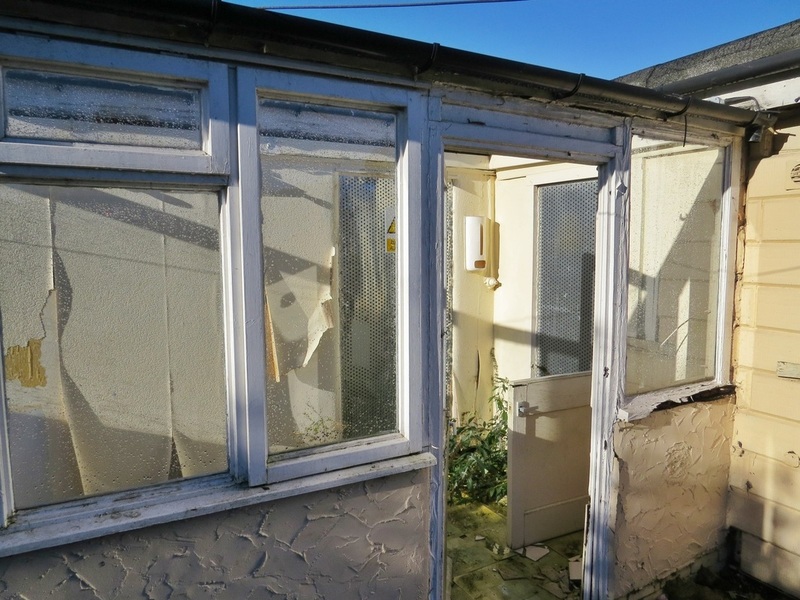 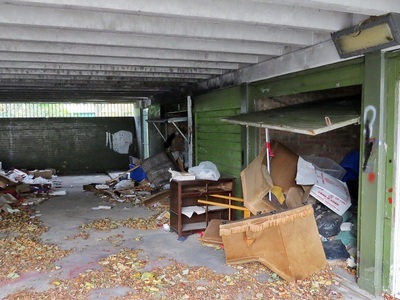 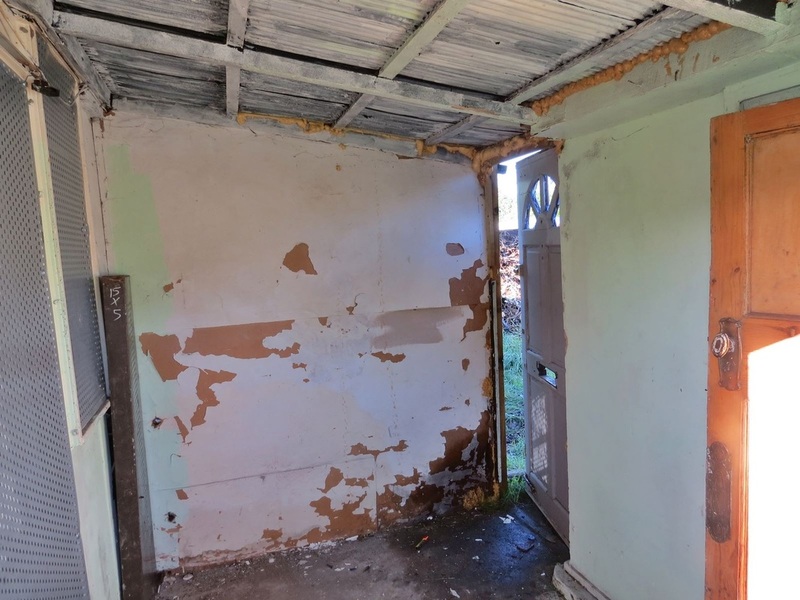 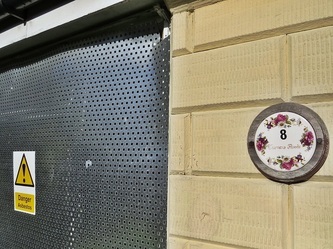 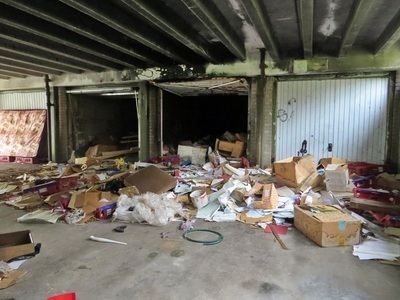 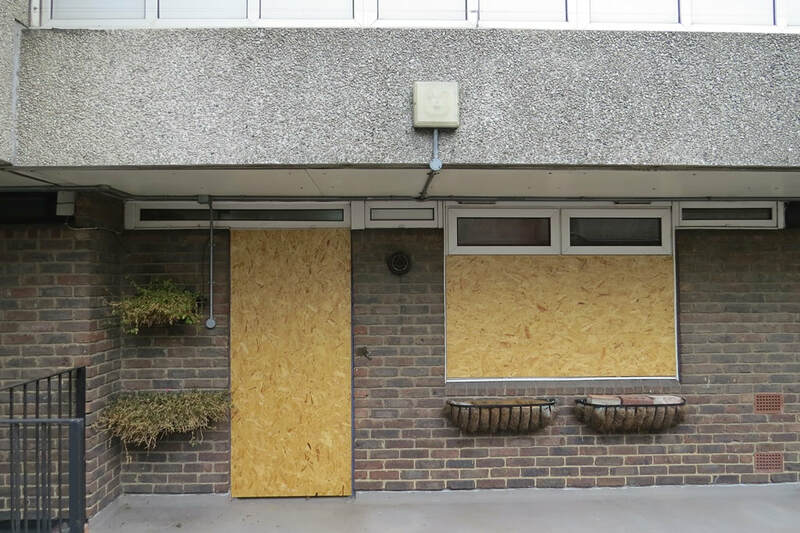 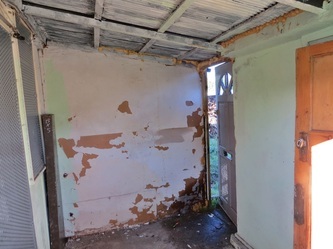 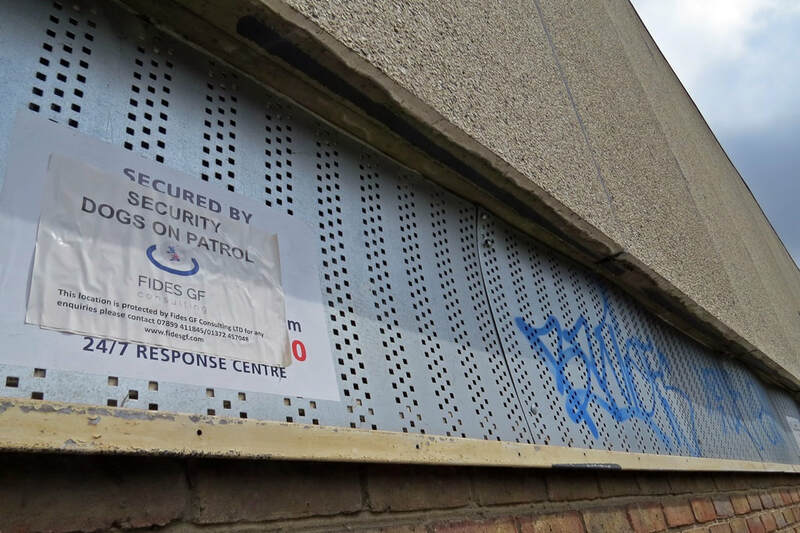 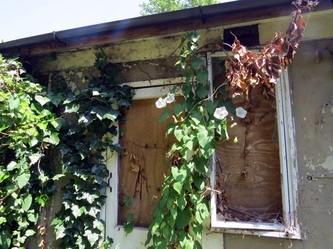 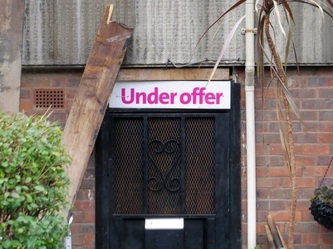 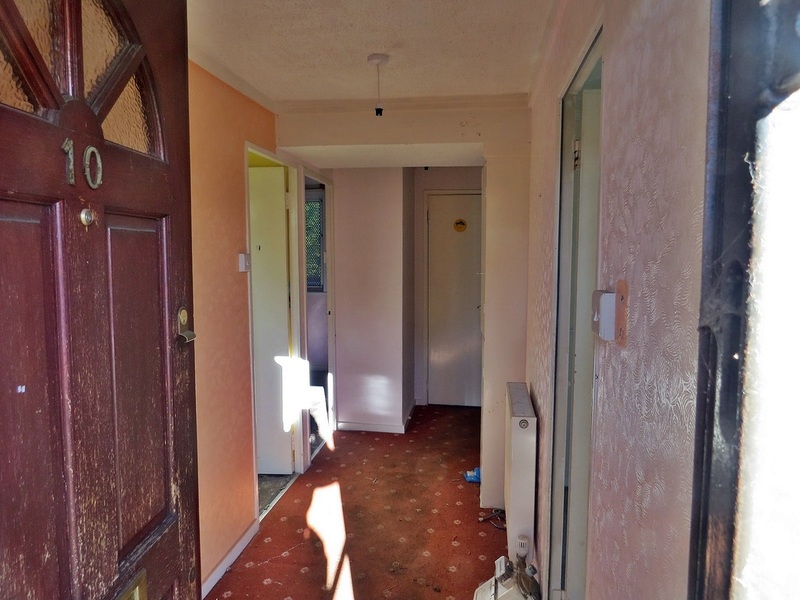 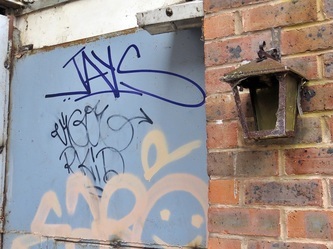 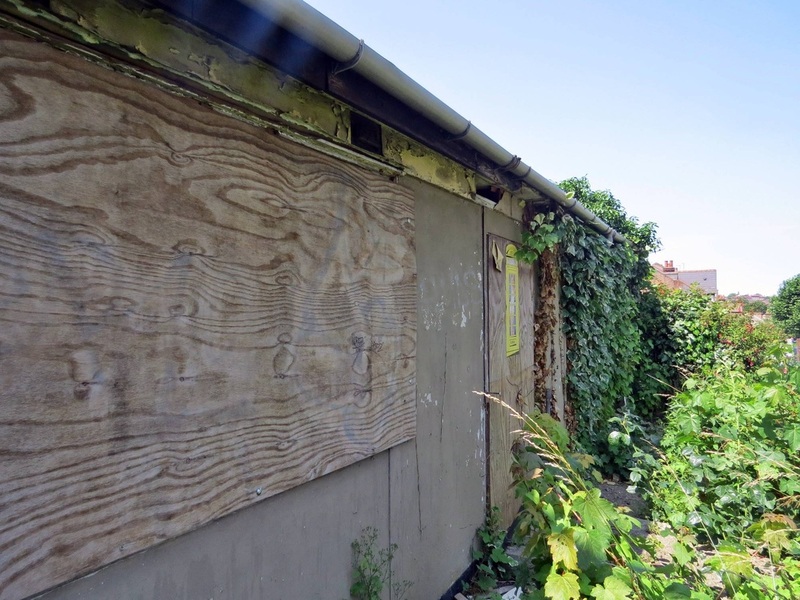 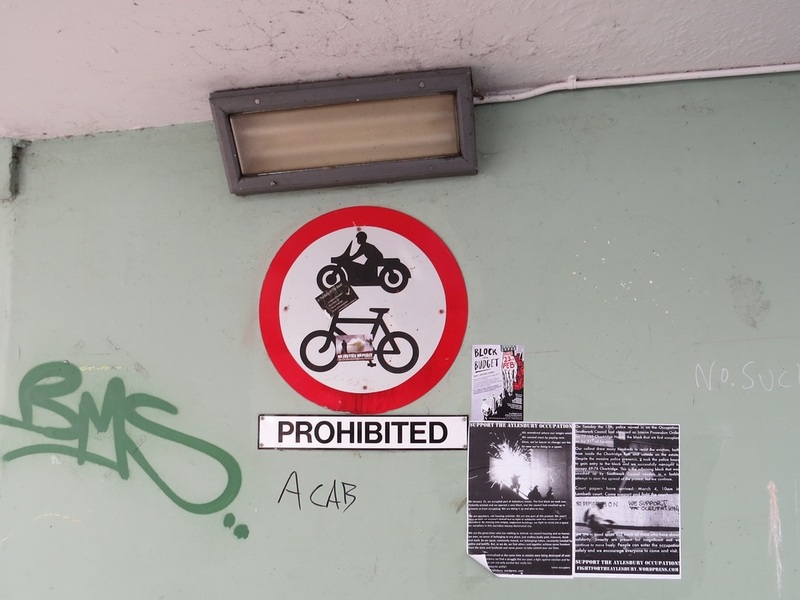 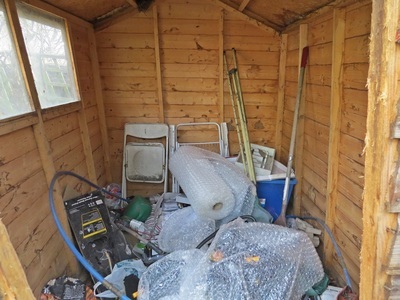 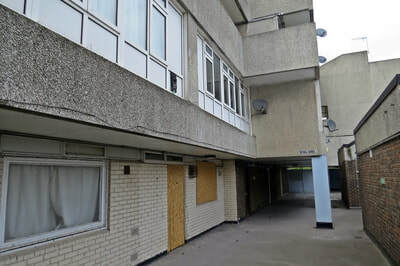 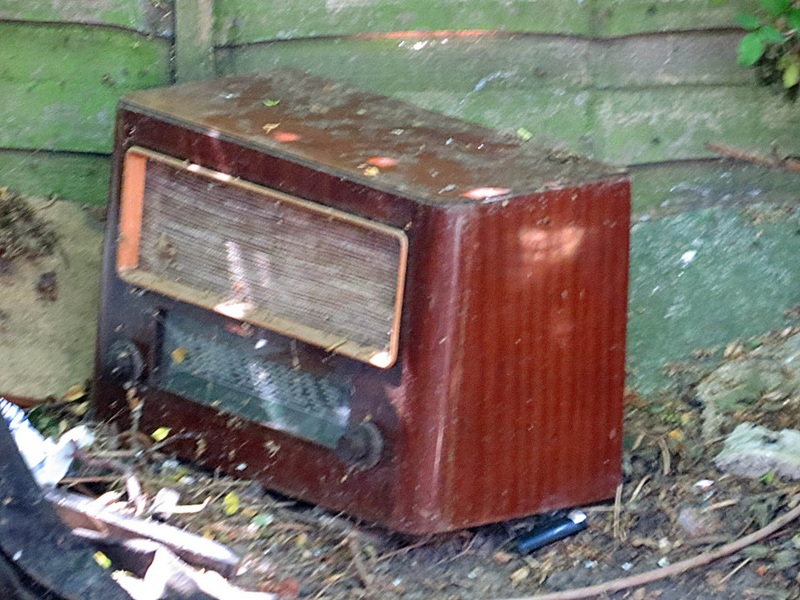 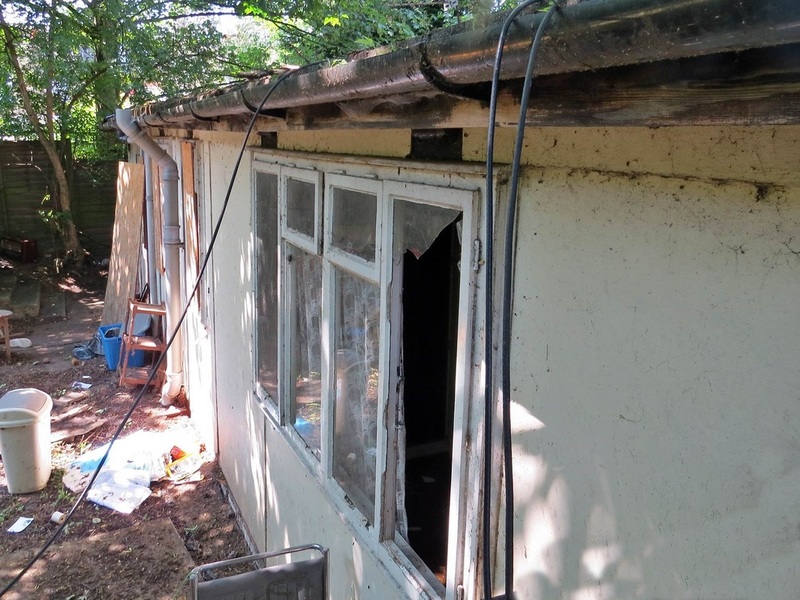 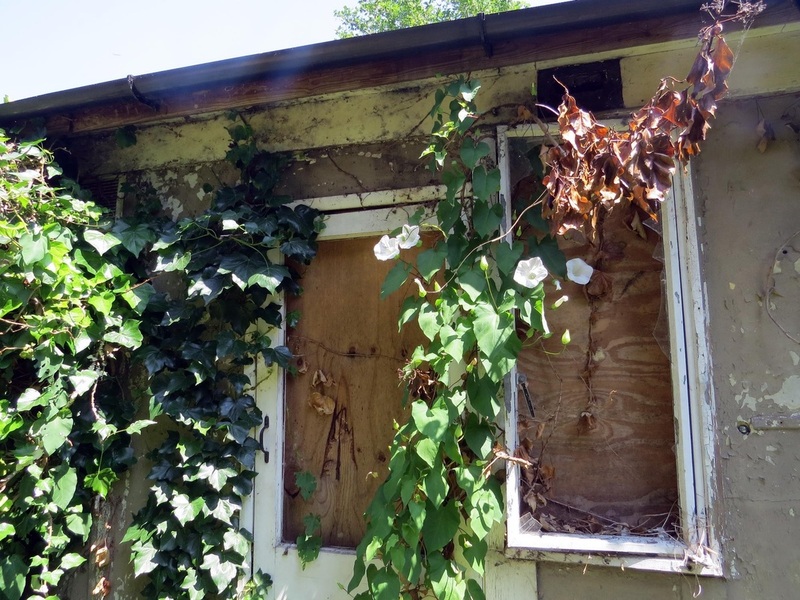 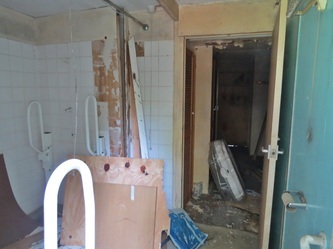 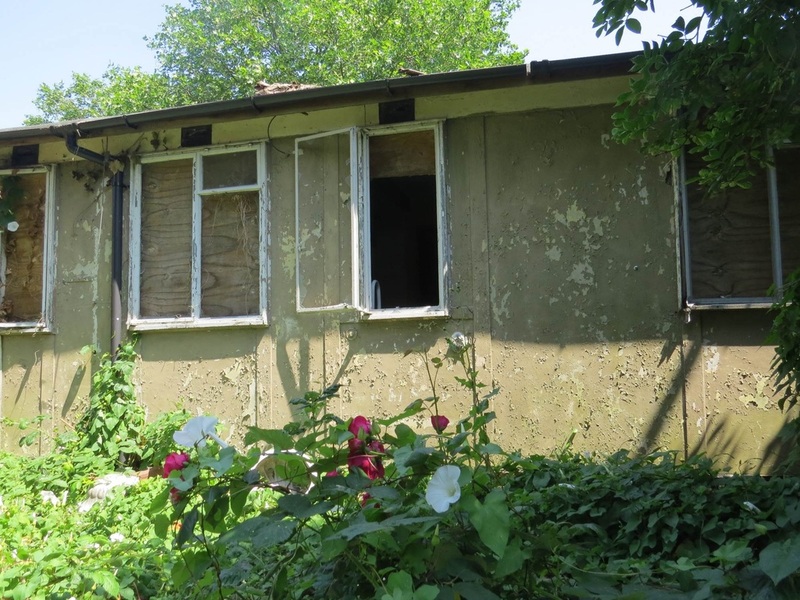 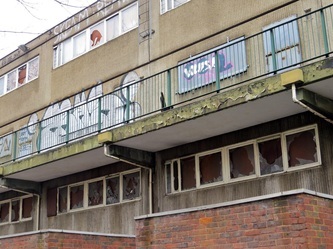 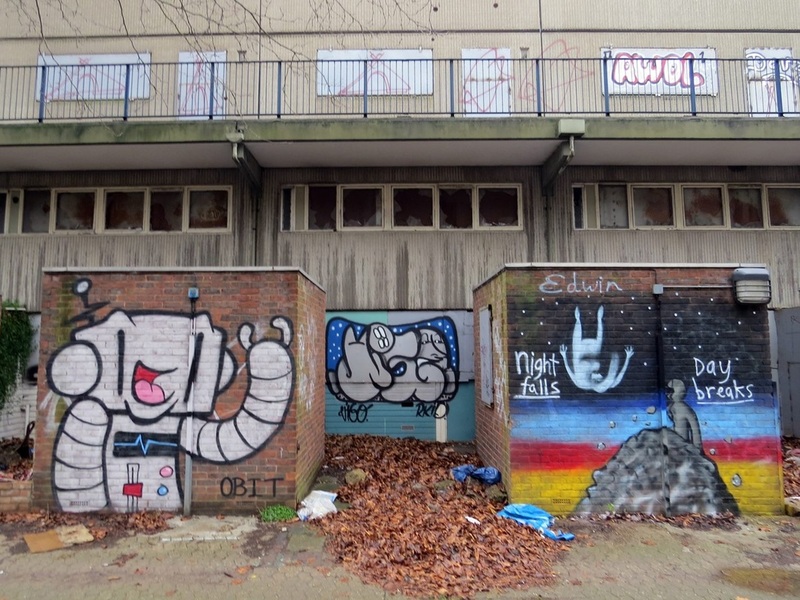 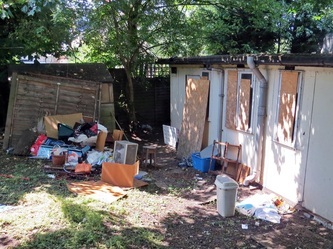 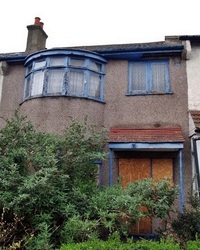 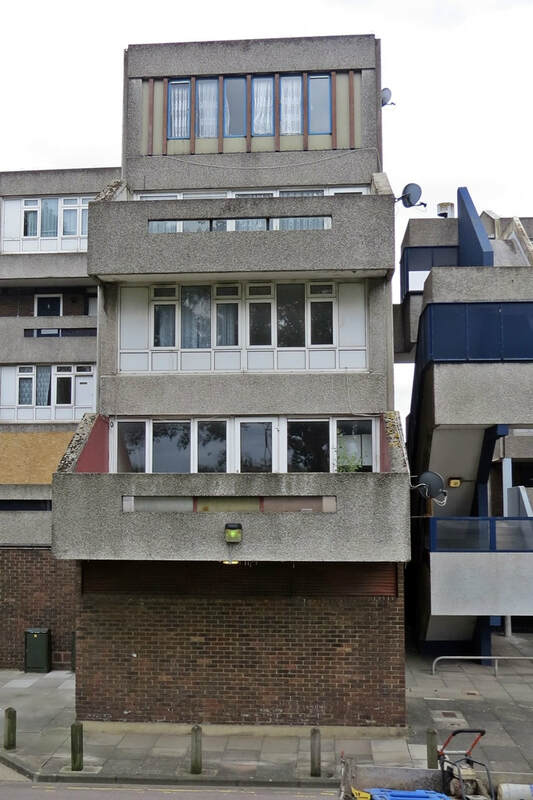 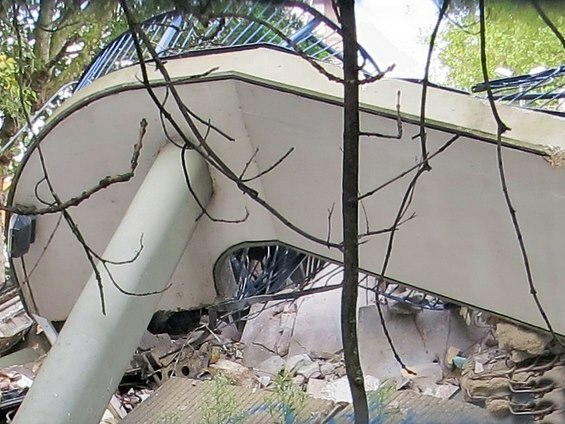 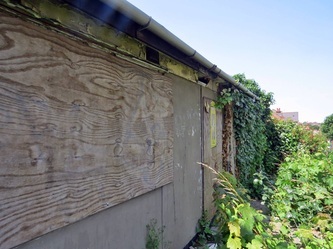 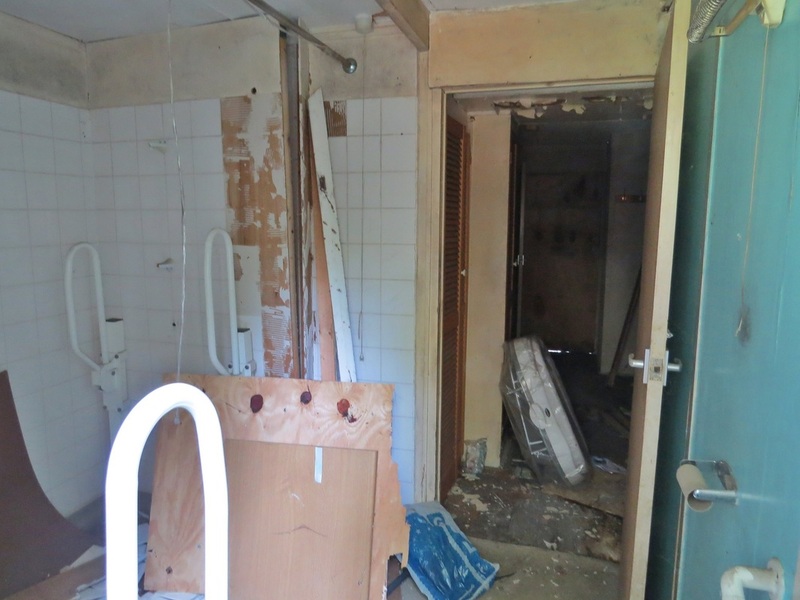 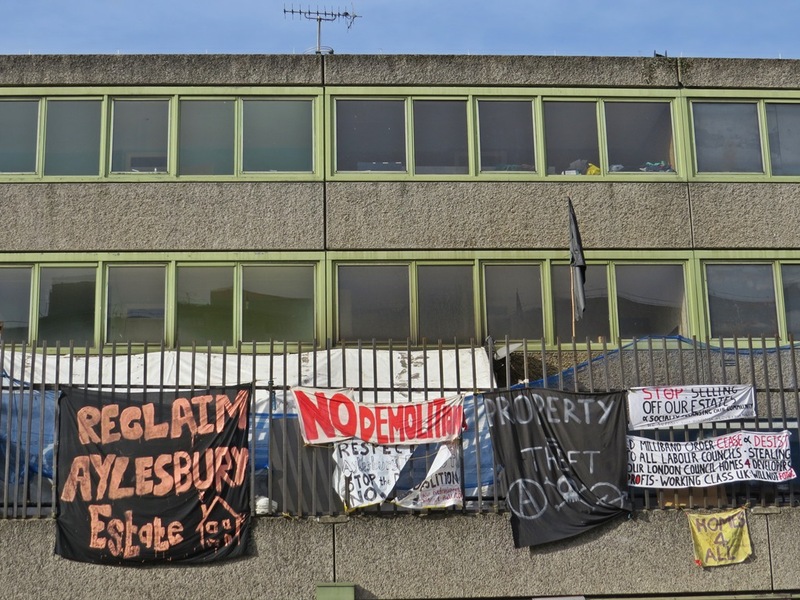 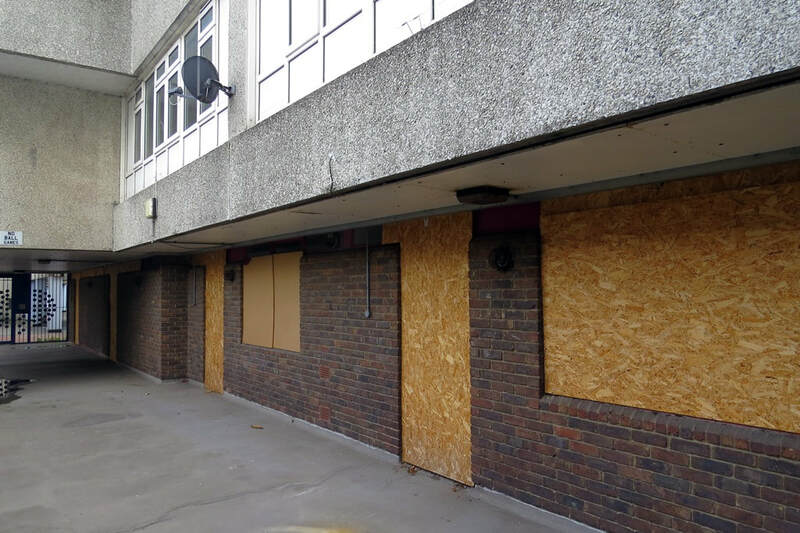 For further reading see this article in the News Shopper: "Catford Excalibur tenants accuse Lewisham Council of 'gestapo' tactics"
Below are some pictures of homes on the estate that are still currently occupied by residents. There are no amenities situated on the estate except for the church, St. Marks. 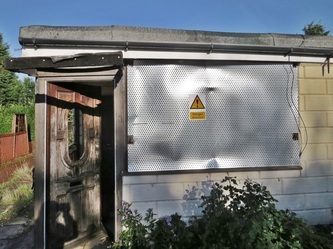 This building is also of a prefabricated construction but, unlike the flat-roofed houses, has a sheet-metal barrelled roof. The church will not be demolished. 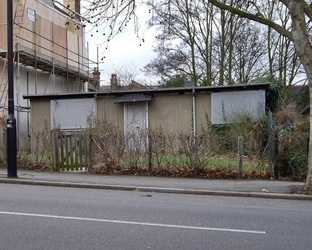 Three prefab bungalows were built on the site of a doctor's house that was bombed during in 1944 by a German V1 rocket causing devastation to the area (It demolished 20 houses in Lordship lane and damaged 130 others in Lordship Lane and adjacent roads.1 person was killed). 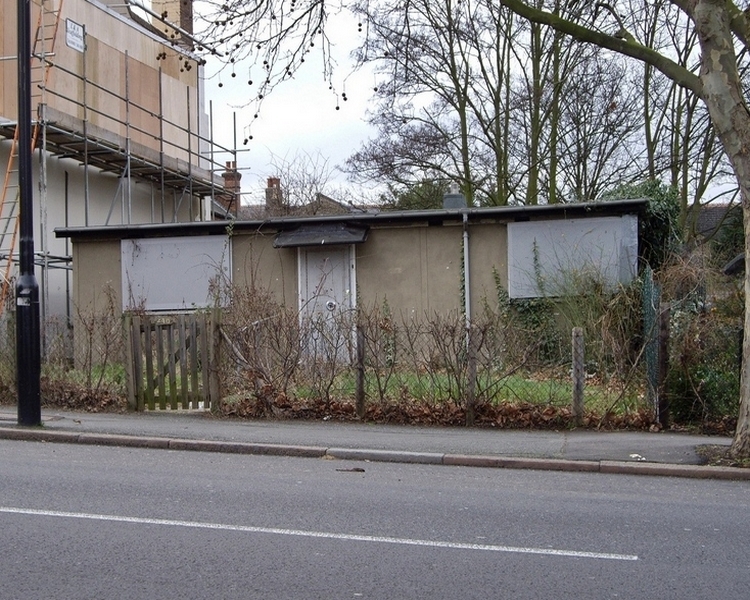 Francis Rossi lived in a prefab in nearby Underhill Rd in East Dulwich in the mid 1960s prior to the success of Status Quo and Michael Caine was brought up in a a prefab in Elephant & Castle. One of these East Dulwich prefabs is still lived in (with its well maintained garden) and is privately owned but the one next door and one to the rear are derelict and until recently were owned by Southwark Council who have now sold them to a private developer who has applied for planning permission on the site to squeeze in 2 sets of flats, each set containing 2 three bedroom flats, 2 two bedroom flats, and 2 single bedroom flats and a house! All while keeping the remaining bungalow. 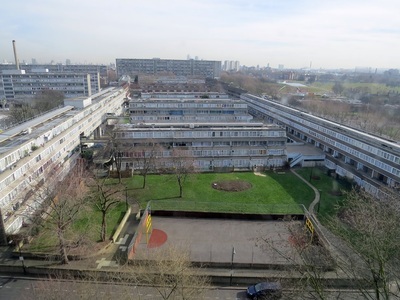 The Aylesbury Estate built between 1963 and 1977 contains over 2,700 dwellings with approx 7500 residents spread over a number of different blocks and buildings. 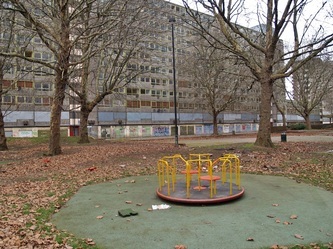 Tony Blair made his first speech as Prime Minister here, in an effort to demonstrate that the government would care for the poorest elements of society. The estate is currently undergoing a major £1.5 billion regeneration project. 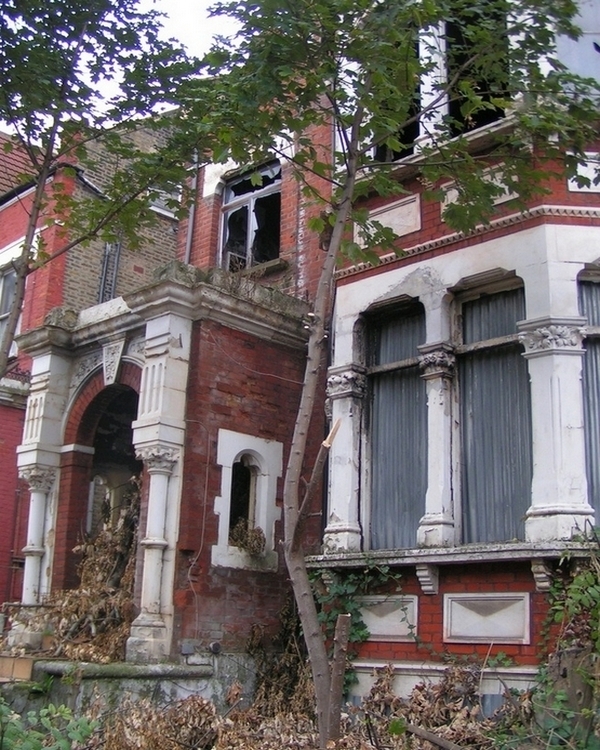 Demolition and rebuilding has been divided into several phases over 20 years.